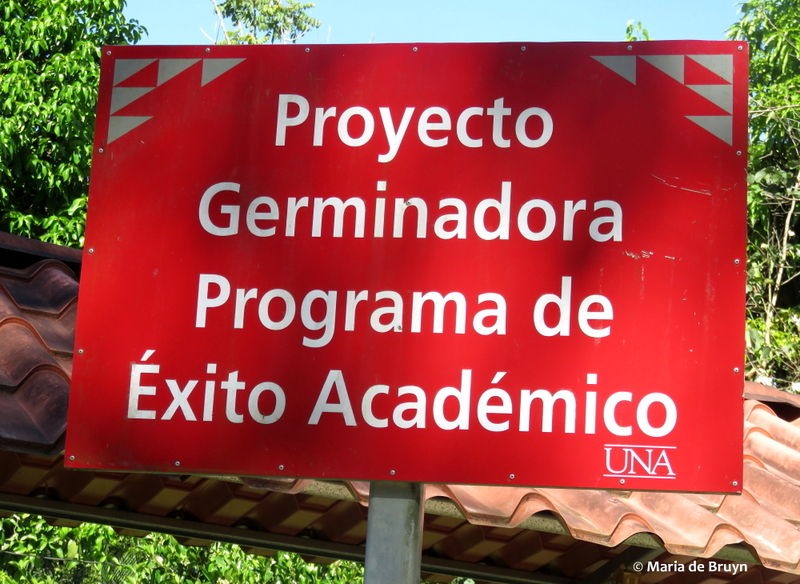 After fully experiencing the “honey dew” (another name for cicada urine), we set off for the next university site, an area where students learn about planting. 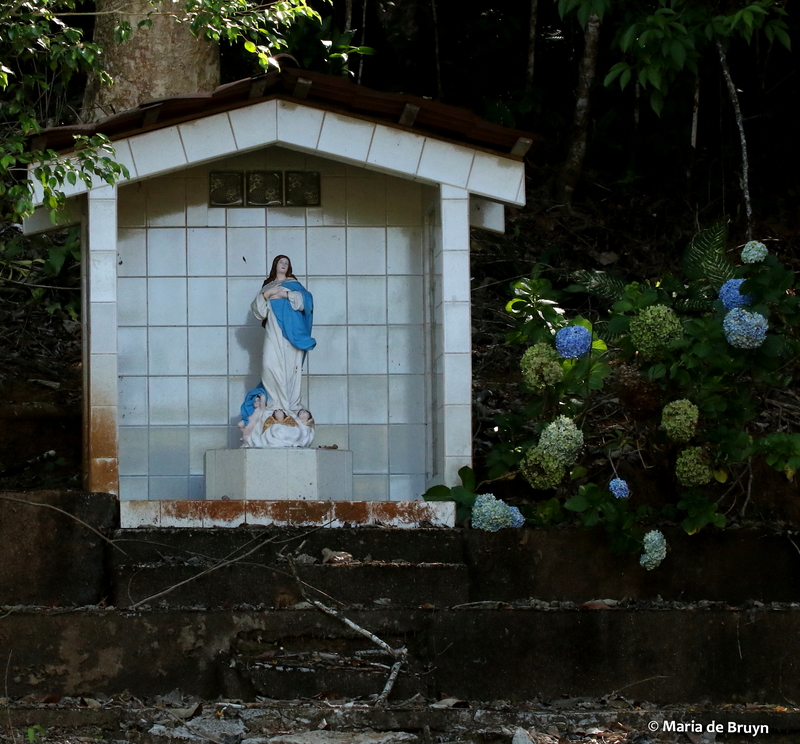 A statue of the Virgin Mary welcomed visitors and we admired some of the beautiful plantings and their seeds that were attracting plenty of insects. 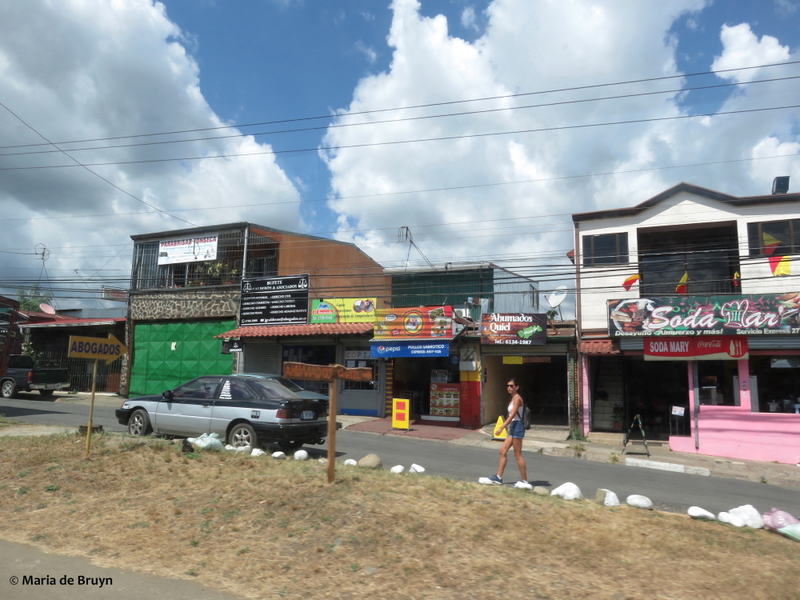 We then left to make a quick stop at a park called Los Cusingos, that we would visit at length later; this was just a quick bathroom break before we took to the road again. 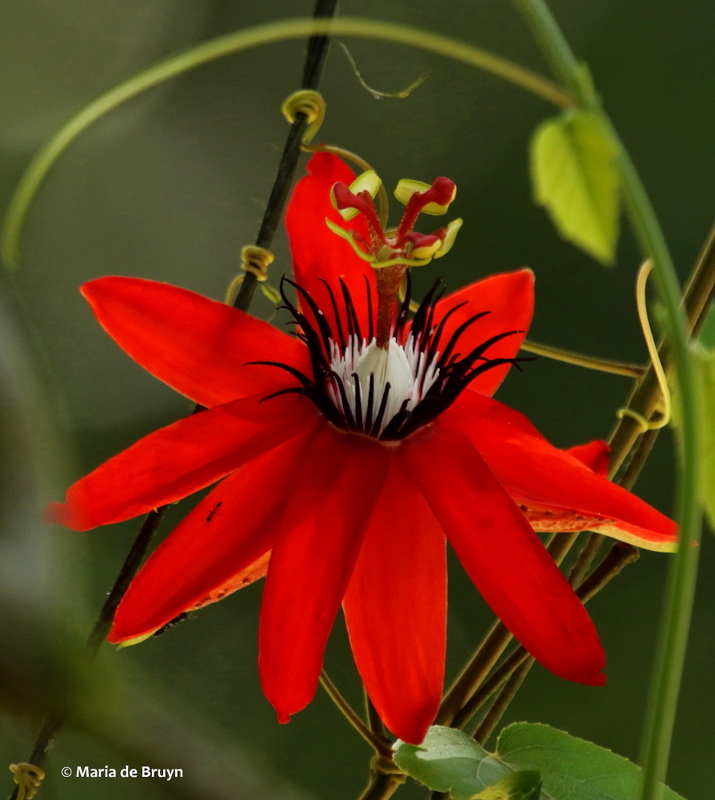 My photo of the gray-headed tanager was not that great but you can see how beautiful the red passionflower (Passiflora vitifolia) at the entrance was. 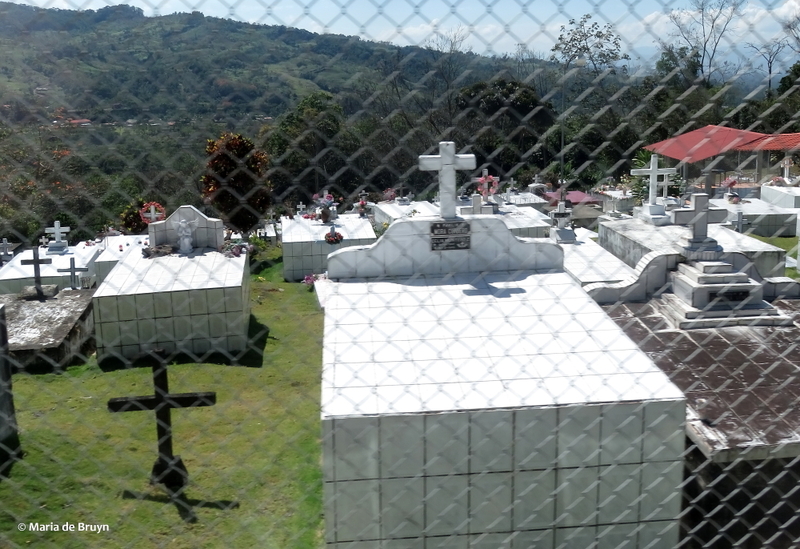 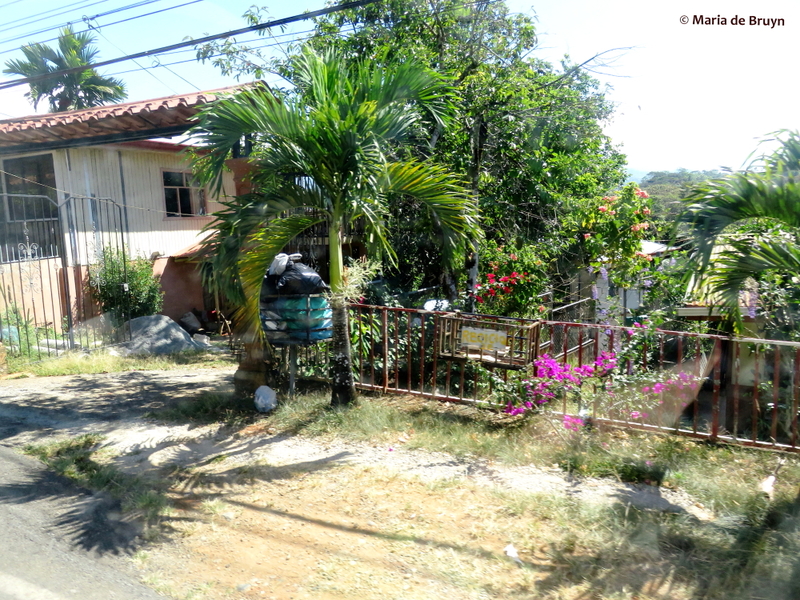 As we drove to a place called Las Nubes, we passed private homes with their filled metal framework trash bins in front, a cemetery and plenty of banana plants. 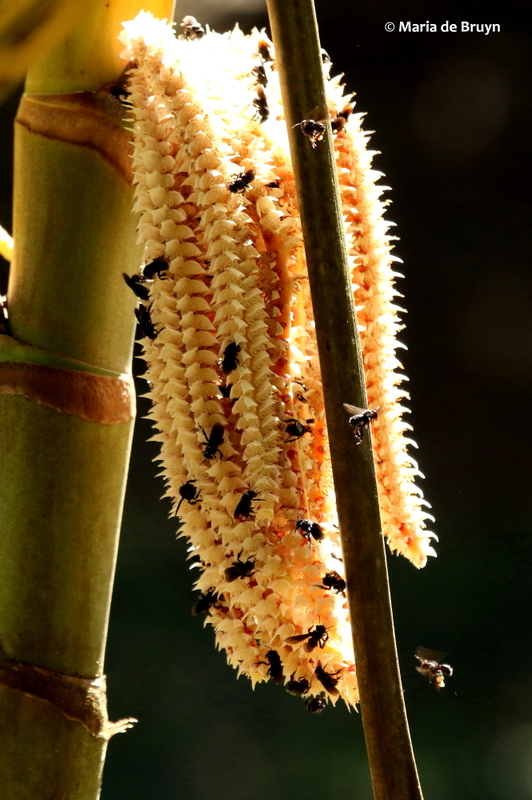 One of our group members stepped in an anthill when trying to avoid puddles and traffic, which led to some stinging bites. 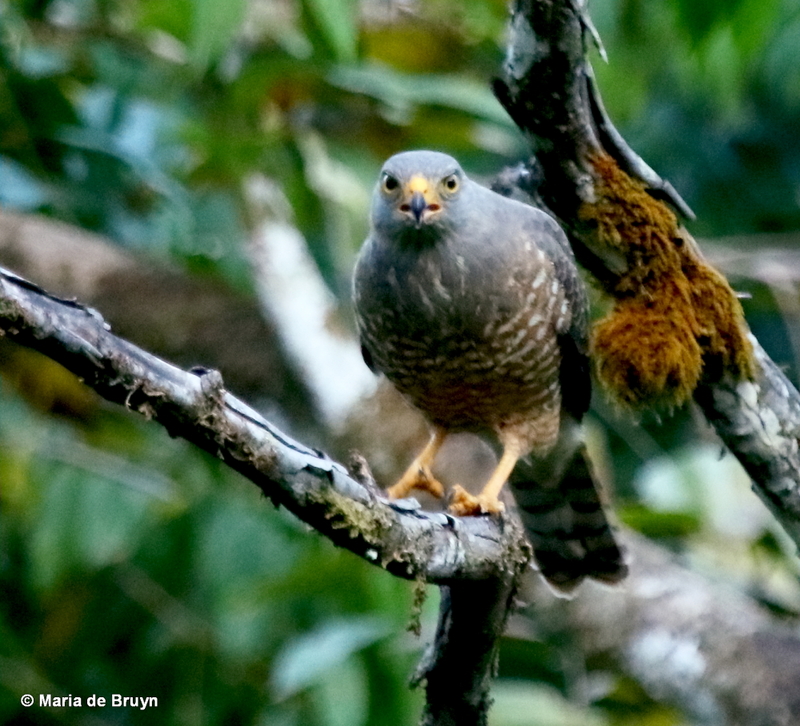 In the meantime, others were trying to see various species of birds that were staying low in the vegetation along the road. 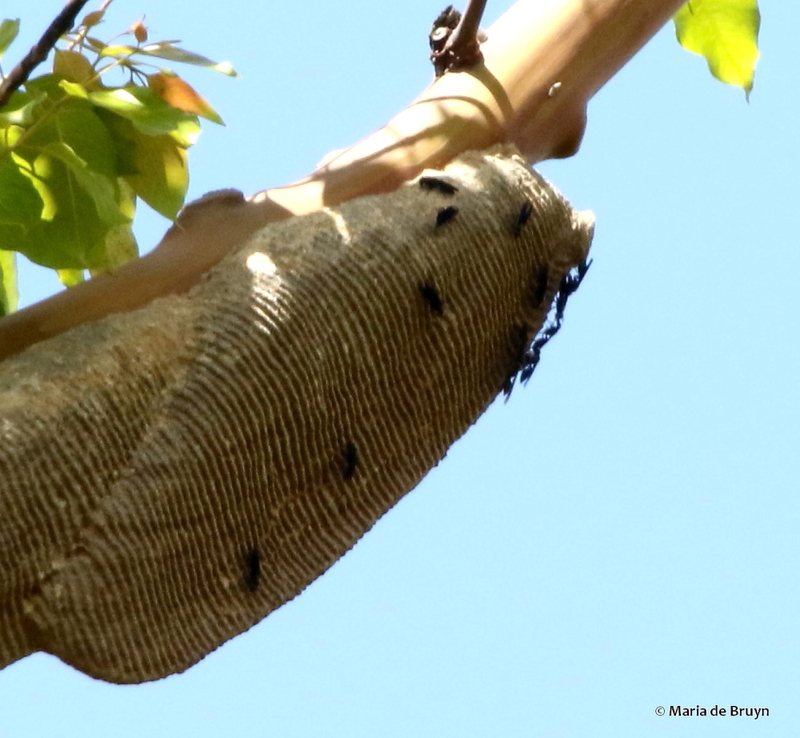 I spotted a rather large wasp nest in a nearby tree, likely of the Synoeca septentrionalis species. 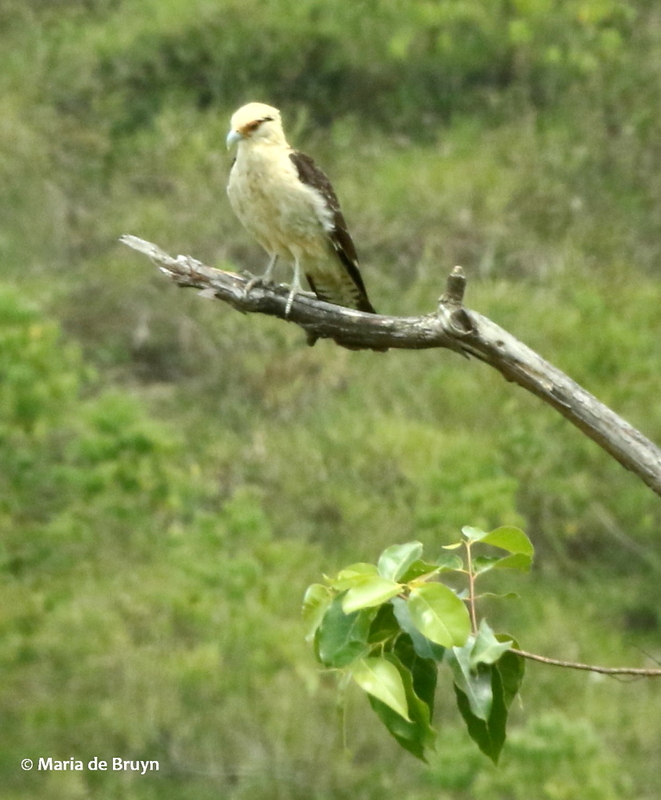 At some distance, there was a yellow-headed caracara (Milvago chimachima) sitting on a branch. 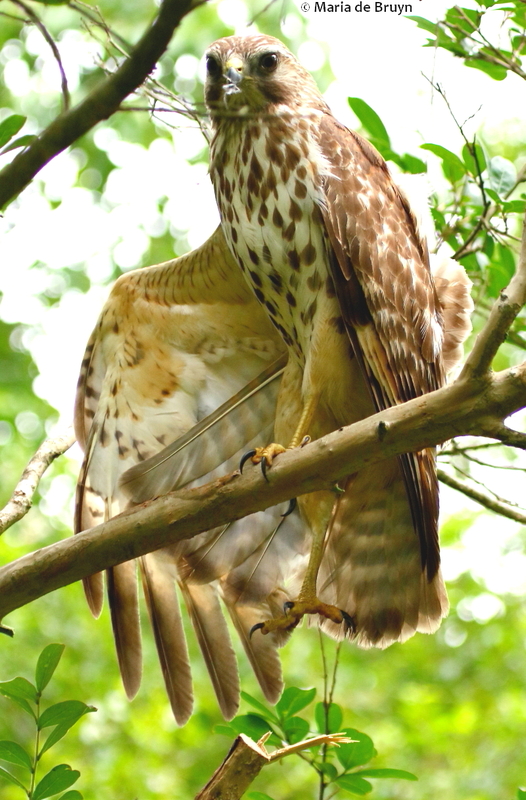 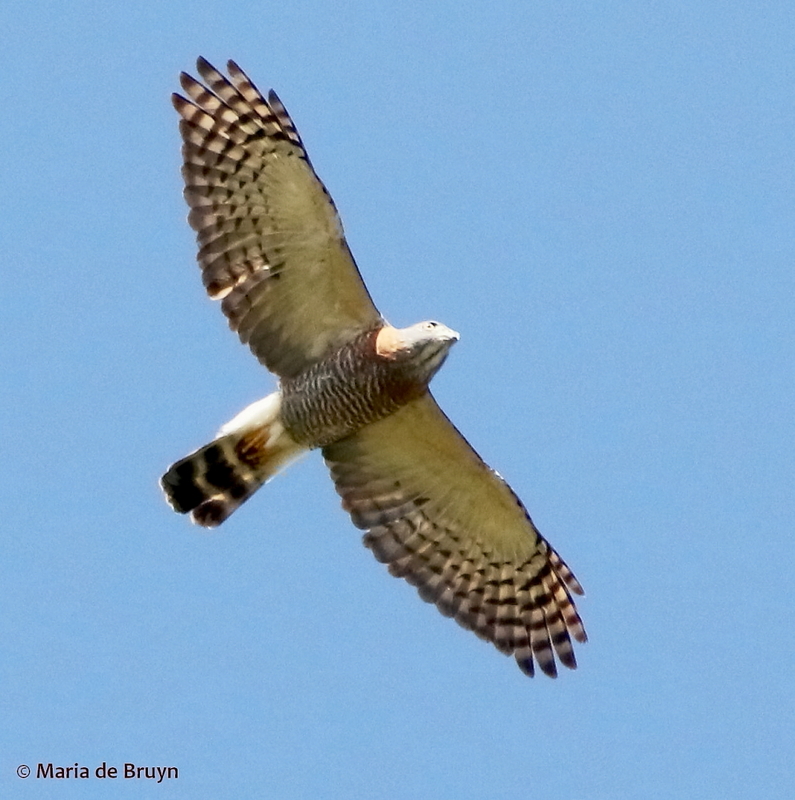 These raptors are about 16-18 inches in length (41-46 cm) and part of their diet is carrion. 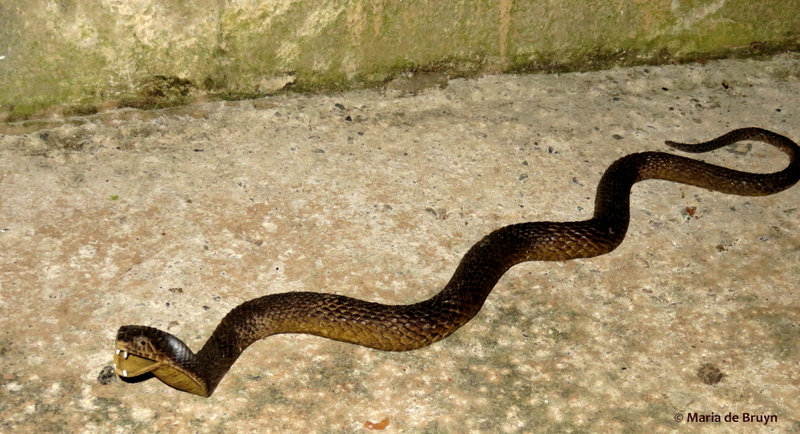 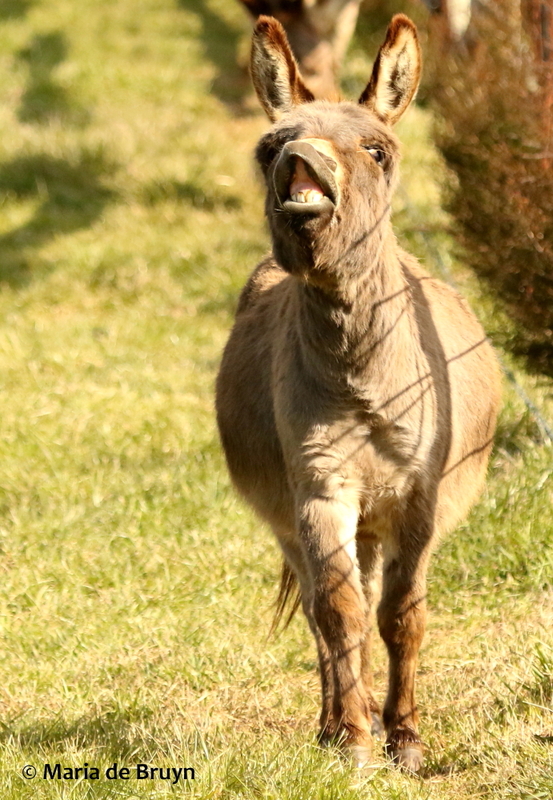 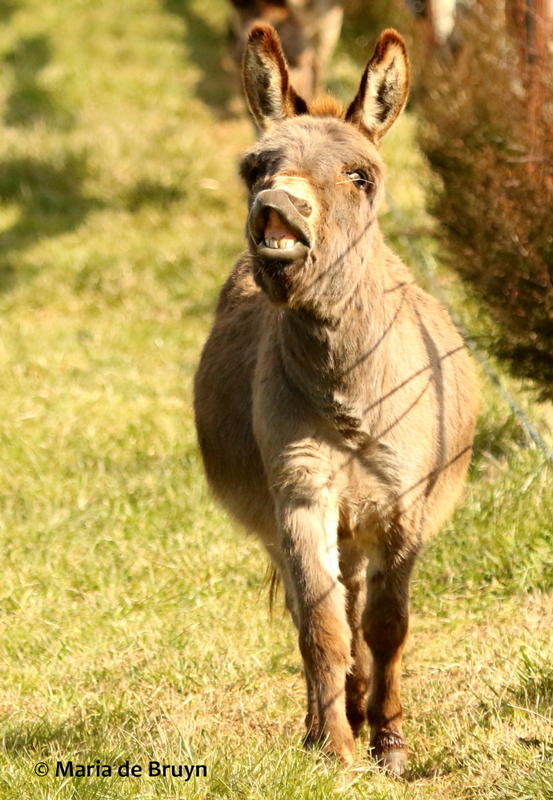 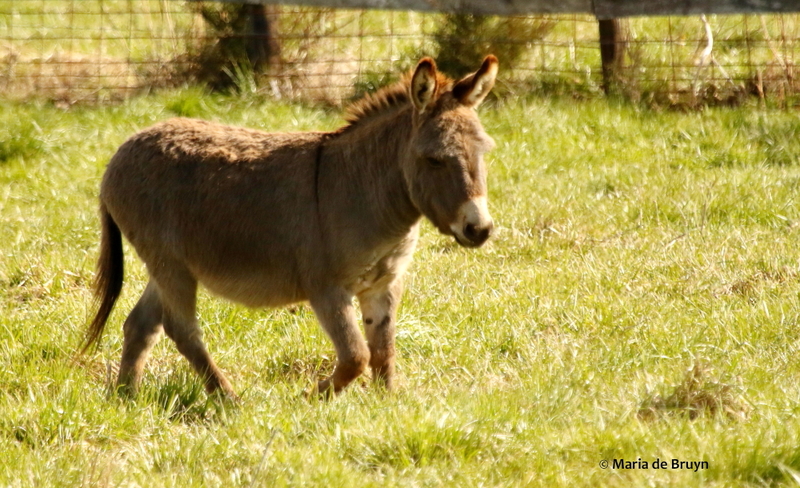 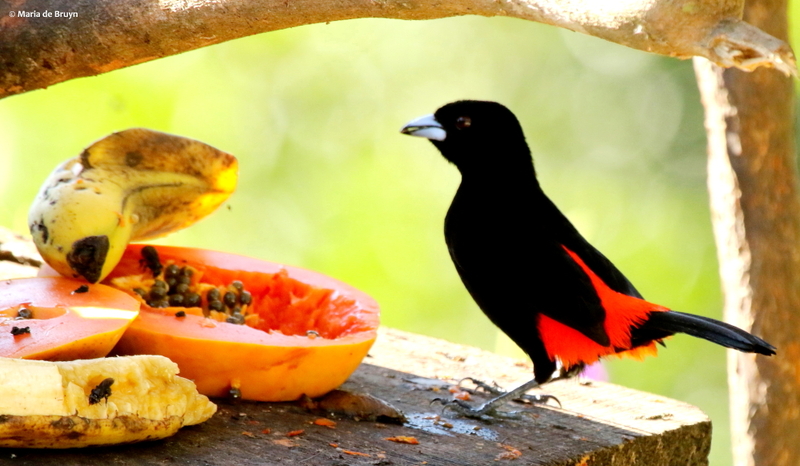 They also eat reptiles, amphibians and other small birds, while avoiding birds as food. 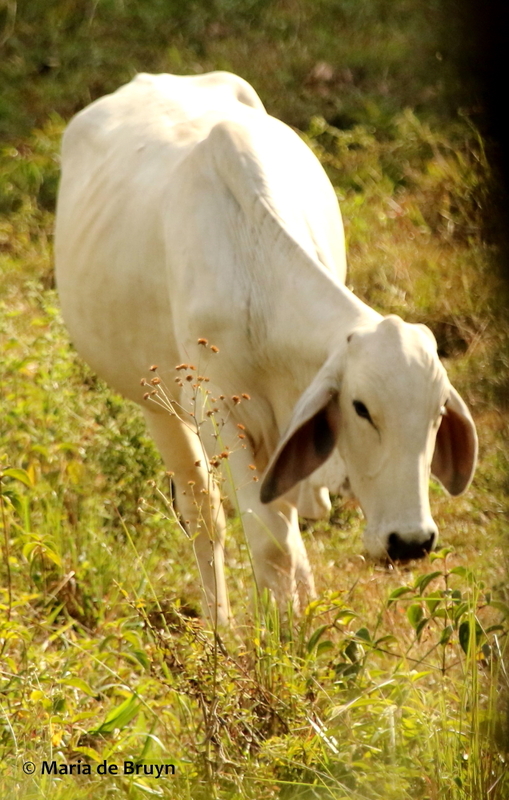 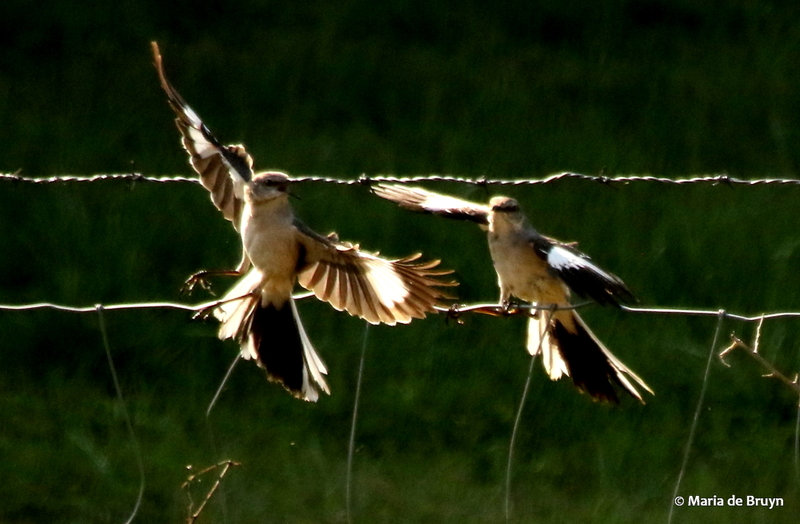 They take ticks off cattle as well, which gives them a thumbs up from me – any bird that eats ticks is a friend. 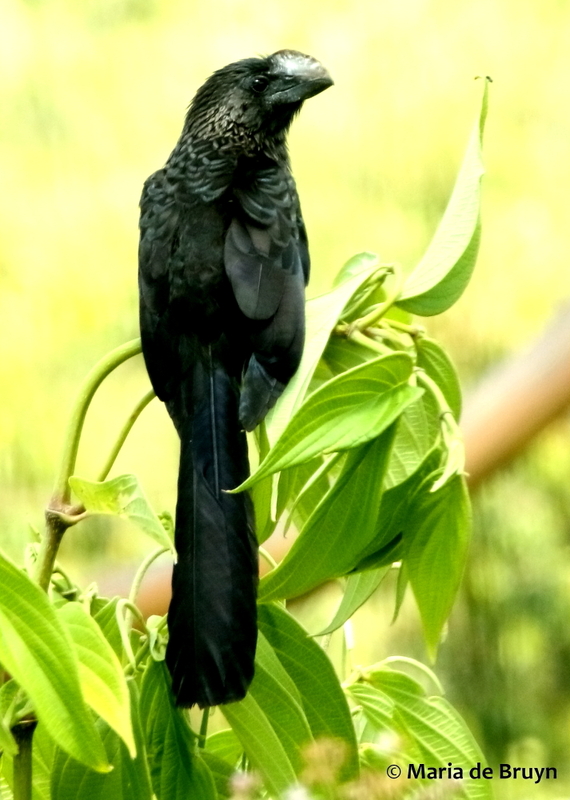 A gorgeous smooth-billed ani (Crotophaga ani) was sitting calmly as we milled around in the road. 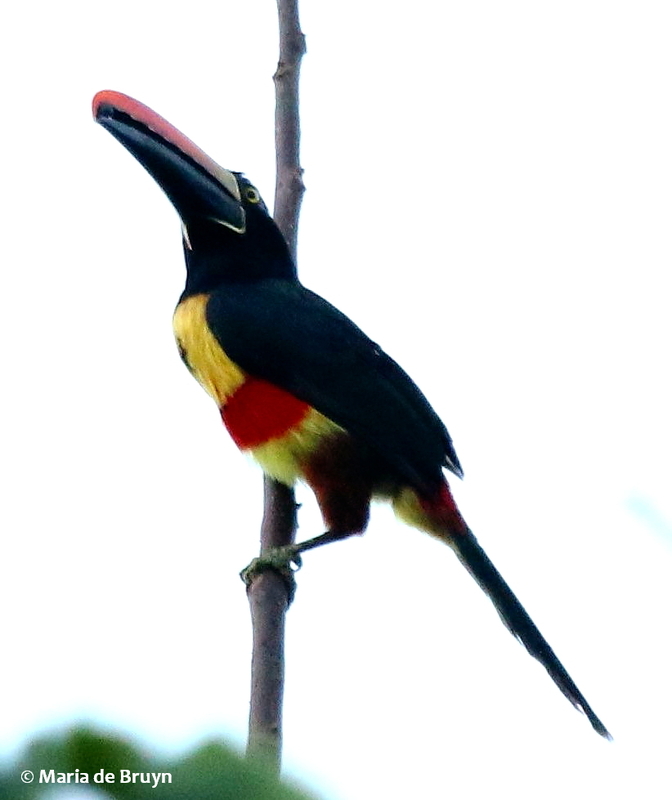 Some people might find this bird homely, but I think it is quite handsome despite a somewhat bulbous beak. 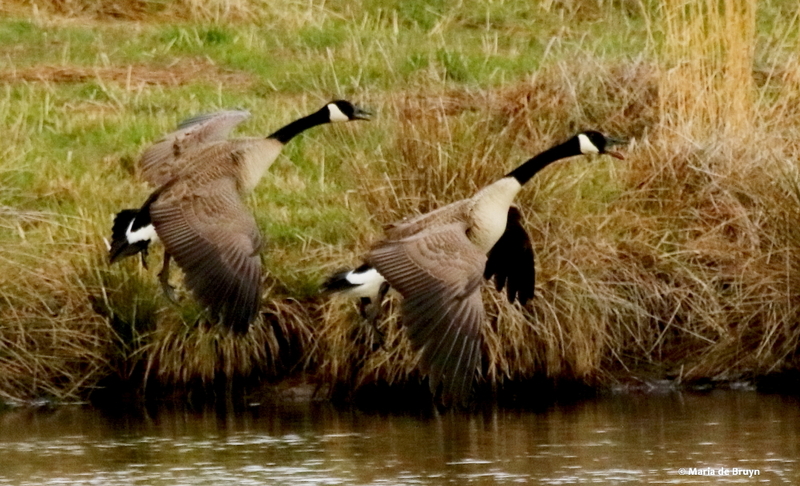 They, too, are on my “good birds” list as they sometimes eat ticks and other parasites off of grazing animals. 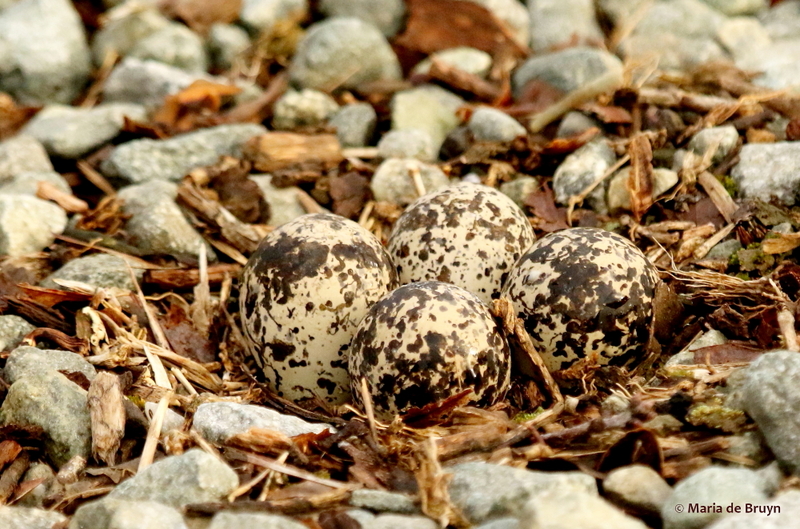 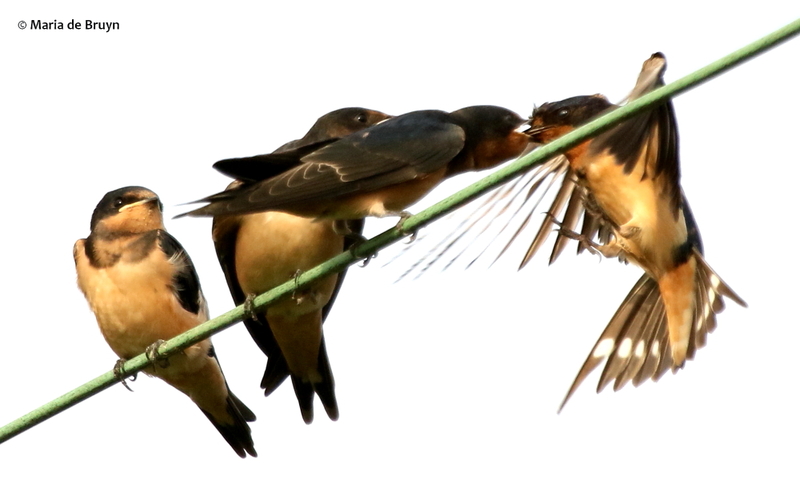 Another nice characteristic is their communal child-raising strategy – several pairs cooperate to build a nest together, in which several females than lay their eggs. 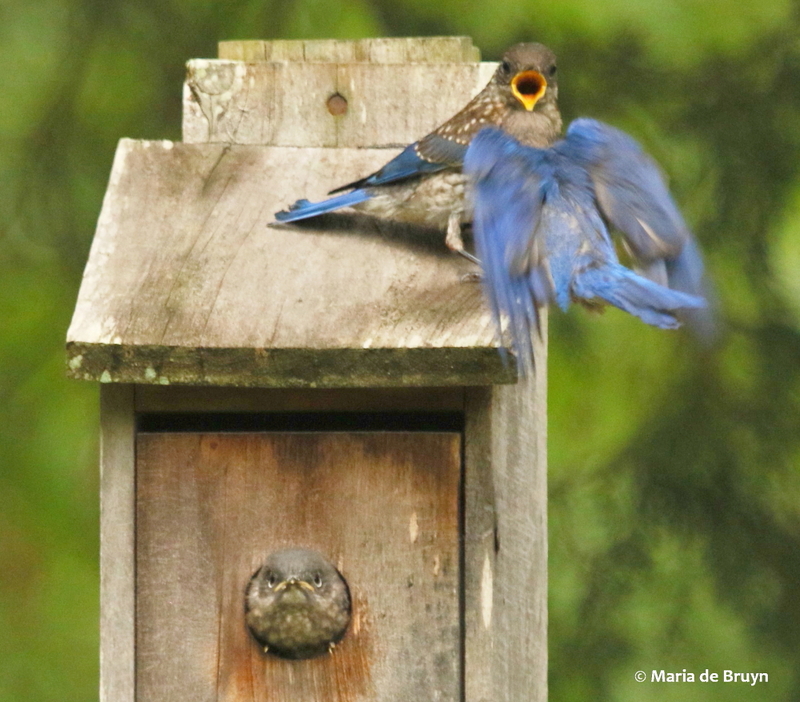 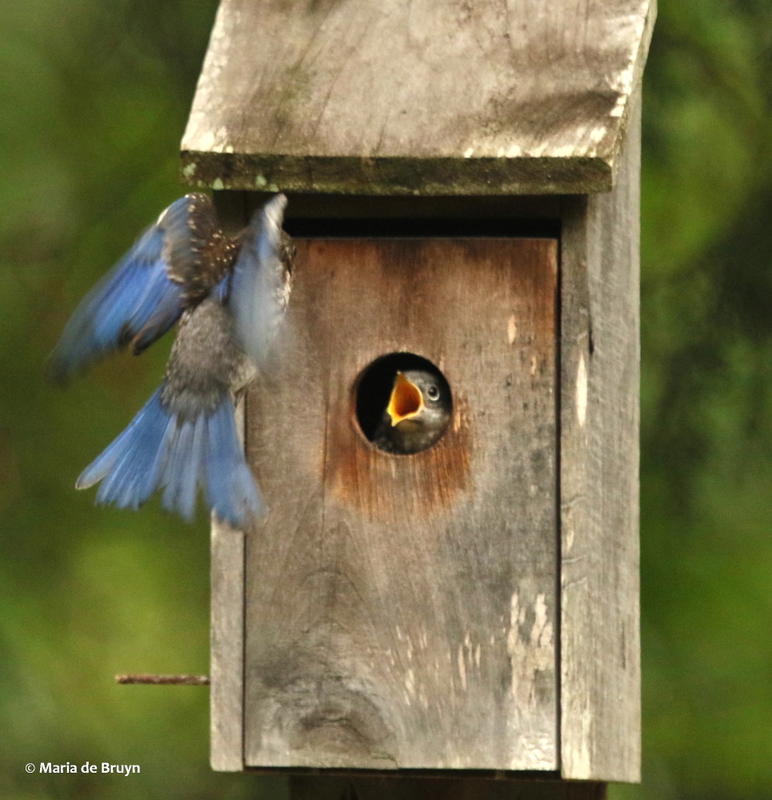 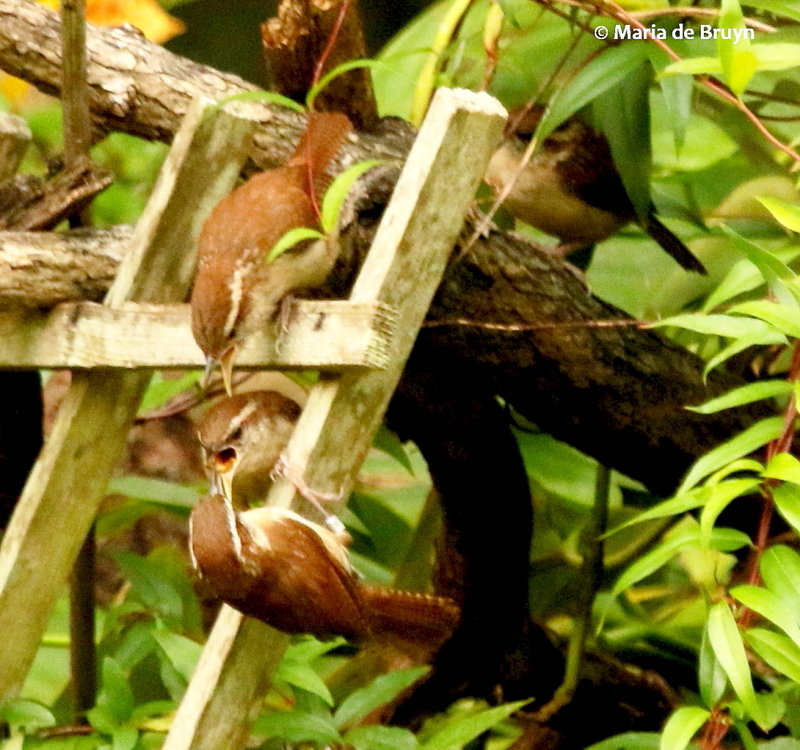 They share the incubation and feeding of nestlings – hippies of the bird world! 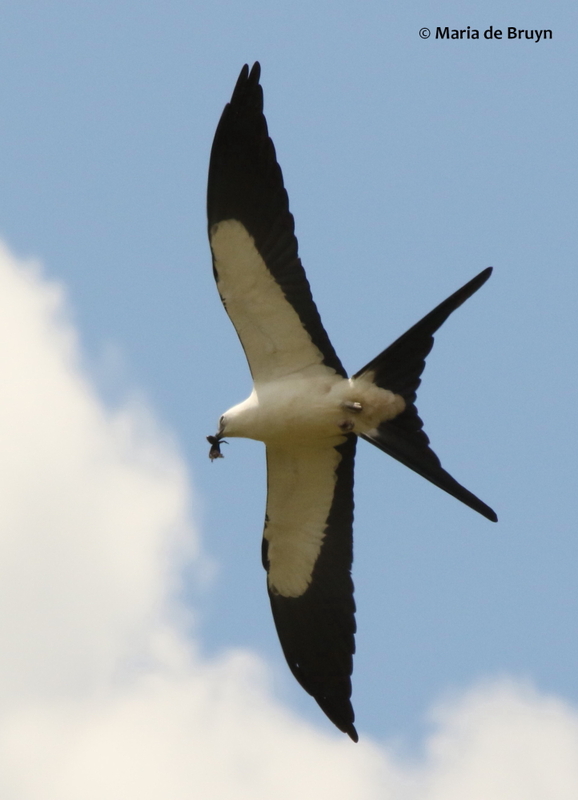 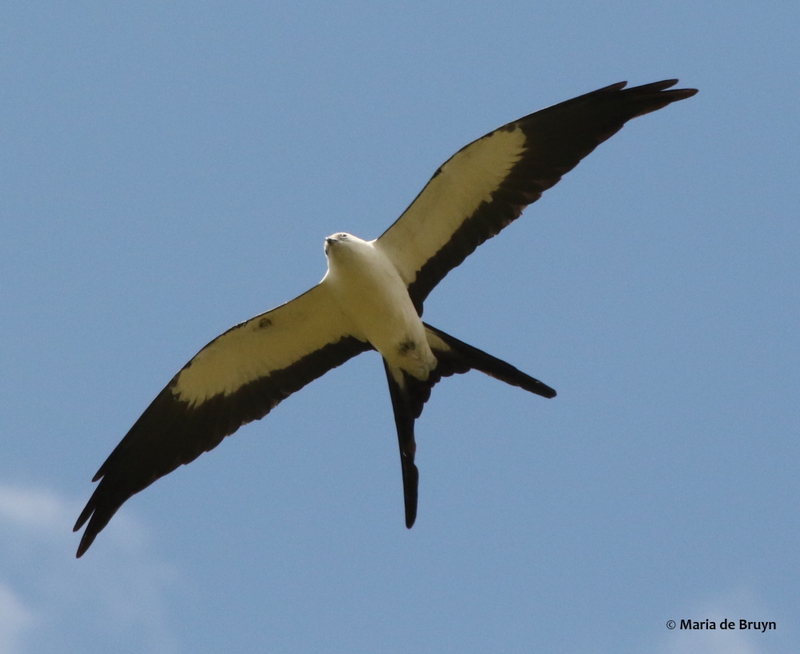 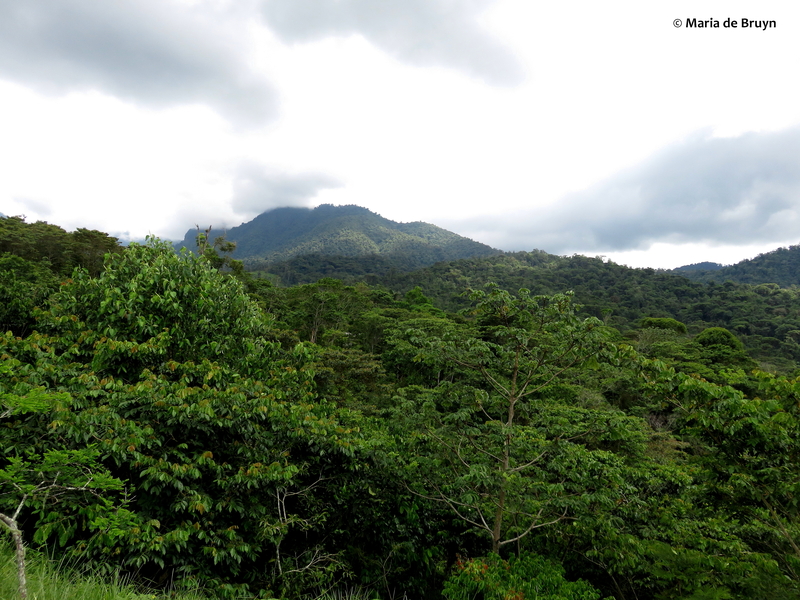 We traveled on and the views along the road were beautiful, with the mountains and valleys in the distance and then we caught sight of some swallow-tailed kites (Elanoides forficatus) soaring over the nearest valley. 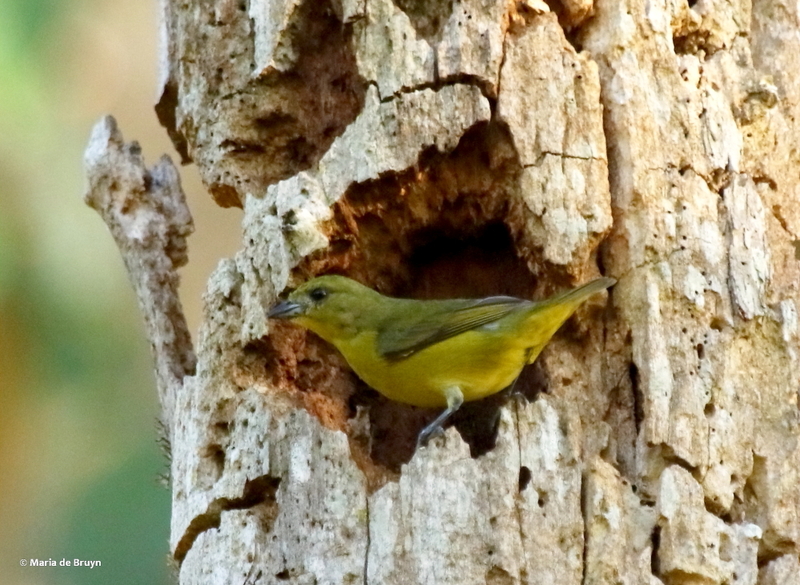 We saw one land in a tree and it turned out that they were building a nest there. 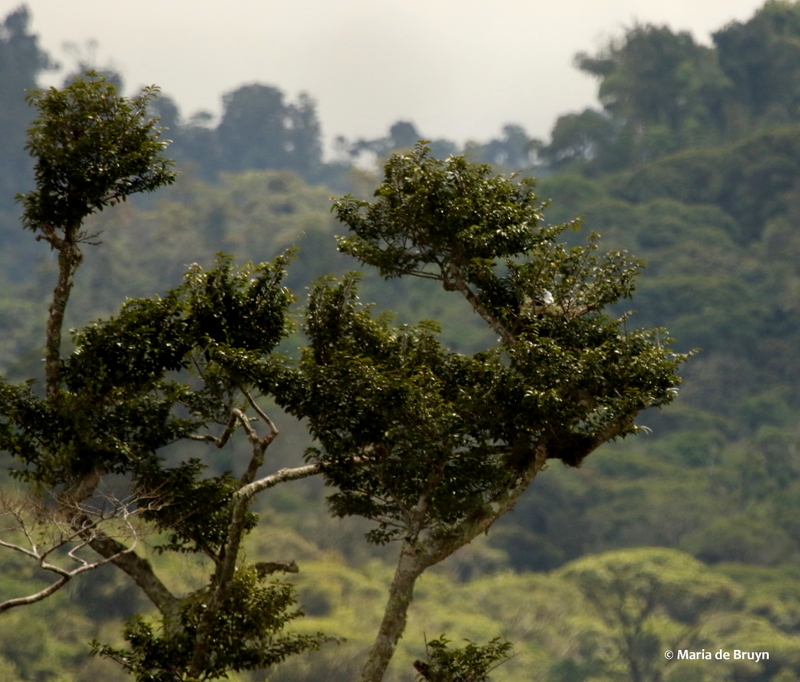 In the photo, you can see a small white patch on the right-hand side of the tree, which is the female kite on the nest. 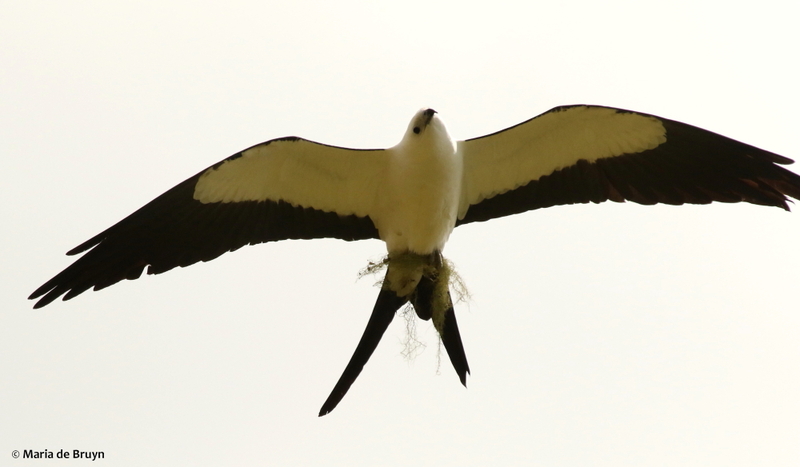 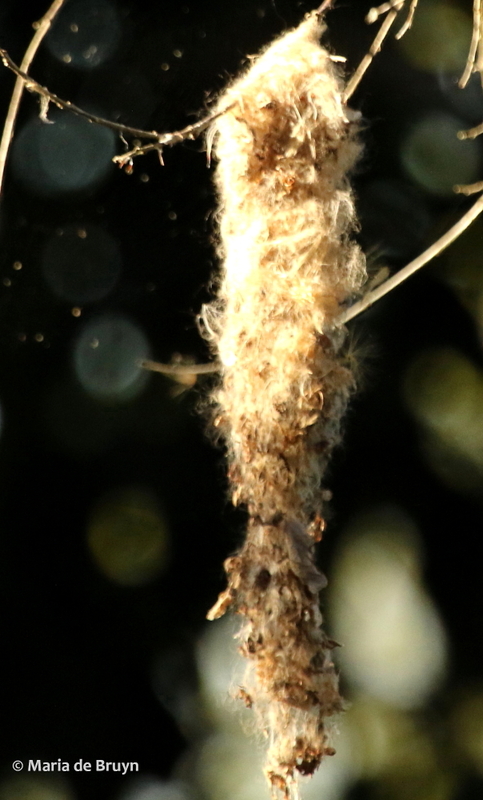 As we waited patiently, a few kites began flying overhead; one with nesting material clutched in its claws. 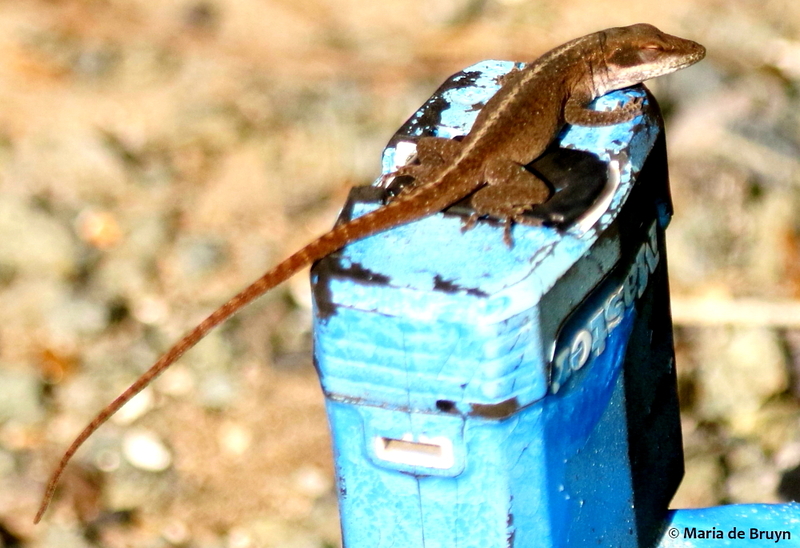 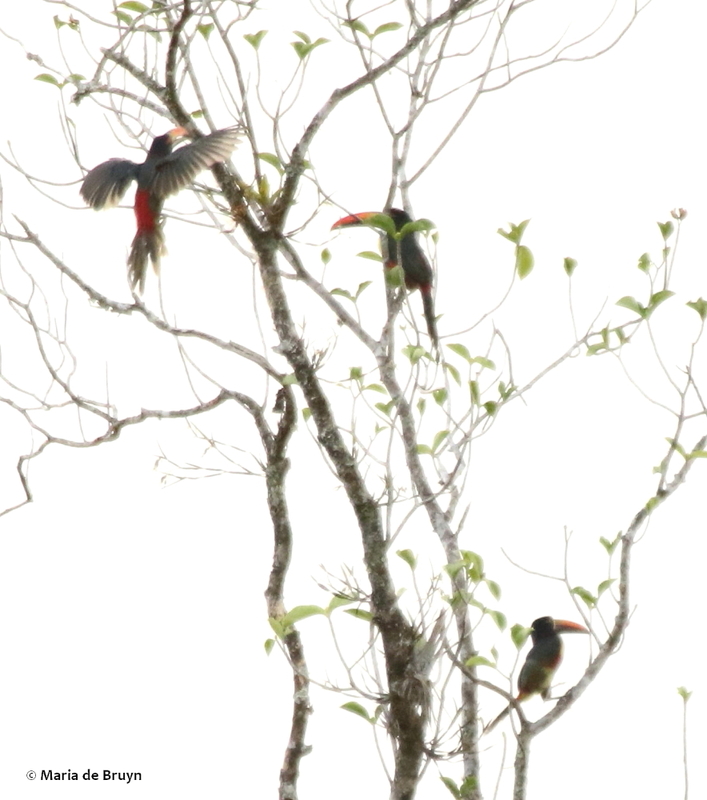 They soared and swooped, giving us delightful views of their flight and then one came by with a meal that it had caught – a poor little chameleon or lizard. 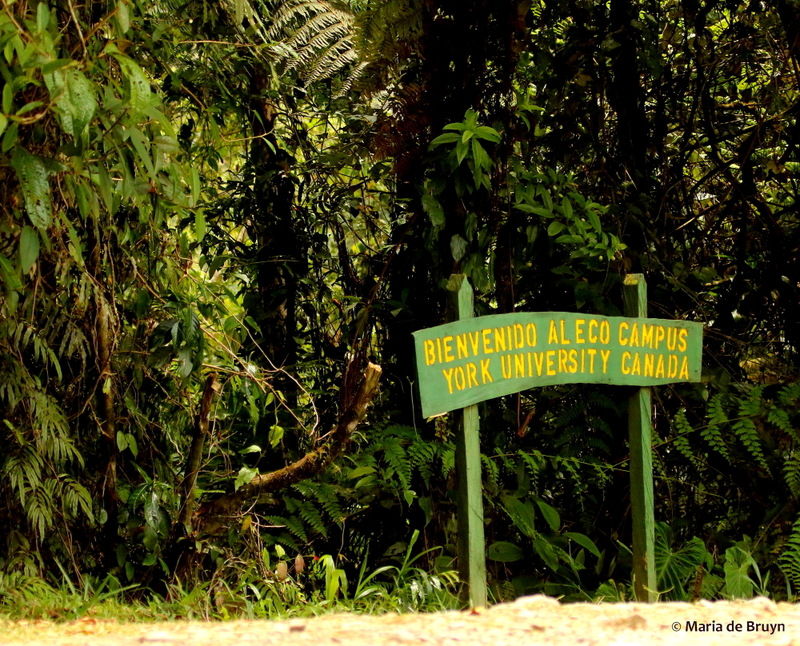 After a nice lunch, we continued visiting other sites, including one near a Canadian project. 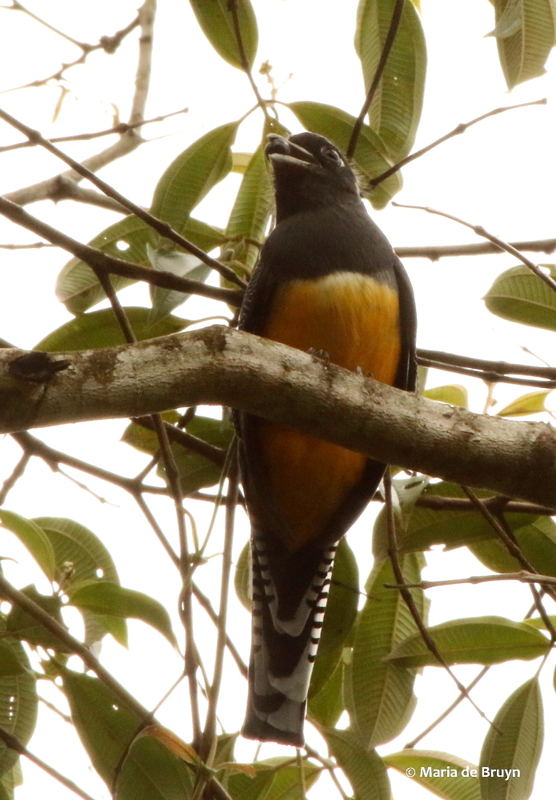 That afternoon, I saw my first trogon species – the gartered trogon (Trogon caligatus), another handsome bird to be sure. 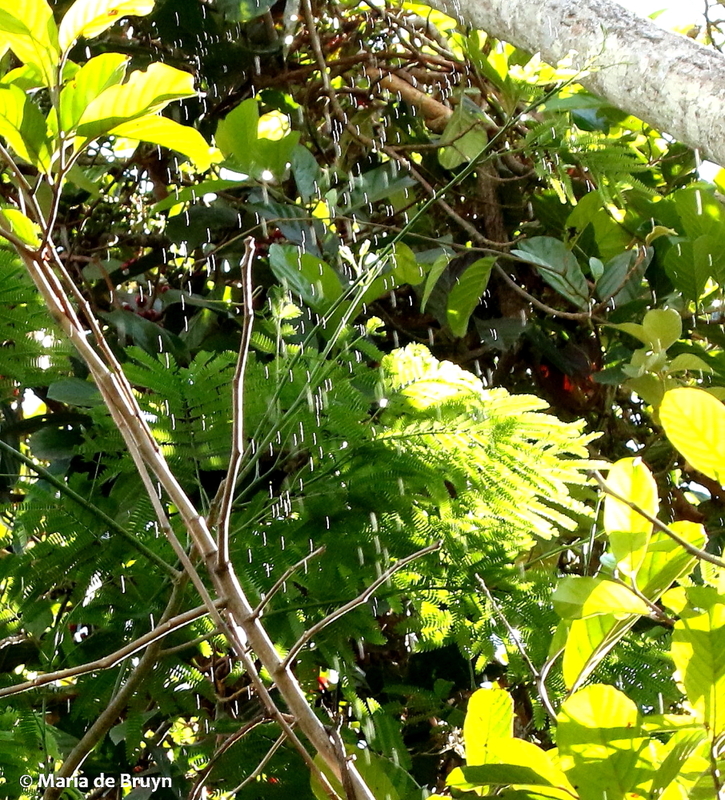 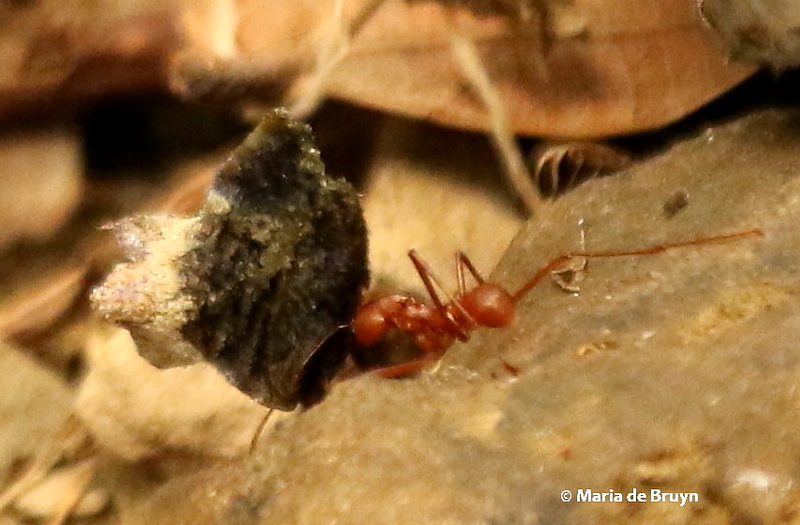 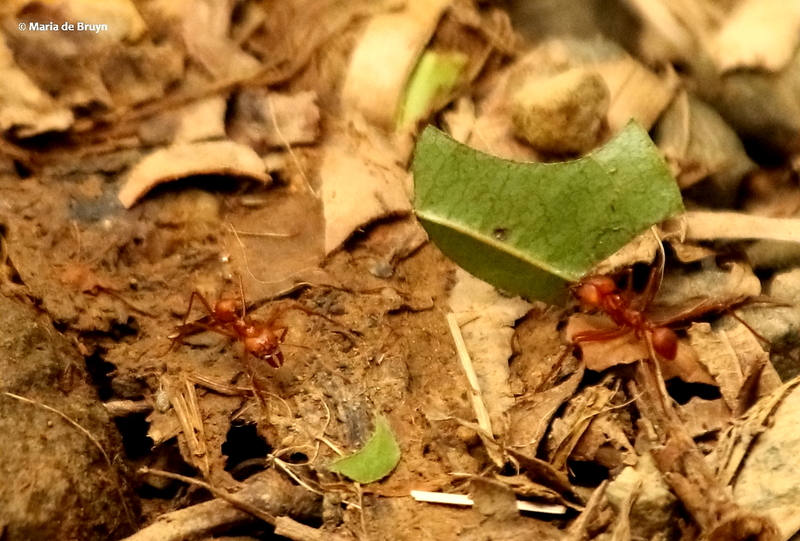 While the rest of the group followed Steve’s instructions for sighting some birds hiding in underbrush on a slope, fellow traveler Janet and I watched some leaf-cutter ants (Atta cephalotes) at their labors. 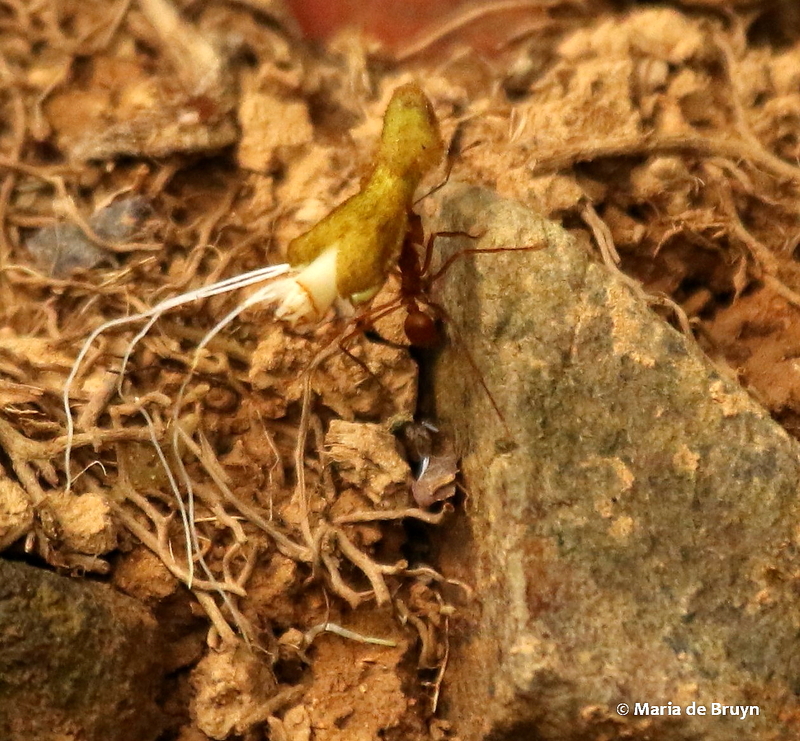 Sometimes, I was just not tall enough to see over shrubs to locate a bird and I love all wildlife anyway, so watching the ants in their industrious endeavor was fun. 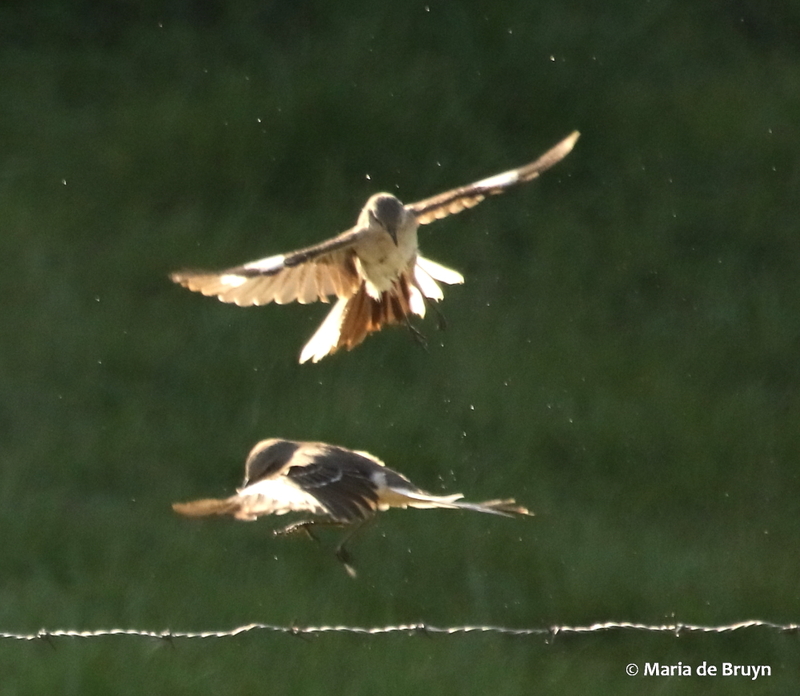 On our way back to the lodge for supper, we passed small roadside stores and Steve spotted a fork-tailed flycatcher (Tyrannus savanna) for us. 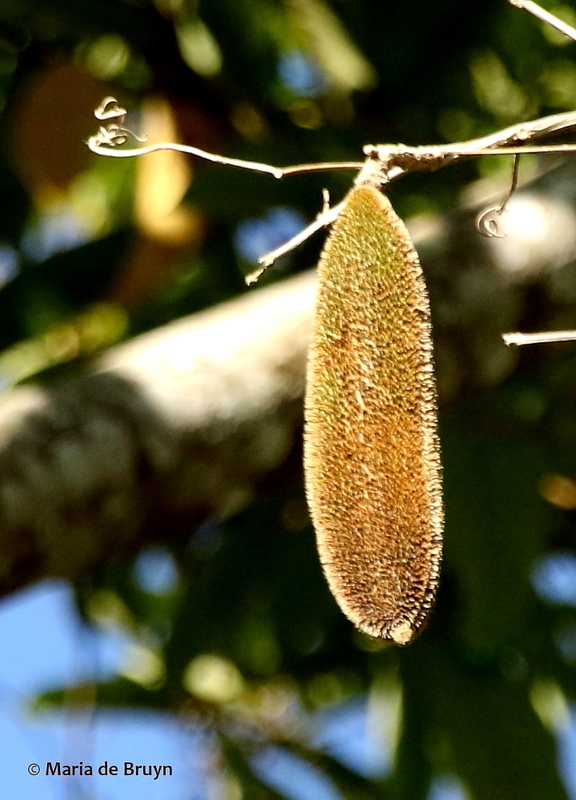 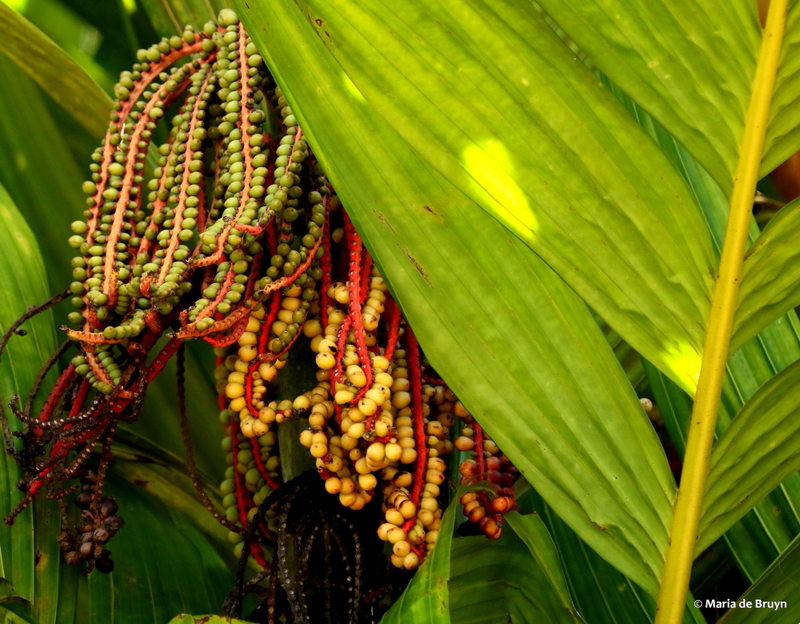 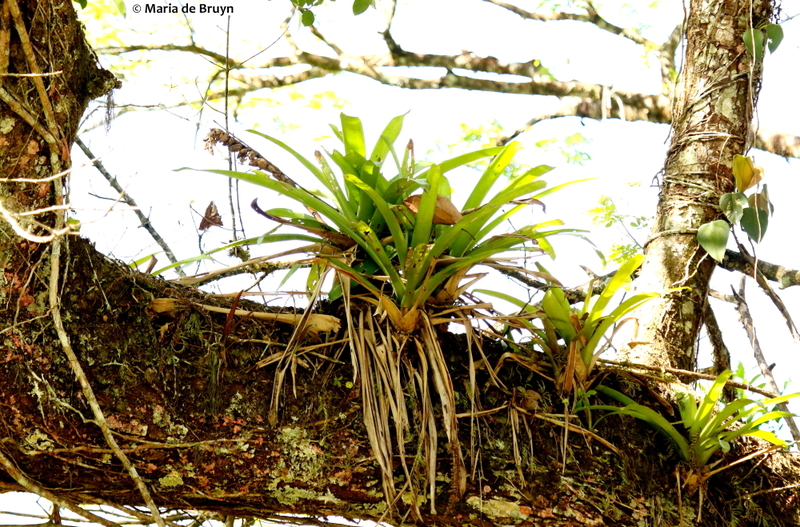 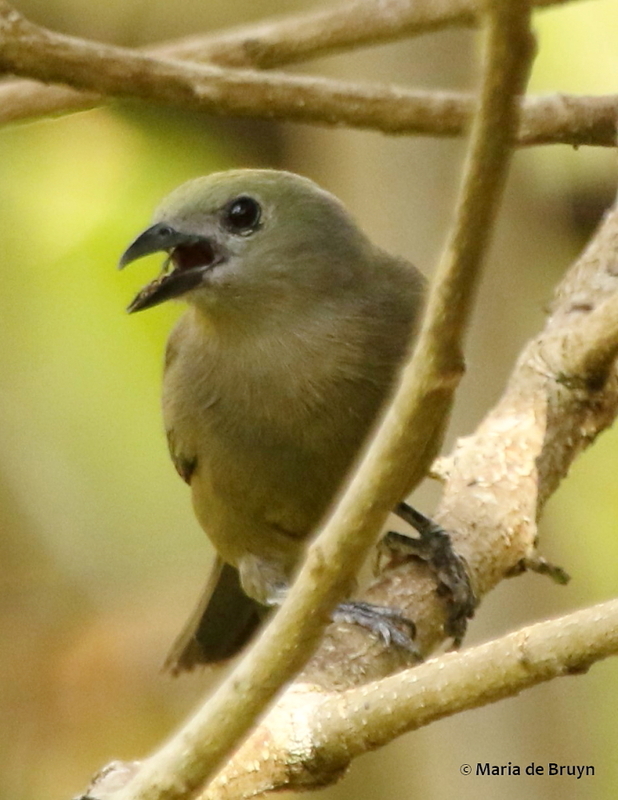 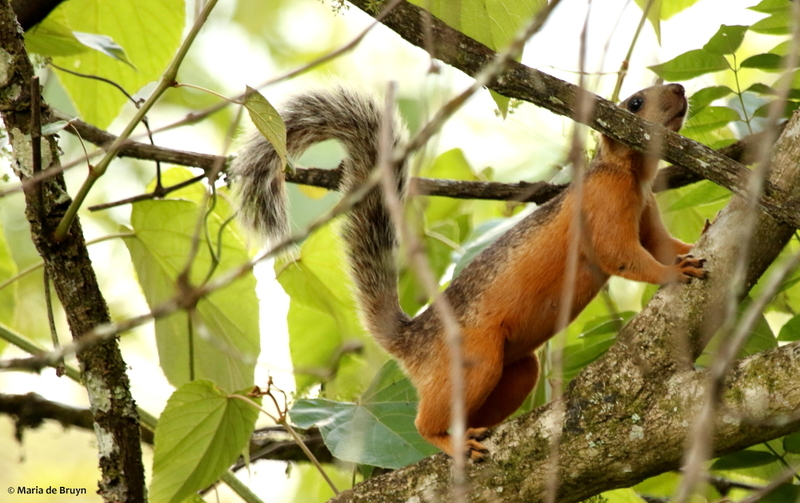 Back at Talari, I did some sightseeing from the balcony of my room, spotting a lengthy and messy-looking flycatcher nest, a variegated squirrel (Sciurus variegatoides) traversing the tree canopy and a pair of palm tanagers (Thraupis palmarum), who were tending an offspring. 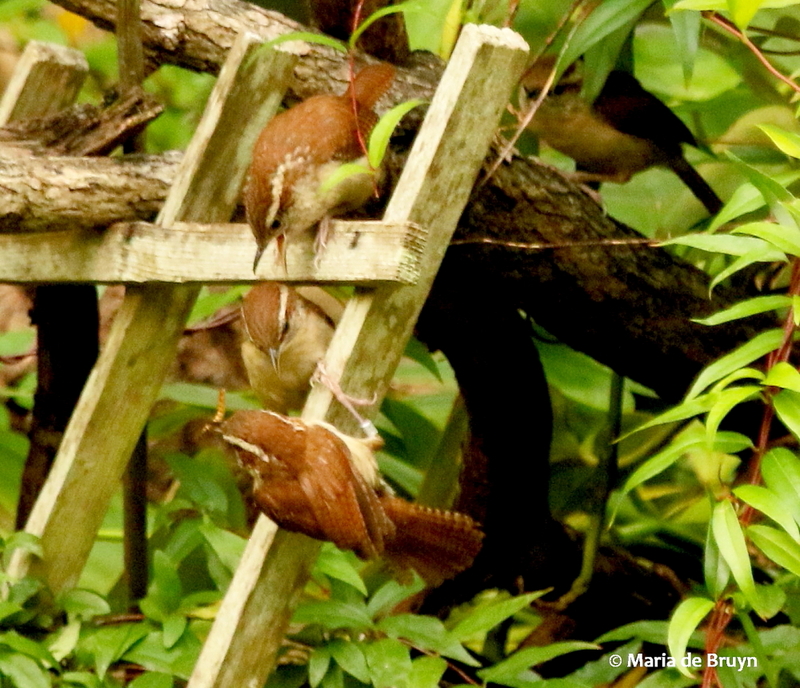 At first, I thought the fledged bird was a different species as it sat under a leafy canopy, but later I saw the parents with it. 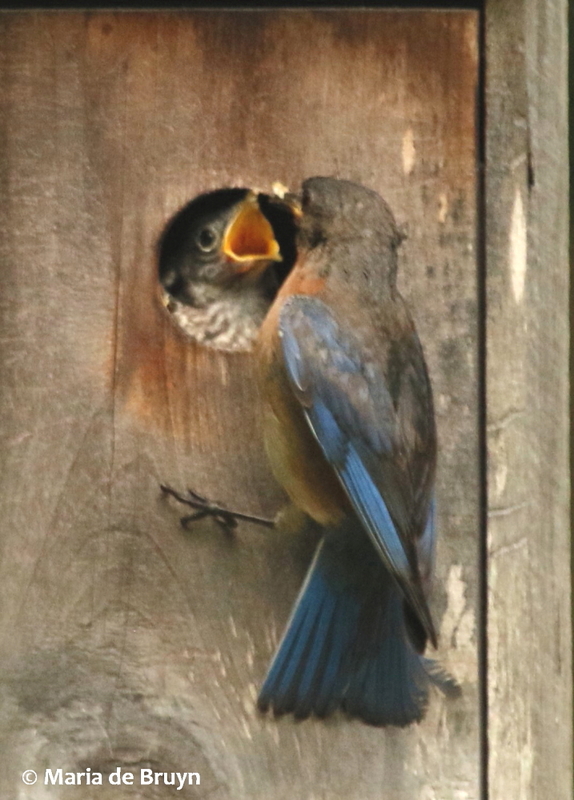 Then it surprised Janet, who was staying next door – she called me over to see the fledgling who had flown into her room and was sitting in the middle of the floor. 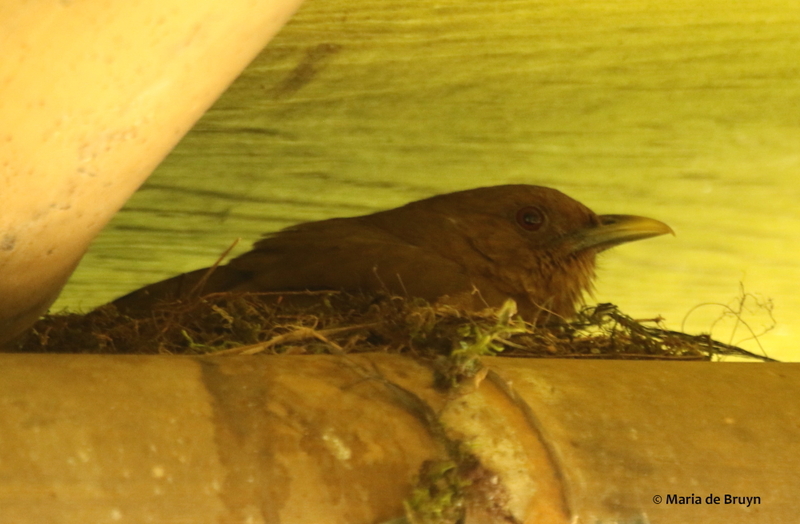 She also had two nests under the roof of her balcony, one of which definitely belonged to a clay-colored thrush (Turdus grayi). 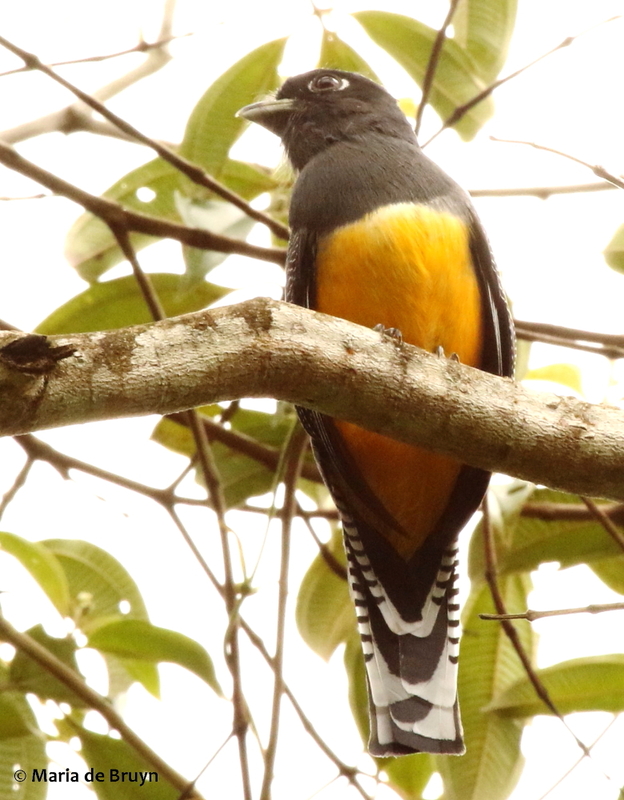 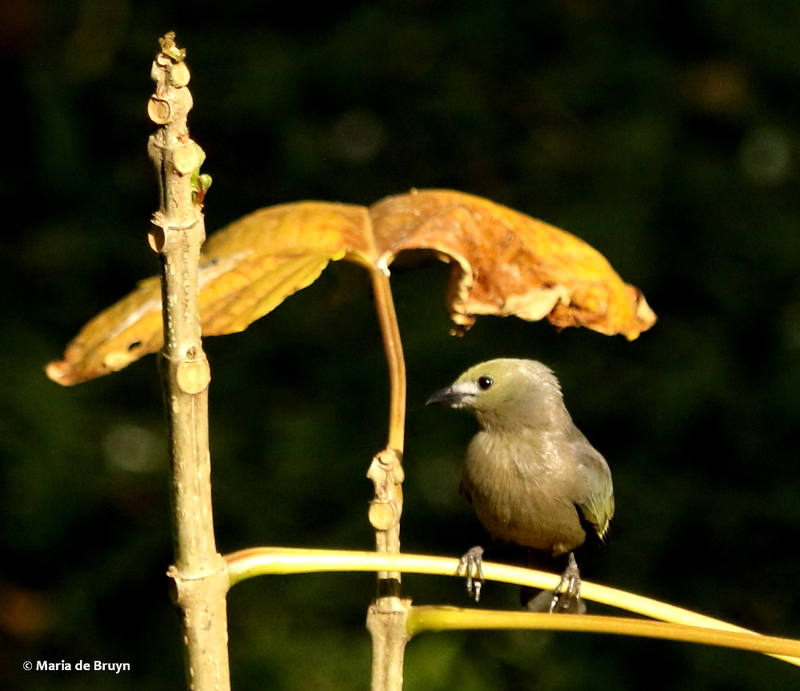 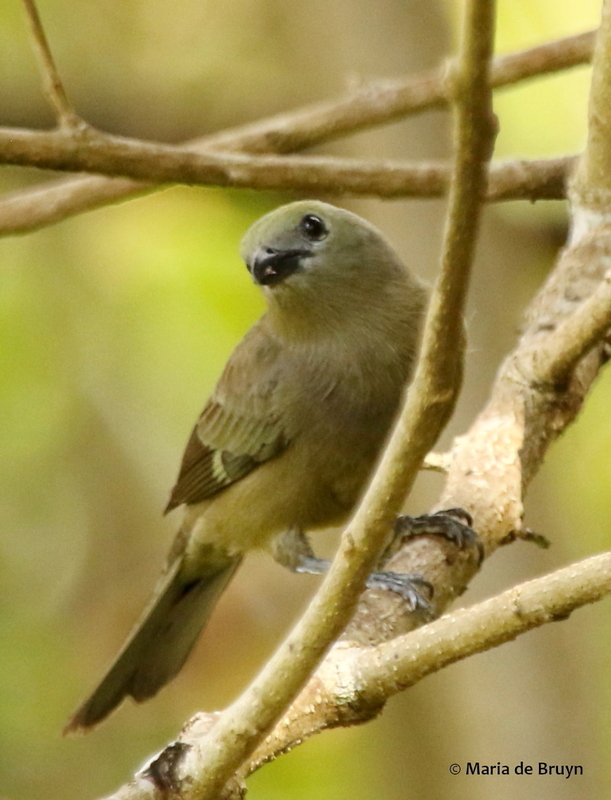 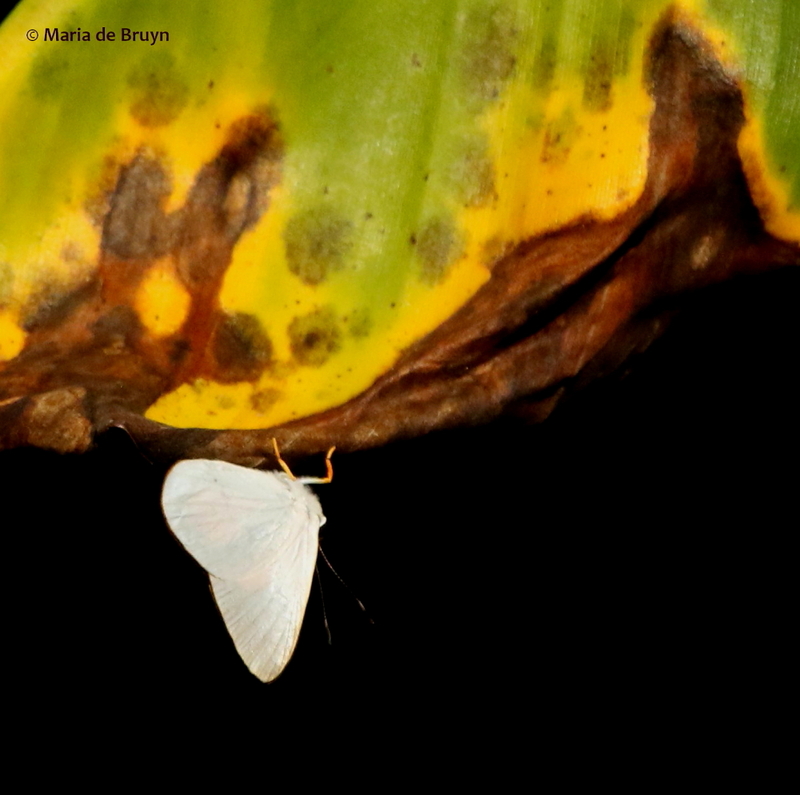 After admiring one of the neighbors’ cows and social flycatcher (Myiozetetes similis), I caught sight of a quiet beauty sitting on a branch in front of my room. 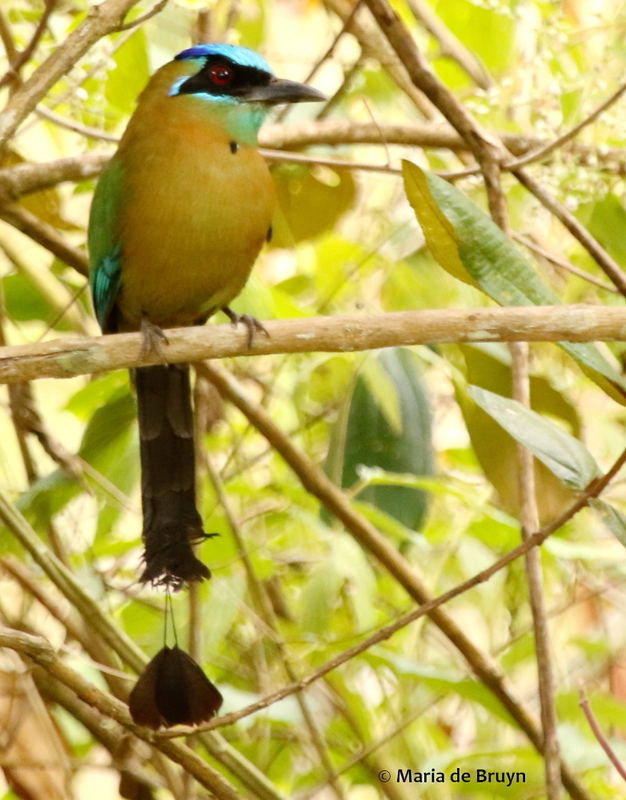 The Lesson’s motmot (Momotus lessonii), also known as the blue-diademed motmot, has a bright red eye and beautiful tail with what some birding sites call a “raquet tip”. 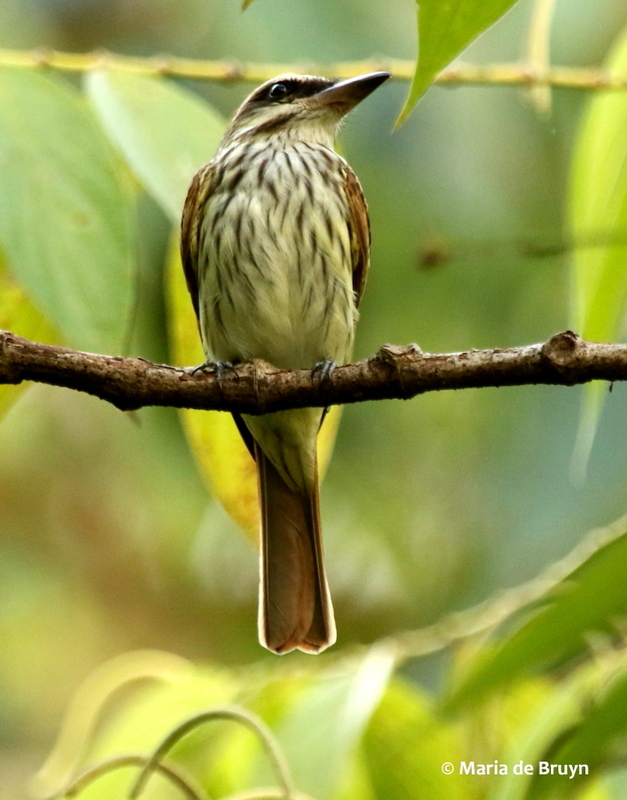 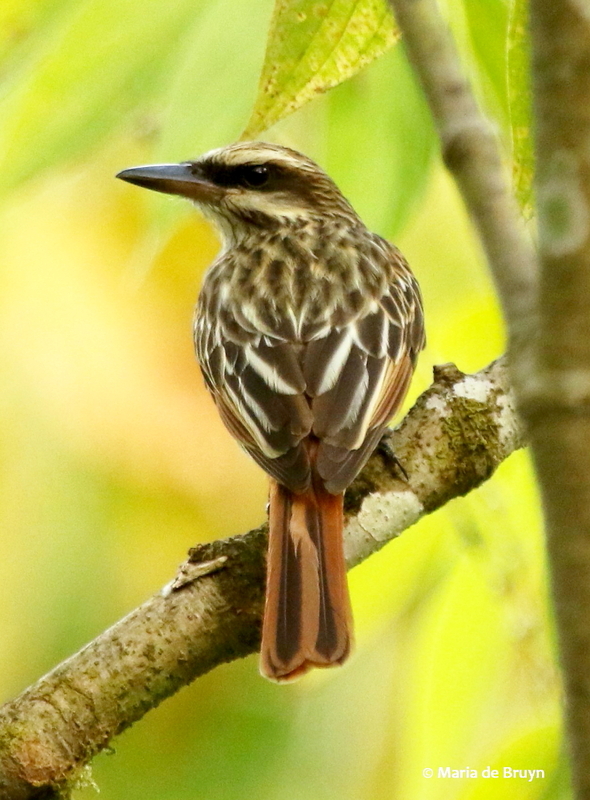 As we set off for the dining area, we were treated to a visit from a streaked flycatcher (Myiodynastes maculatus), quite a good-looking bird with its heavily streaked back, breast and face. 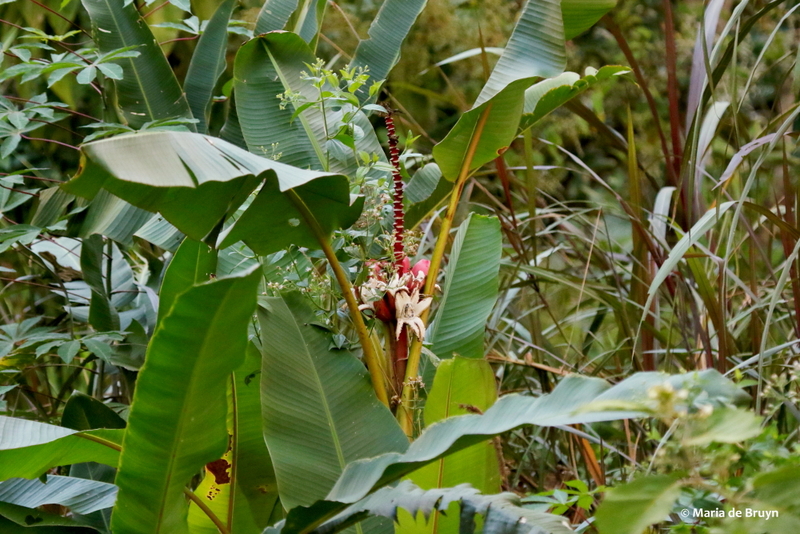 As we passed through some vegetation before dinner, I saw a gorgeous flowering banana as a blue-feathered and red-legged honeycreeper (Cyanerpes cyaneus) flew high overhead. 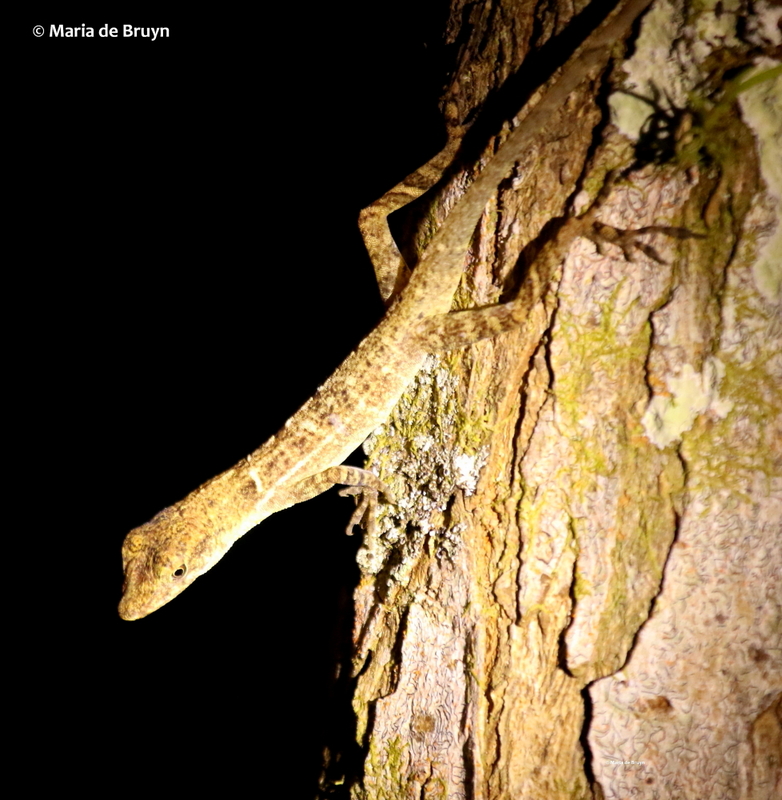 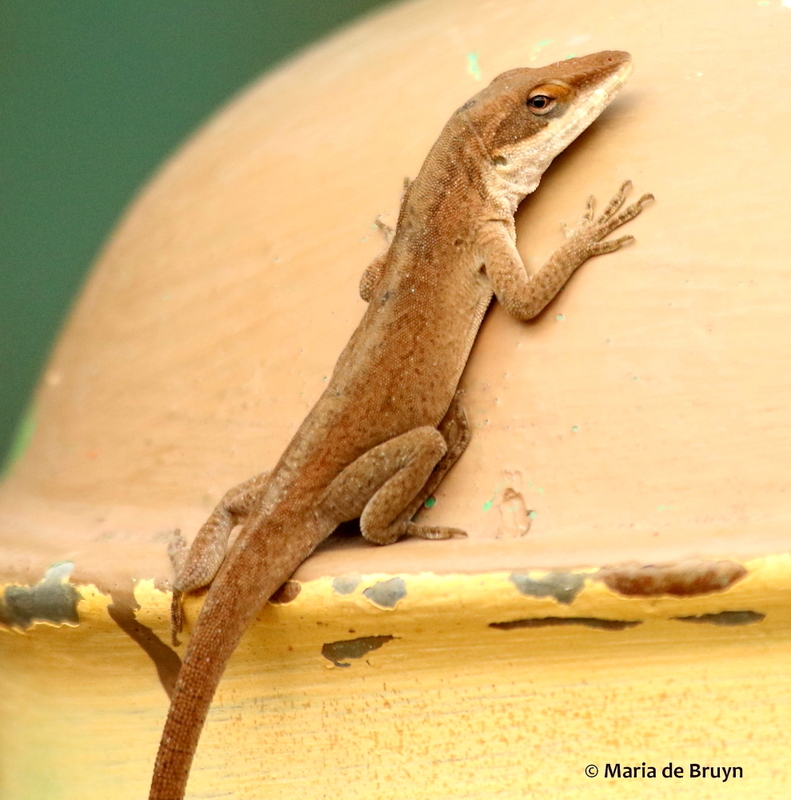 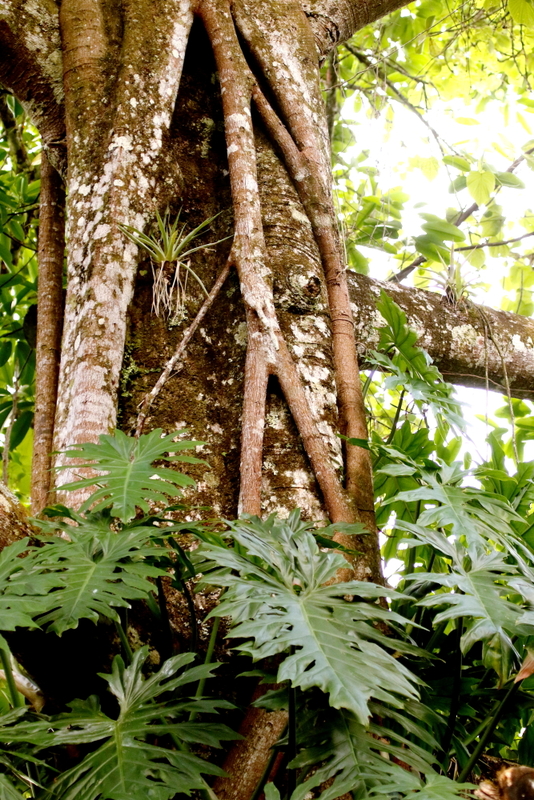 Even though we often were looking for birds in dark and leafy/shady areas, I avoided using a flash but when I saw the lemur anole (Norops lemurinus) on a tree, I gave in so that I coul d get a photo. 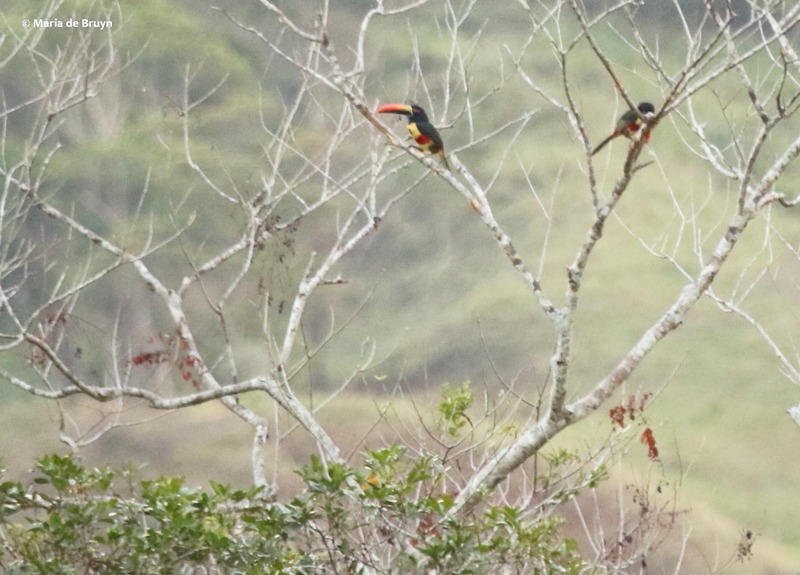 As dusk came on and we looked out from the dining area, we got to see some fiery-billed aracaris (Pteroglossus frantzii) in the distance. 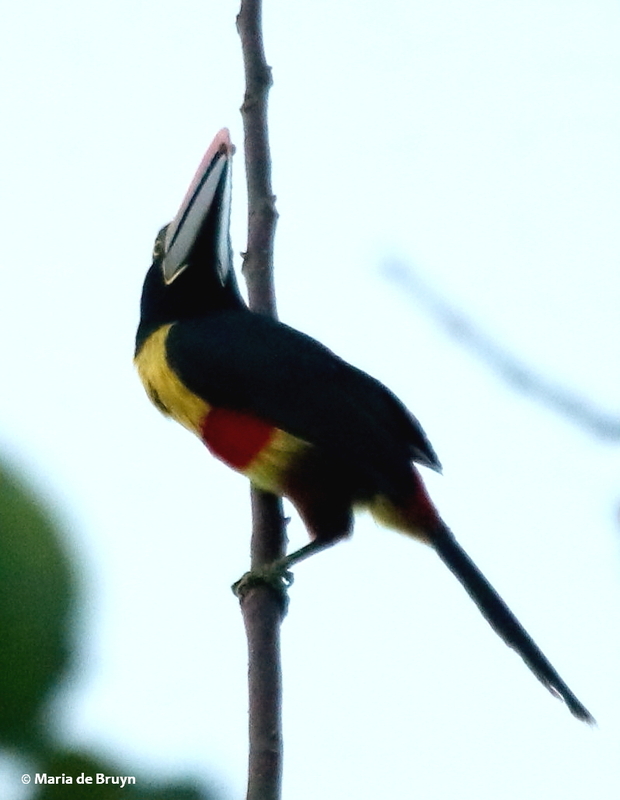 While some others in our group got to see one close up, that was not my fate, but the next morning, the aracaris were in a little better light though still far away, allowing me to get a bit better photos. 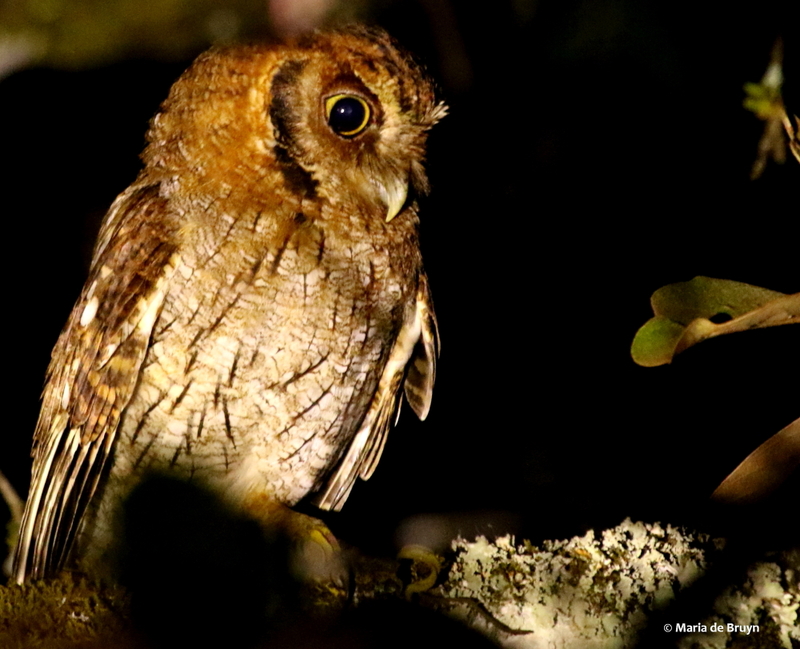 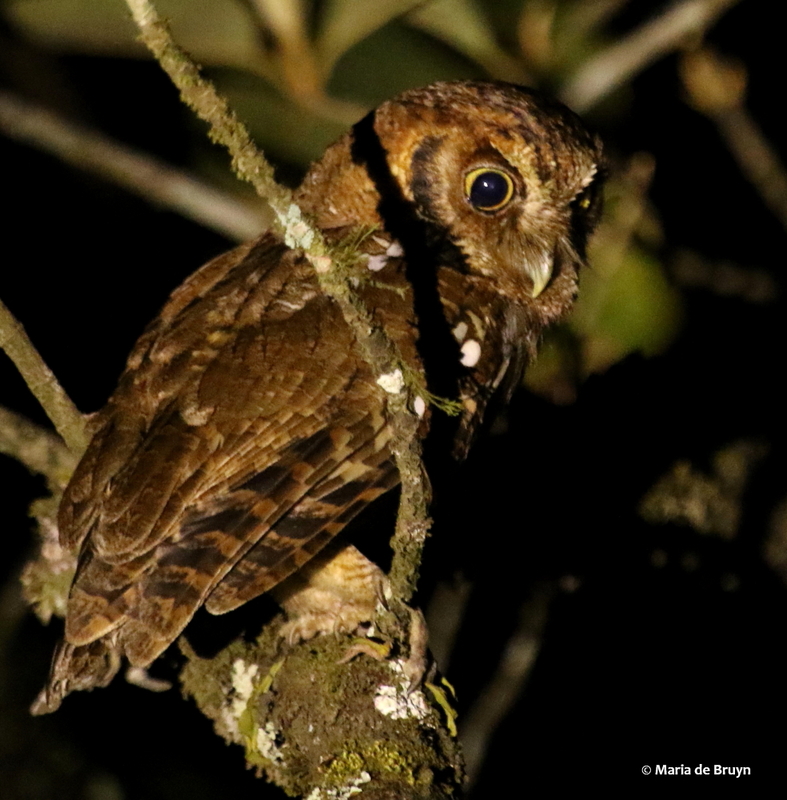 We ended our second night at Talari Lodge with an owling outing – Steve managed to draw in a tropical screech owl (Megascops choliba) by playing its call on his phone. 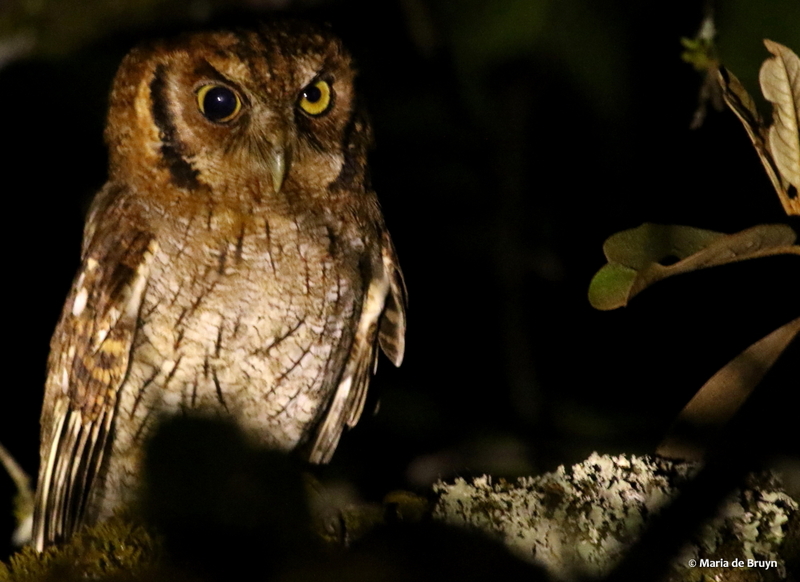 The owl who came had had an injury to one eye, with a pupil that would no longer dilate but s/he seemed to be flying fine and looked healthy. 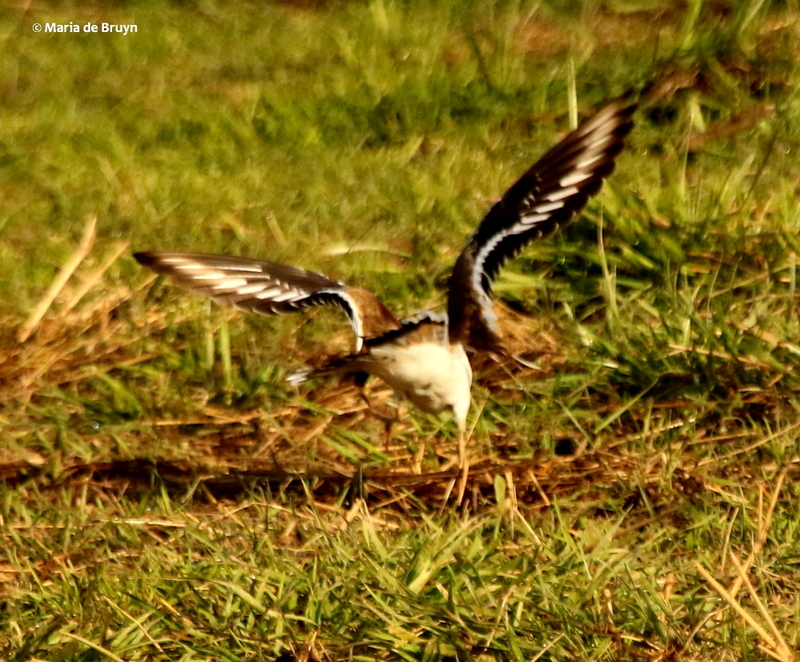 That bird gave us a nice long look at its beautiful self so that we retired for the night with a feeling of birding satisfaction! 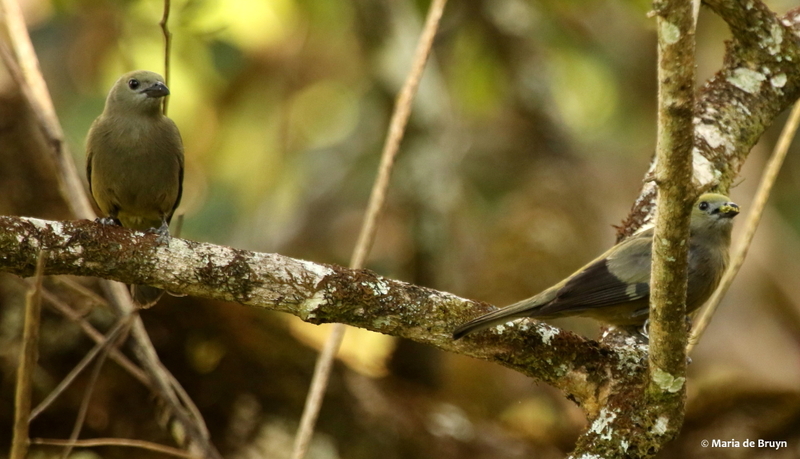 This edition of Costa Rican rambles will be a two-parter. 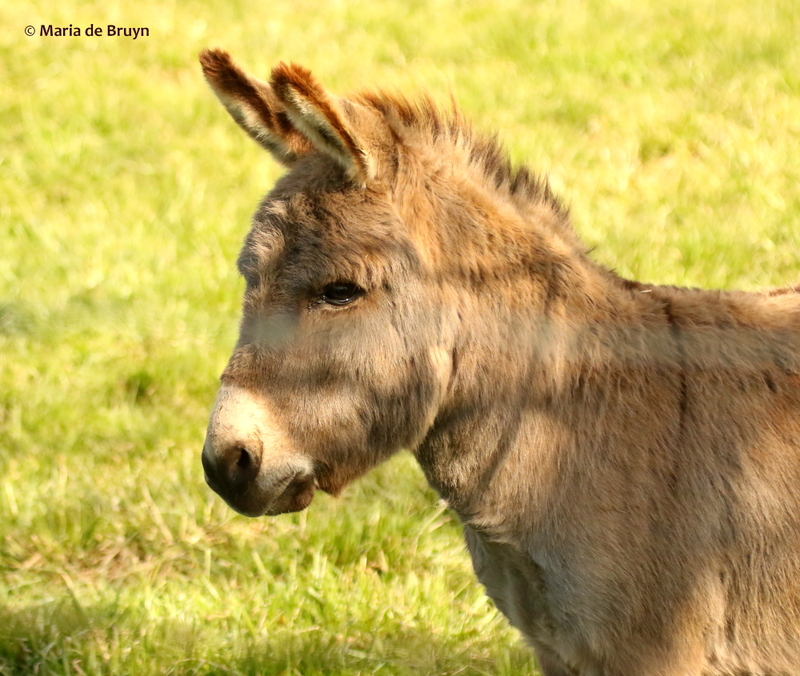 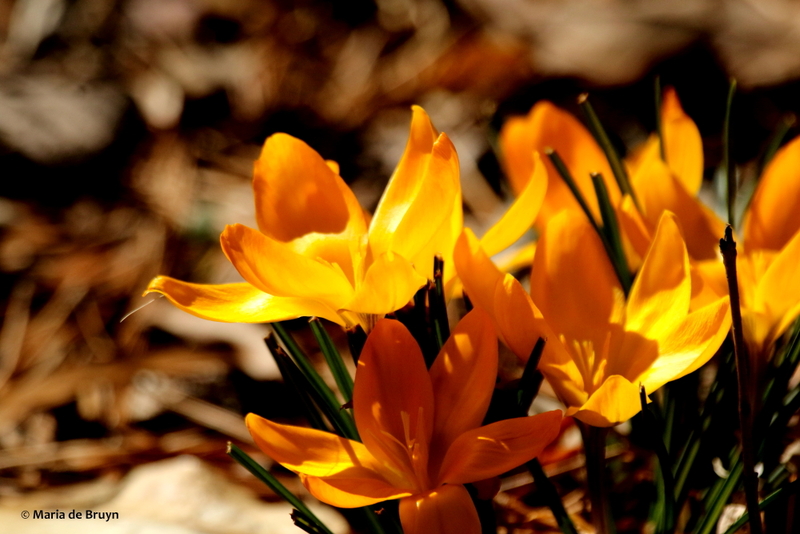 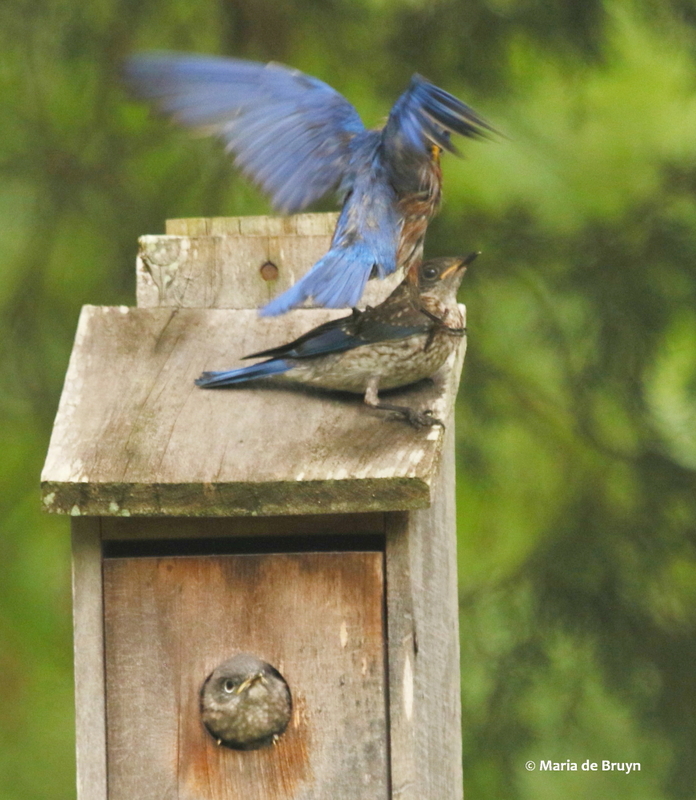 Remember that you can click on a photo to see it larger and then click the back arrow to go back to the blog. 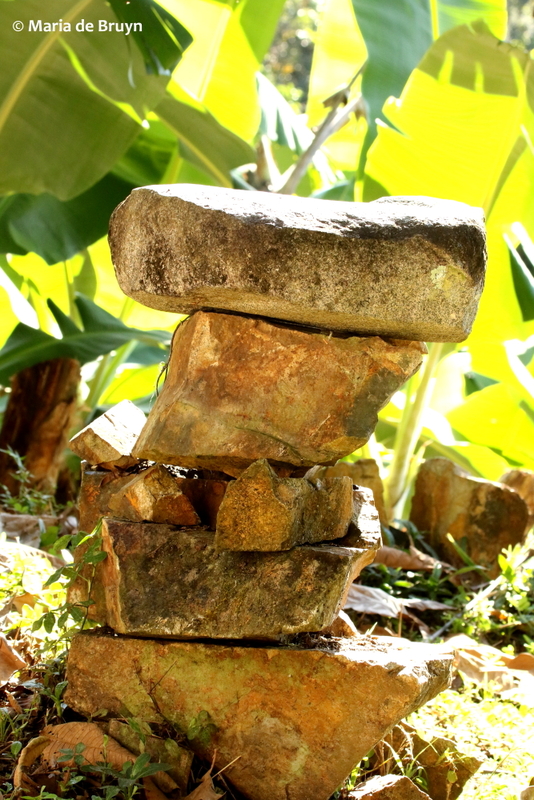 The Talari Mountain Lodge, located in the El General Valley next to the Chirripo River, became our pied-à-terre for two nights. 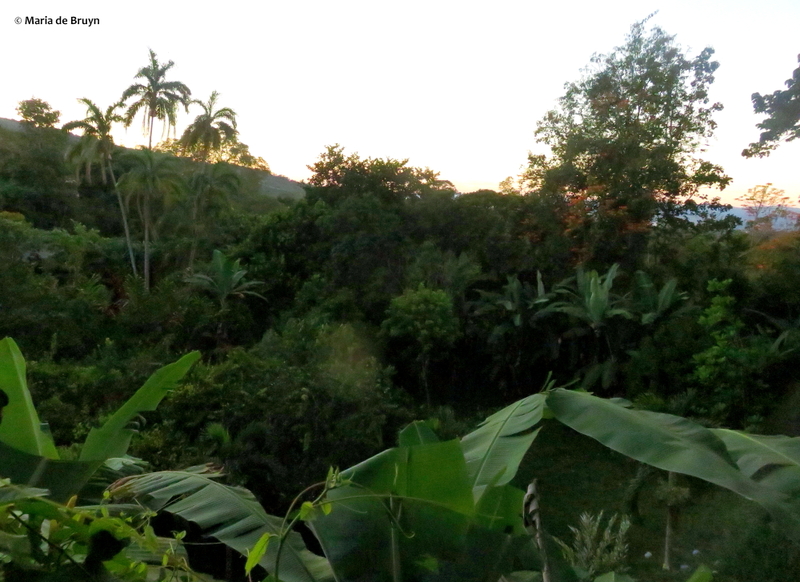 We had lush surroundings, as you can see from our view looking out of the dining area. 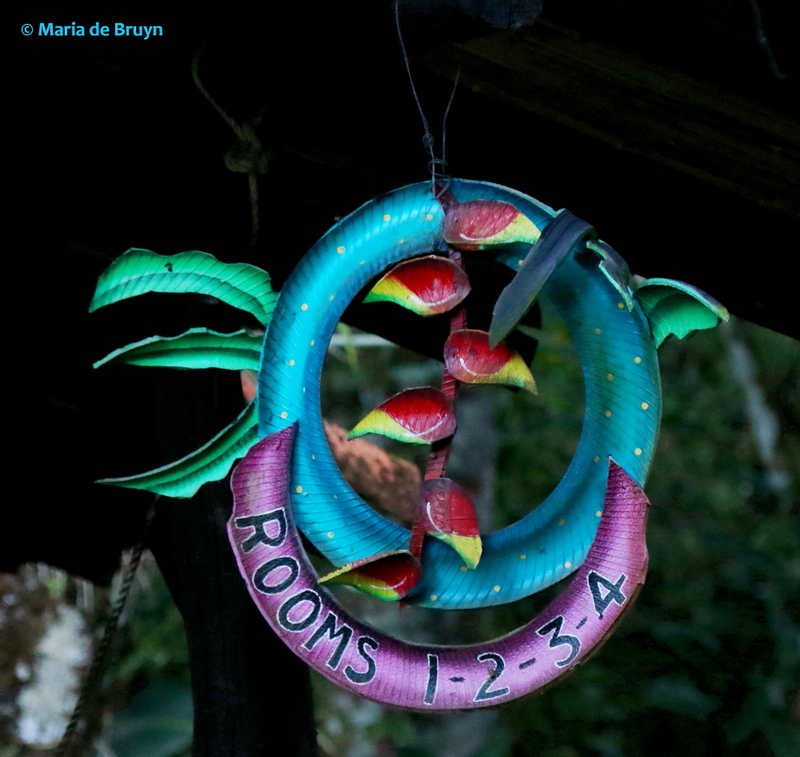 Several of the signs were made of old tires that had been artistically cut and painted – beautifully and colorfully done! 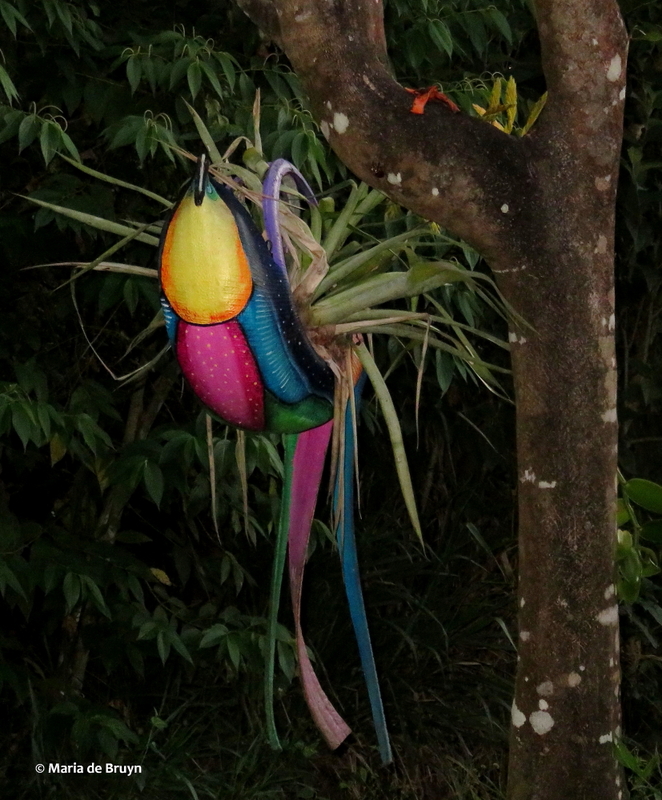 Some hanging plant holders had also had a previous life as tires. 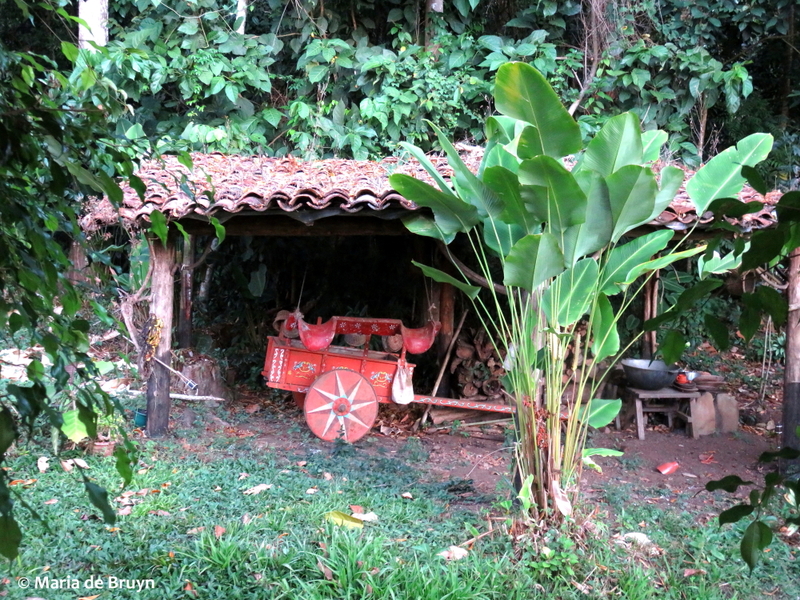 There were some other decorations, too – a brightly painted cart and some snakes (we only saw one real one during the trip). 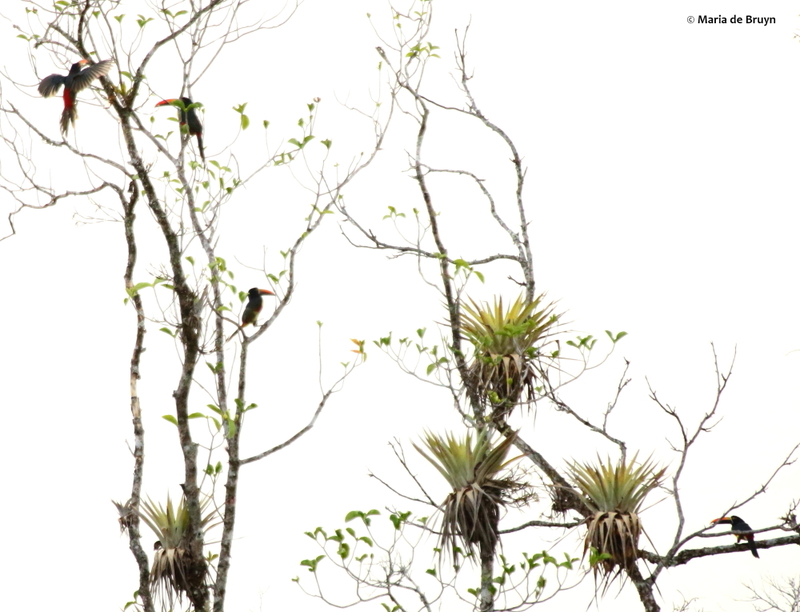 Having gotten some coffee and tea, we set out to see the lodge surroundings before breakfast. 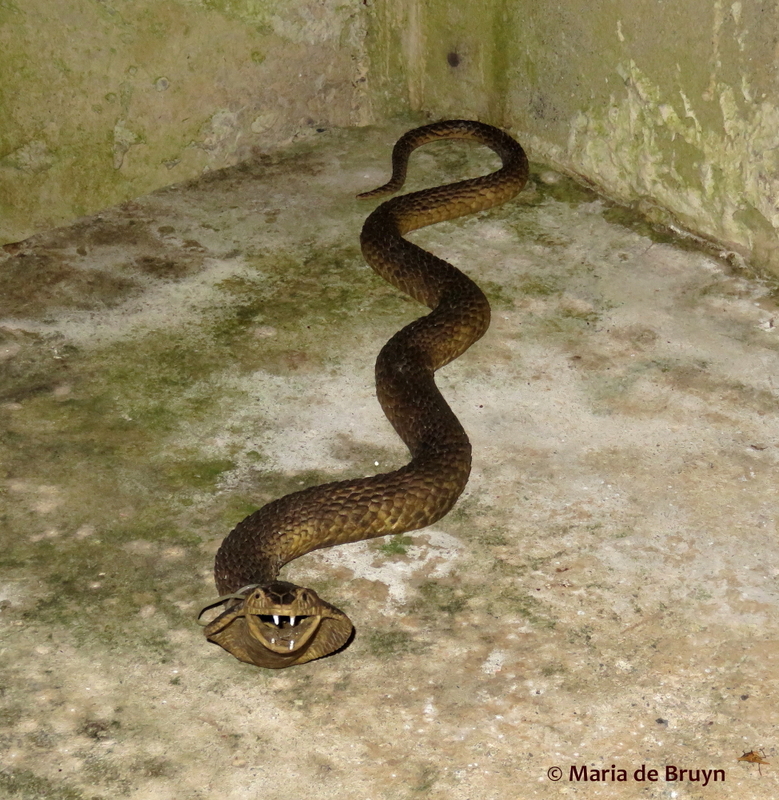 After passing a strangler-fig covered tree (Ficus aurea), we stopped by the rooms in which some of our group were staying. 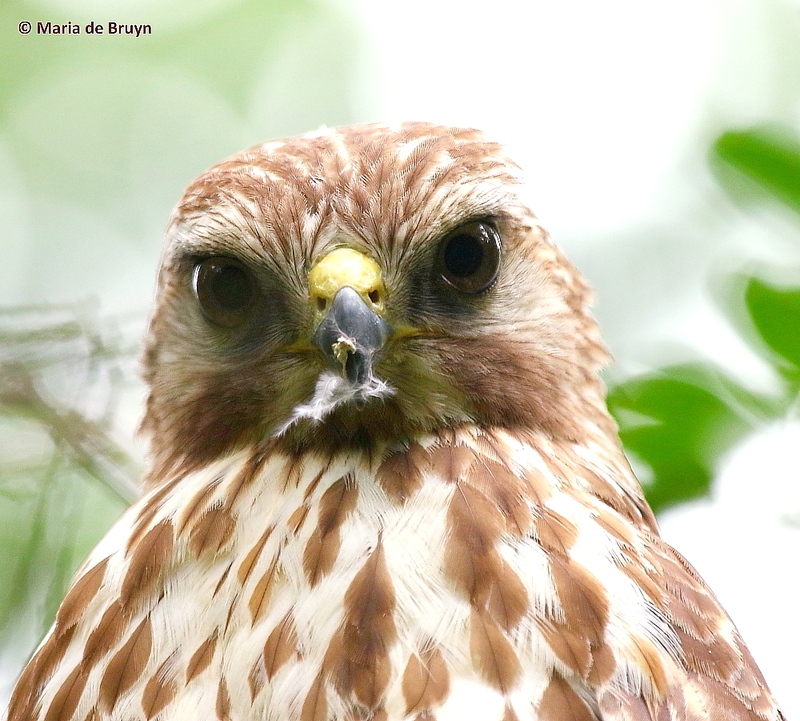 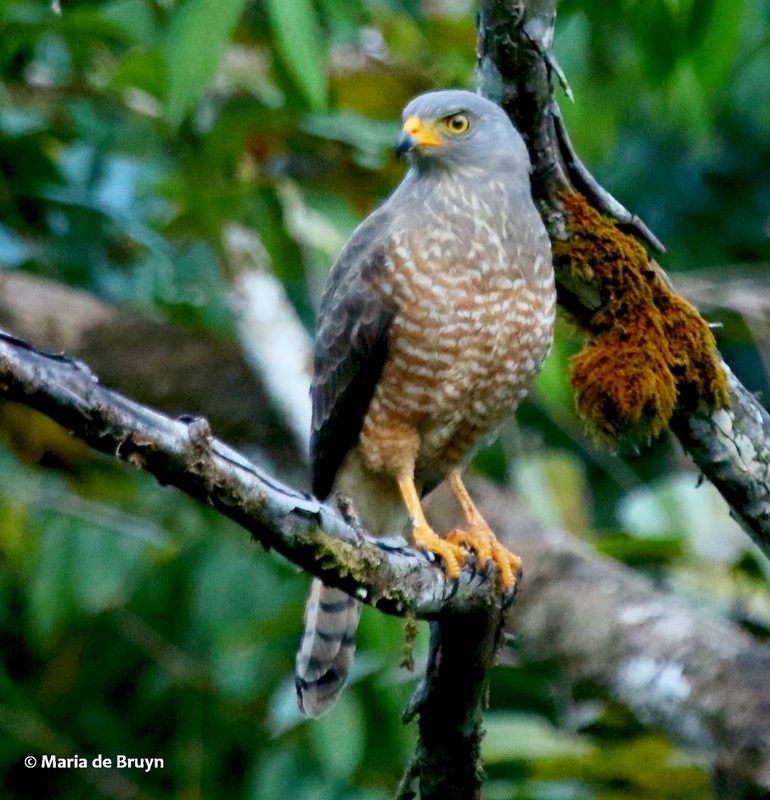 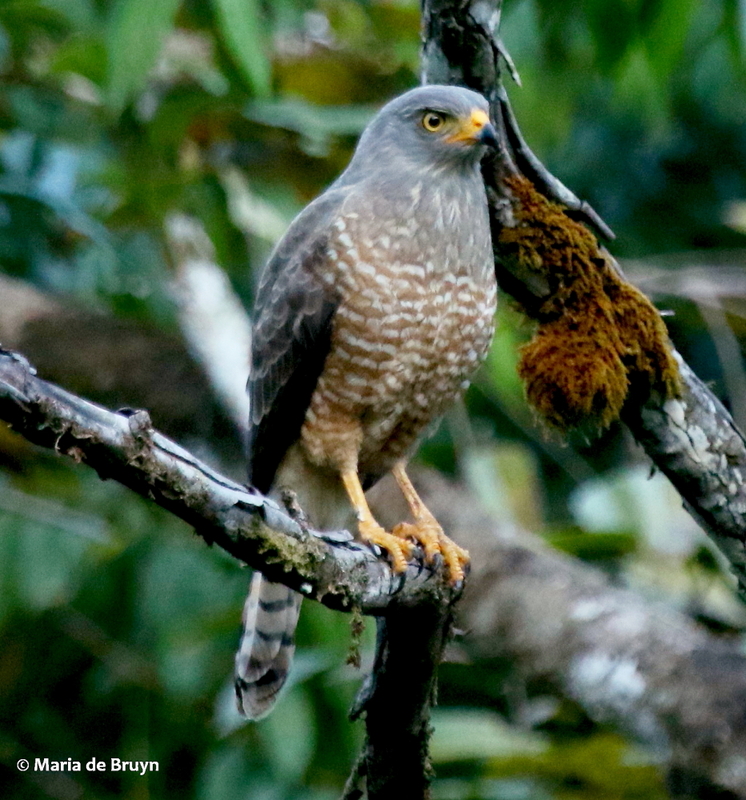 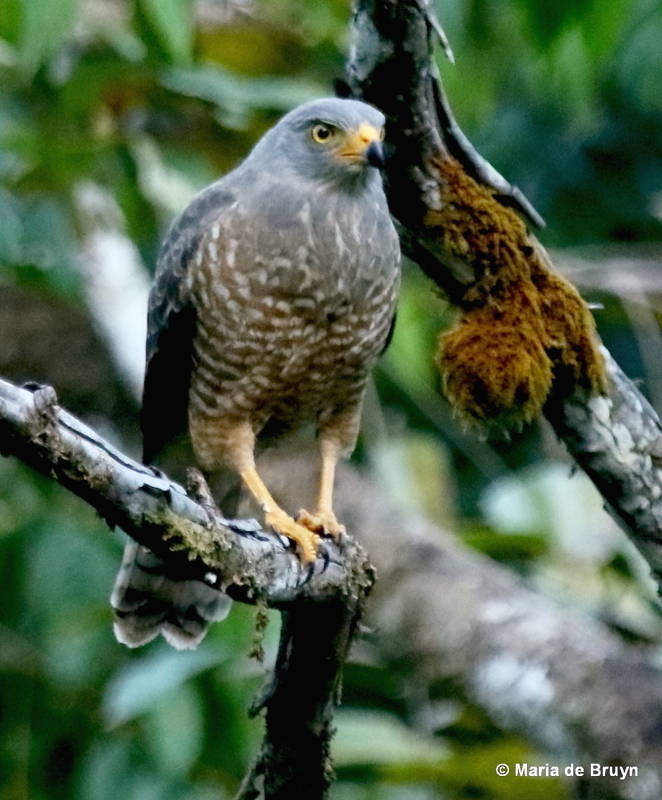 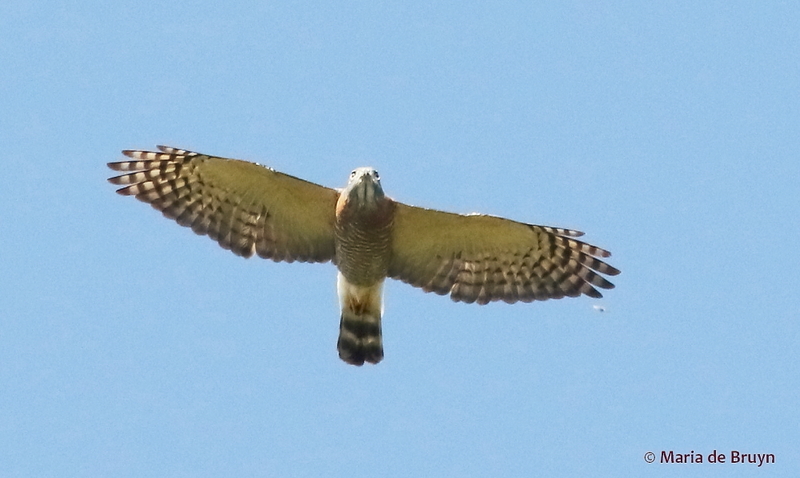 There we were welcomed by a very handsome roadside hawk (Rupornis magnirostris). 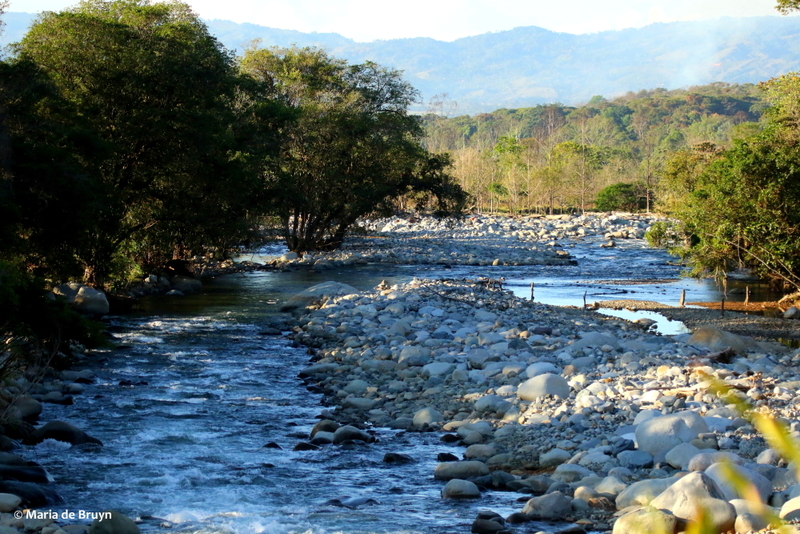 We neared the river, which was rather low. 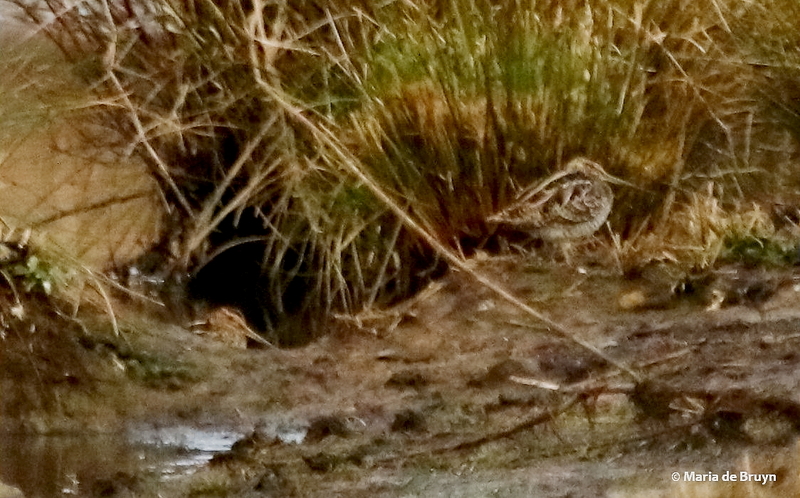 Some of our group members managed to catch sight of an otter there a few times but I never had that sighting. 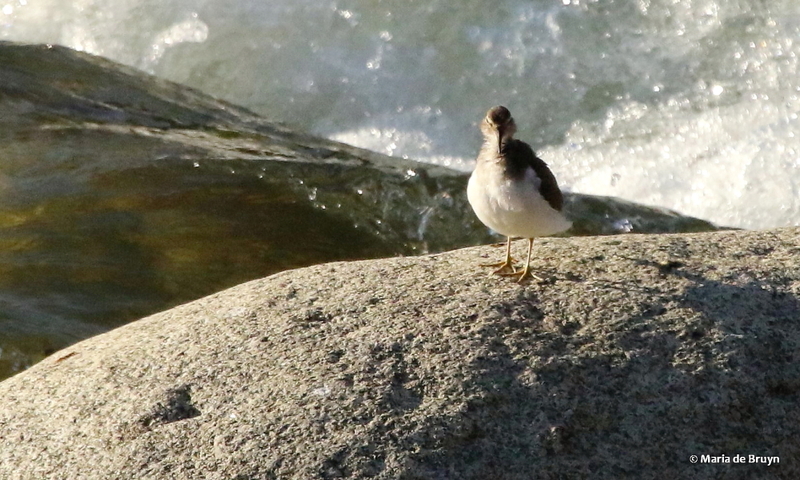 I did see a sandpiper on a rock in the river, which our guide said was a spotted sandpiper but it looked like a solitary sandpiper (Tringa solitaria) to me. 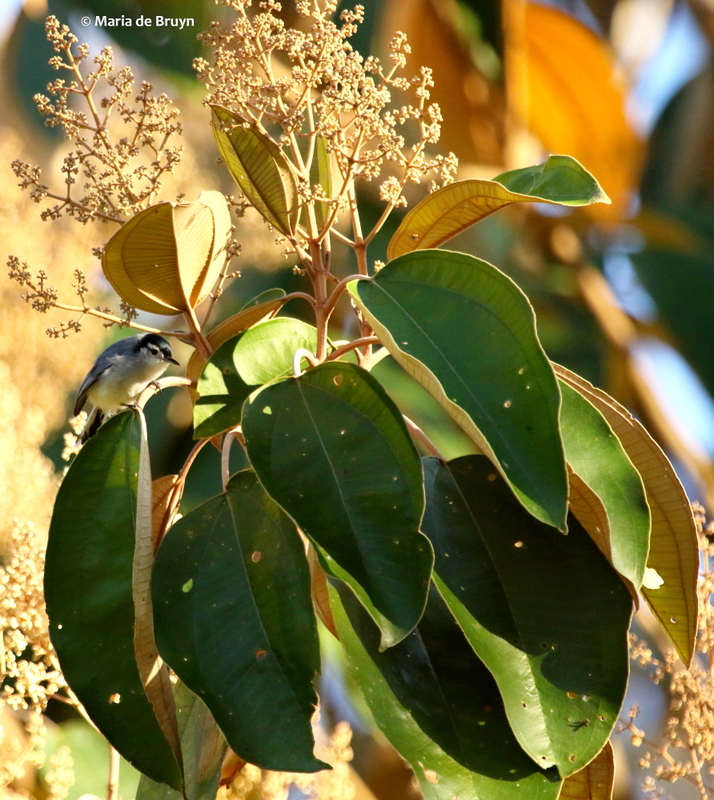 The trees along the banks were filled with birds. 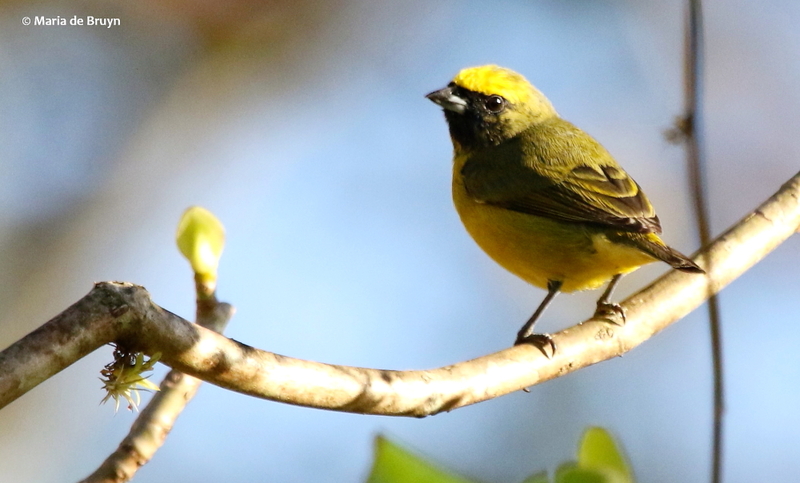 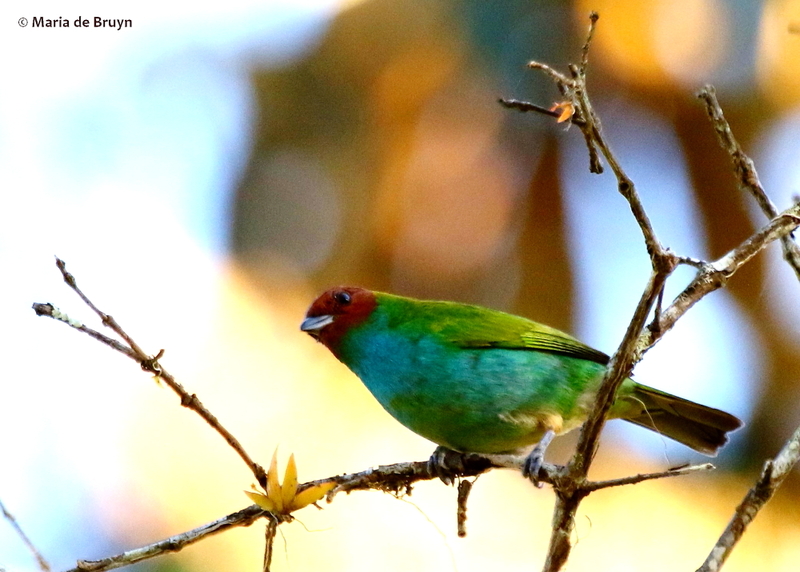 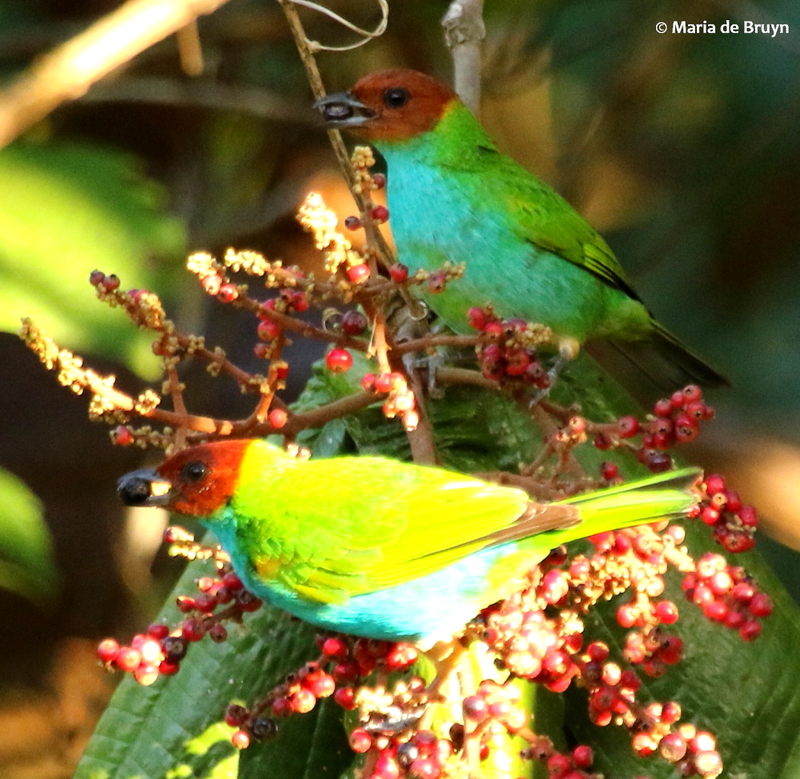 One of the first that really caught my eye was the bay-headed tanager (Tangara gyrola). 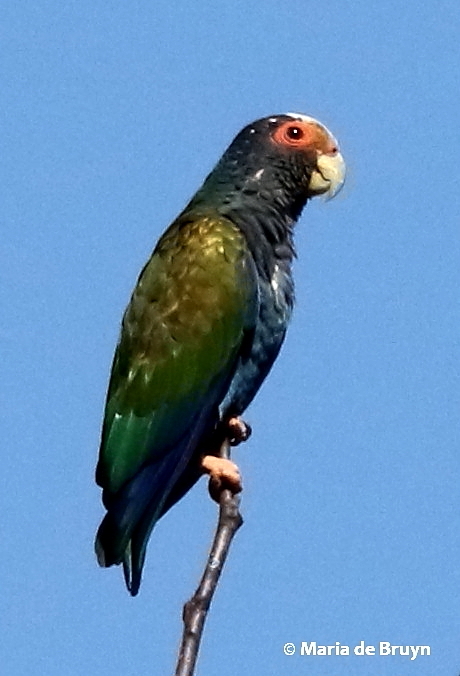 I would have given it a different common name, but its distinct head color really did set off its beautiful blue and green feathers, which looked almost neon in the bright sunlight . 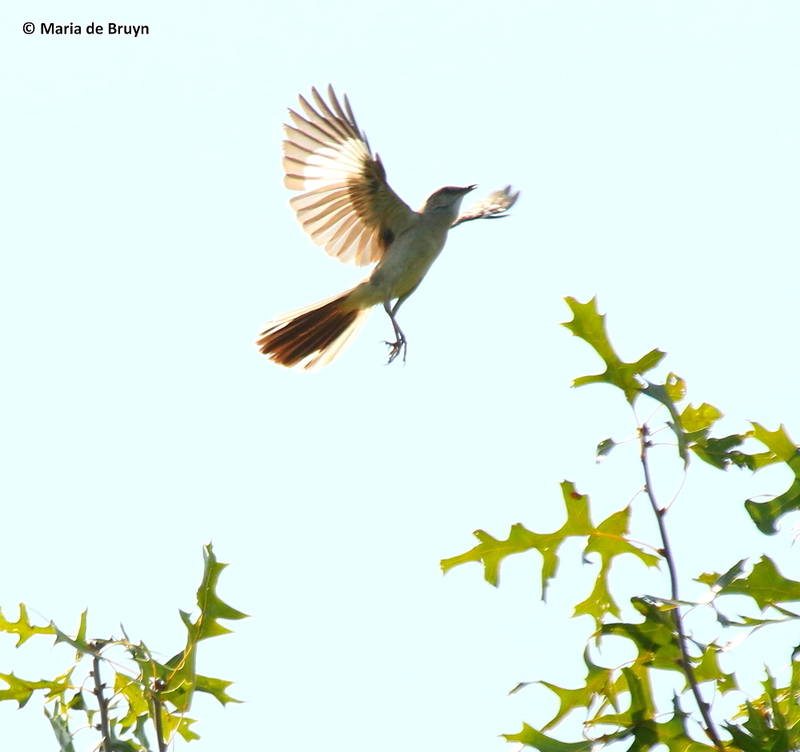 Now that spring has come to North Carolina, I’ve been having fun watching the blue-gray gnatcatchers building their nests. 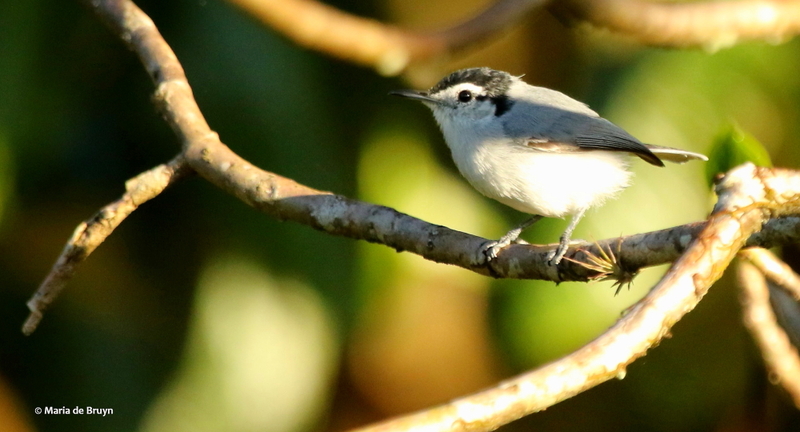 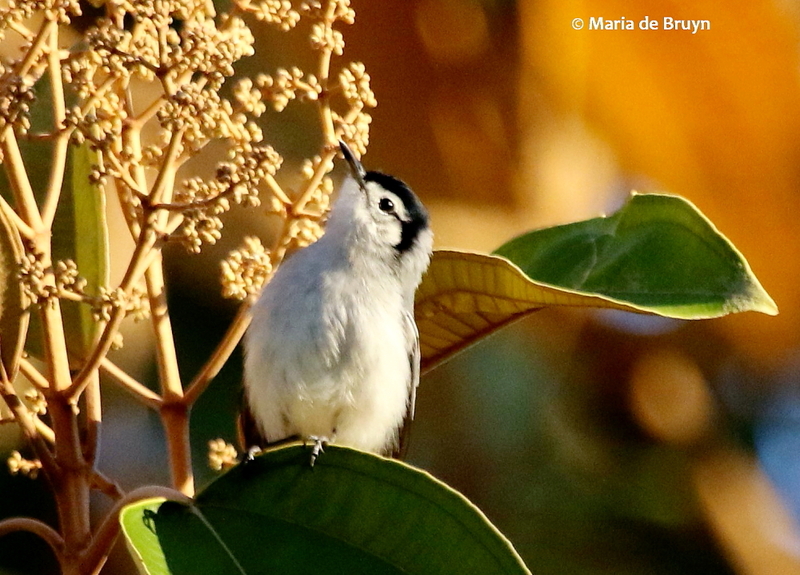 They have a counterpart in Costa Rica, called the tropical gnatcatcher (Polioptila plumbea). 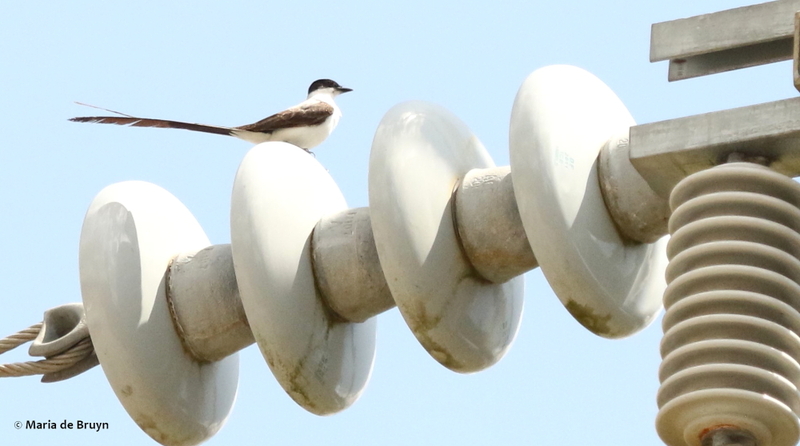 It seems to be about the same size as our gnatcatcher, with its gray feathers and tendency to move about a lot, but its head reminds me more of a Carolina chickadee. 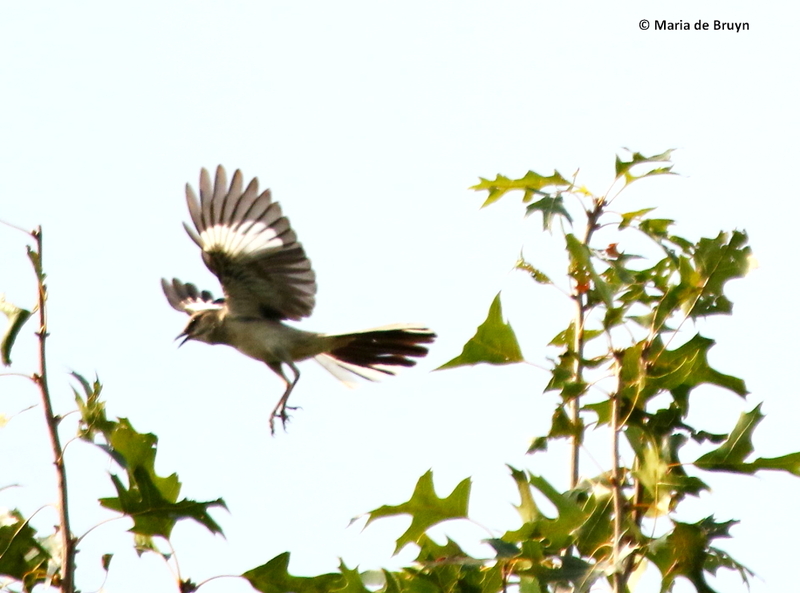 Perhaps this is what a hybrid blue-gray gnatcatcher/Carolina chickadee would look like. 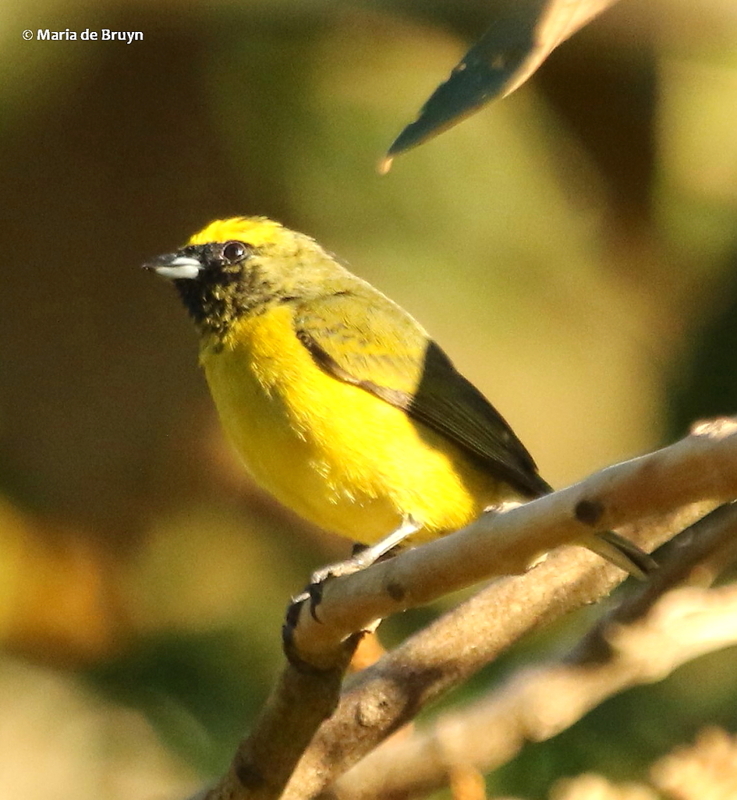 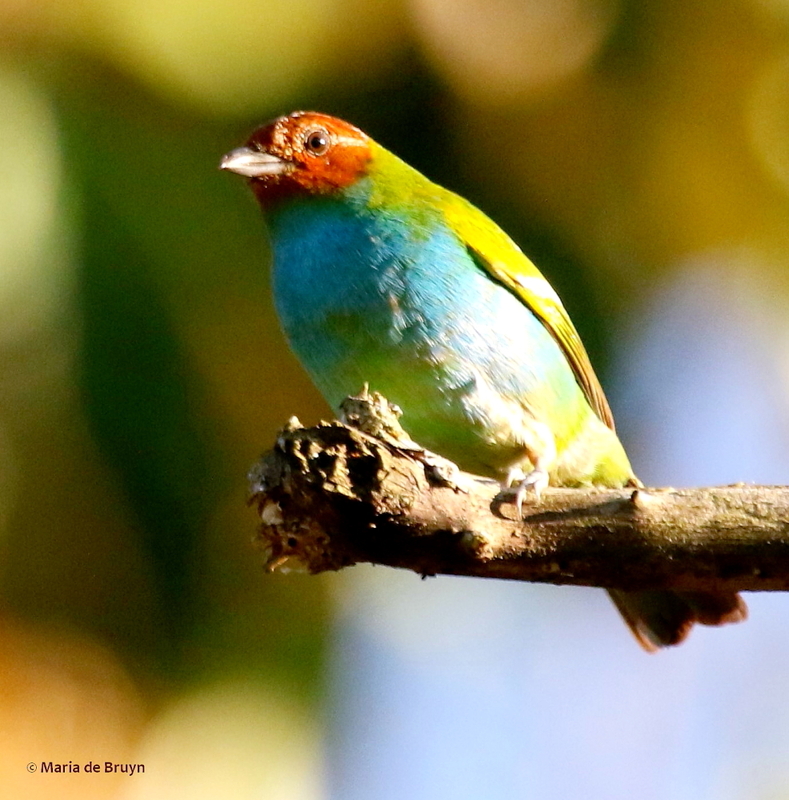 The next bright bird to occupy my attention, while my fellow birders peered through their binoculars at other species, was the yellow-crowned euphonia (Euphonia luteicapilla). 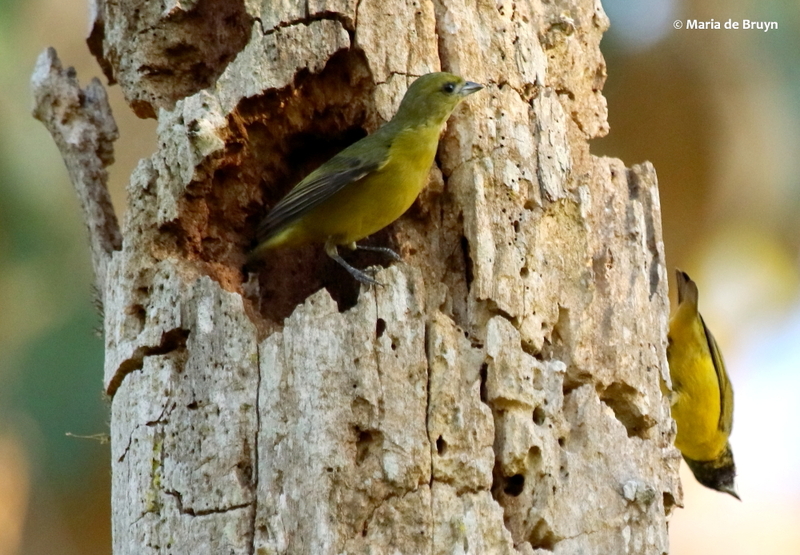 The adult males have bright yellow and blue plumage; I only saw younger males and a female who seemed to be checking out a nesting cavity. 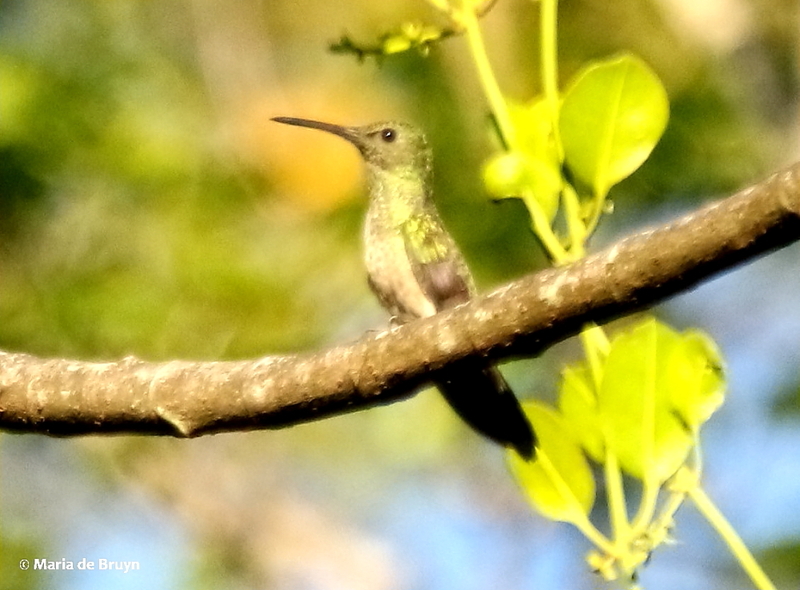 A scaly-breasted hummingbird (Phaeochroa cuvierii) put in a brief appearance, while several species of swifts were circling overhead. 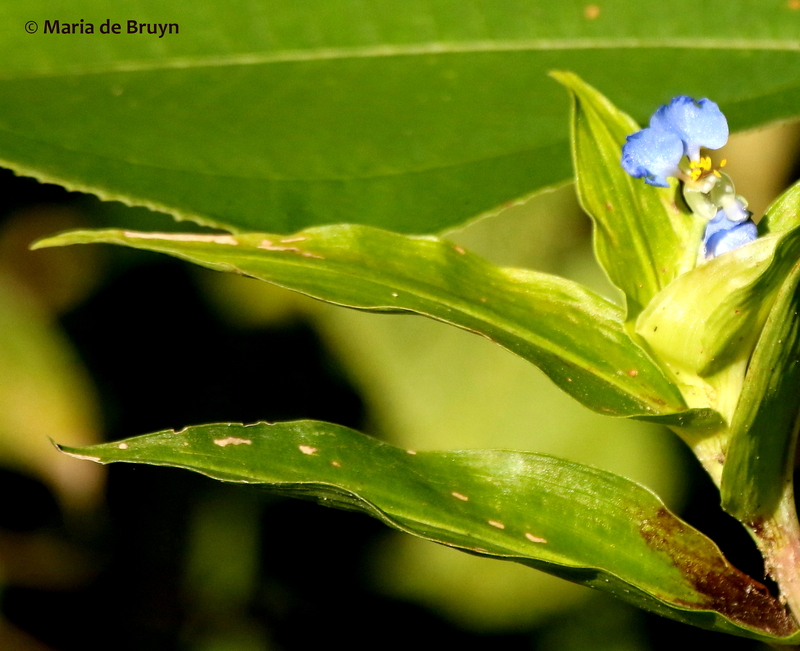 On our way back to breakfast, I admired the lodge’s stone bird bath and noted they have an invasive plant that we have in North Carolina, too, the Asiatic dayflower (Commelina communis). 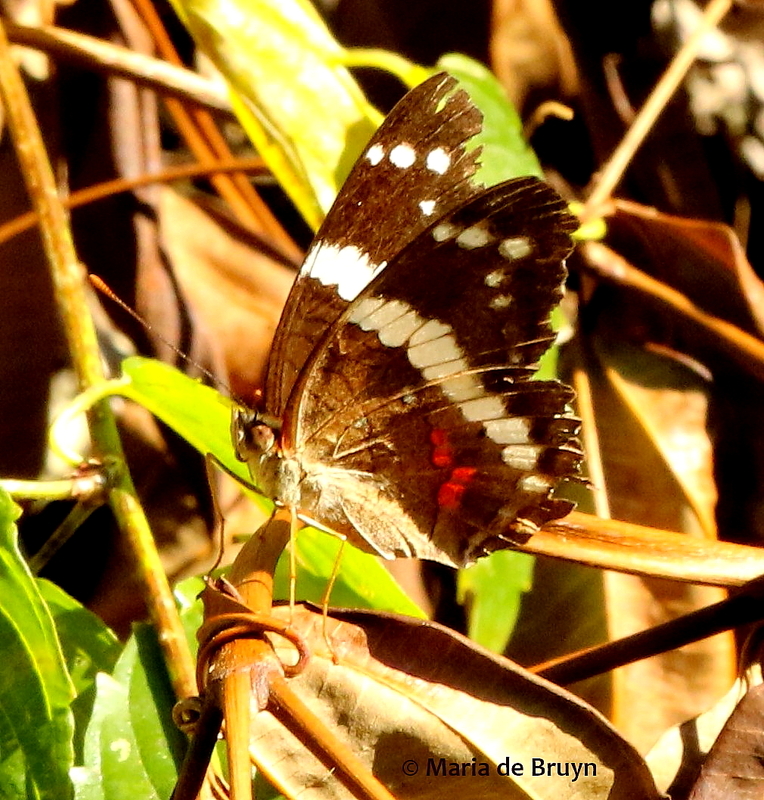 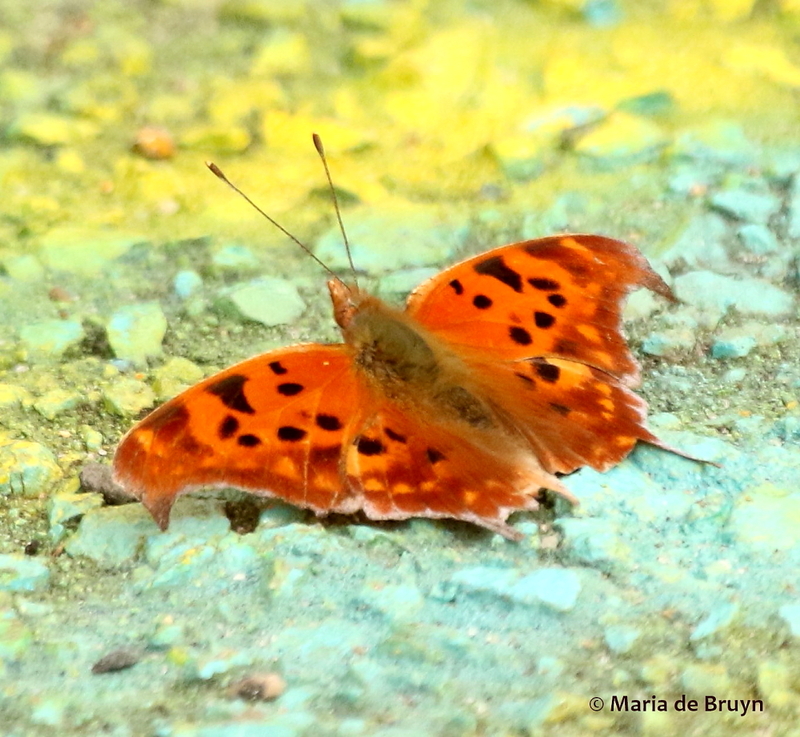 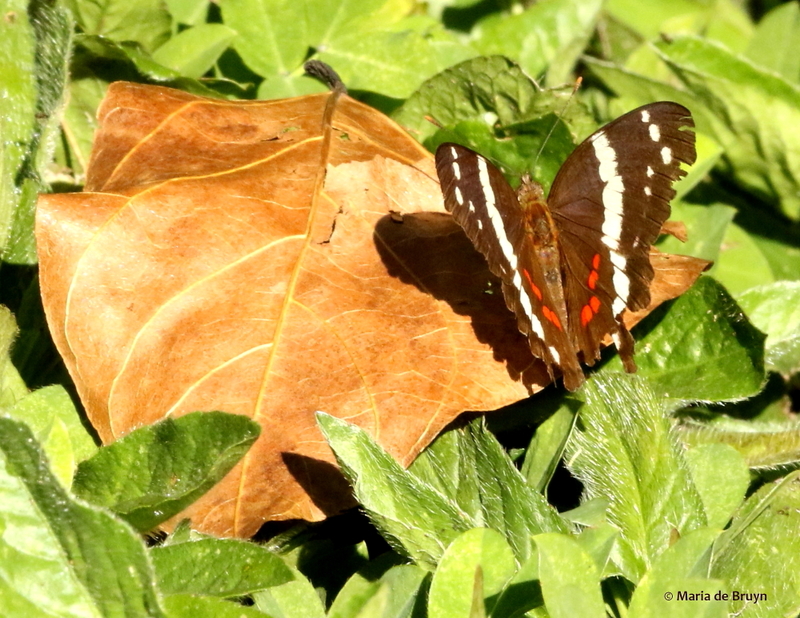 Then I got some photos of a banded peacock (Anartia fatima) and a Cucullina ringlet butterfly (Hermeuptychia cucullina). 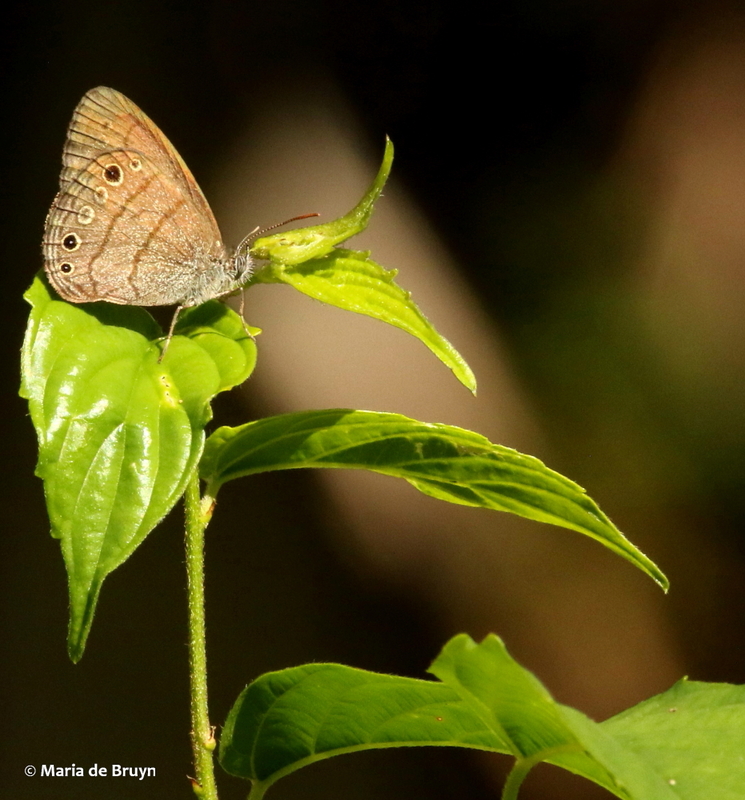 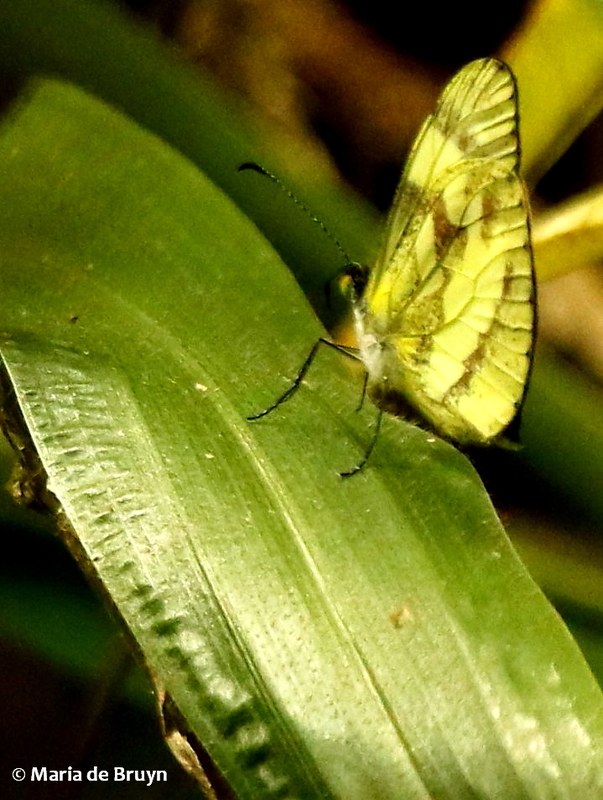 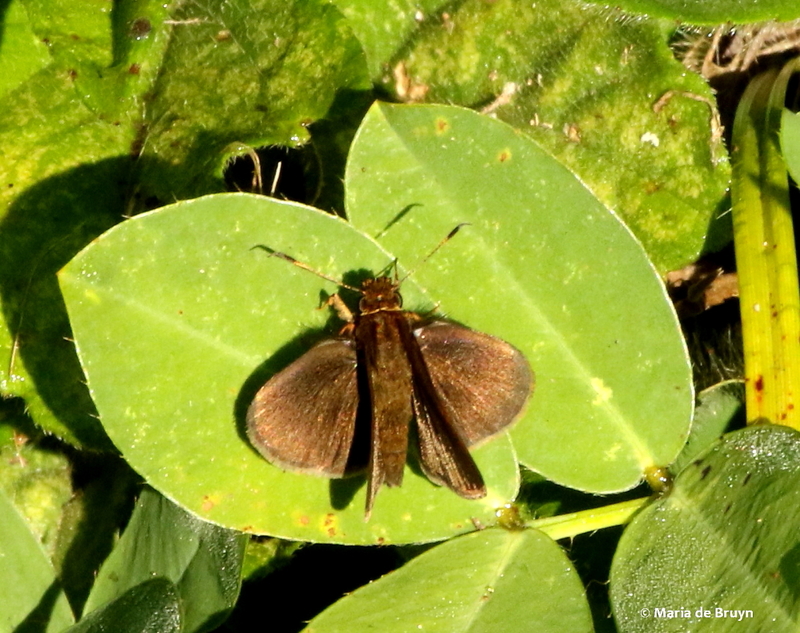 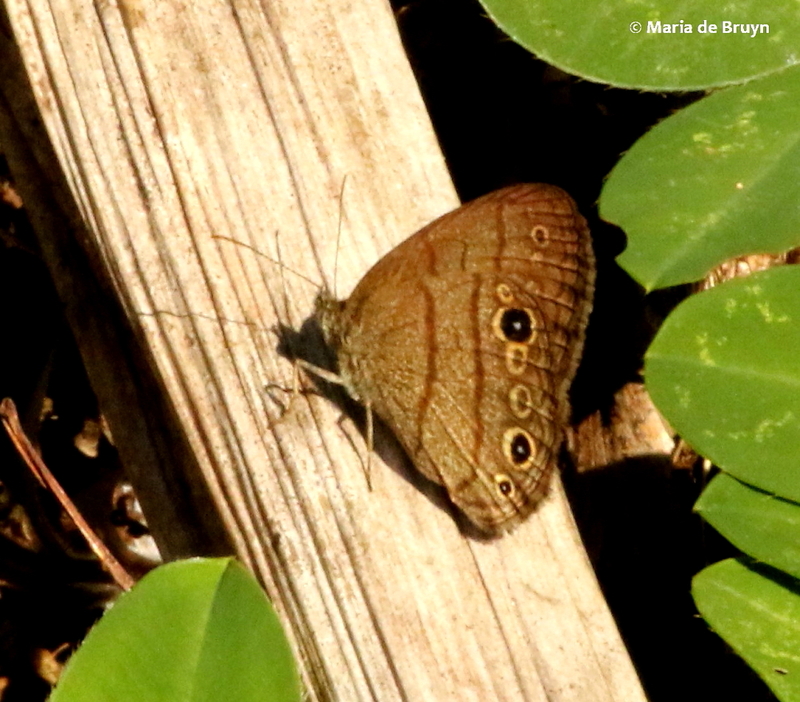 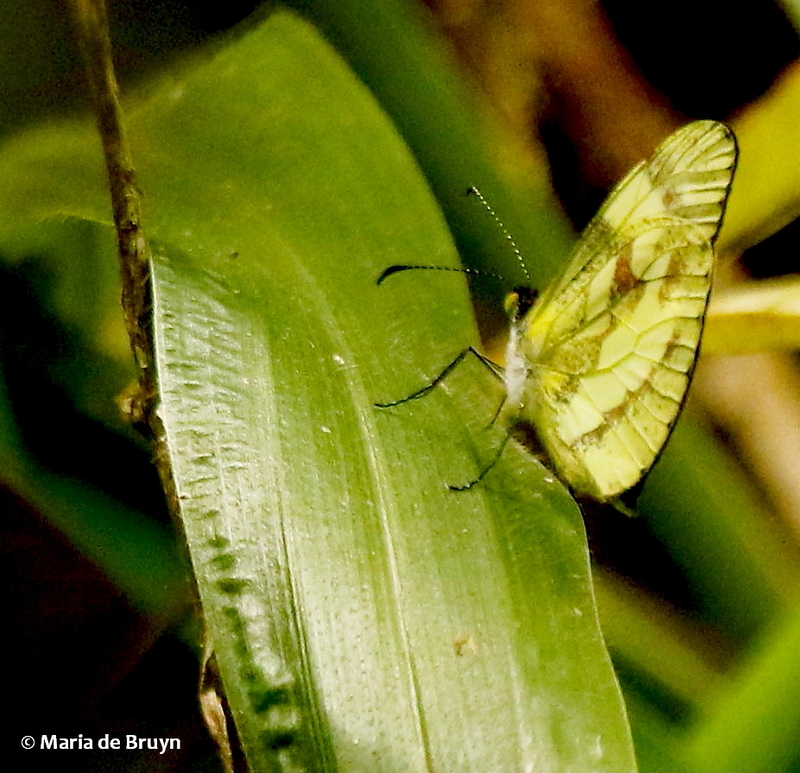 I was not able to find out the species (yet) for a brown skipper, a white moth and another pretty butterfly. 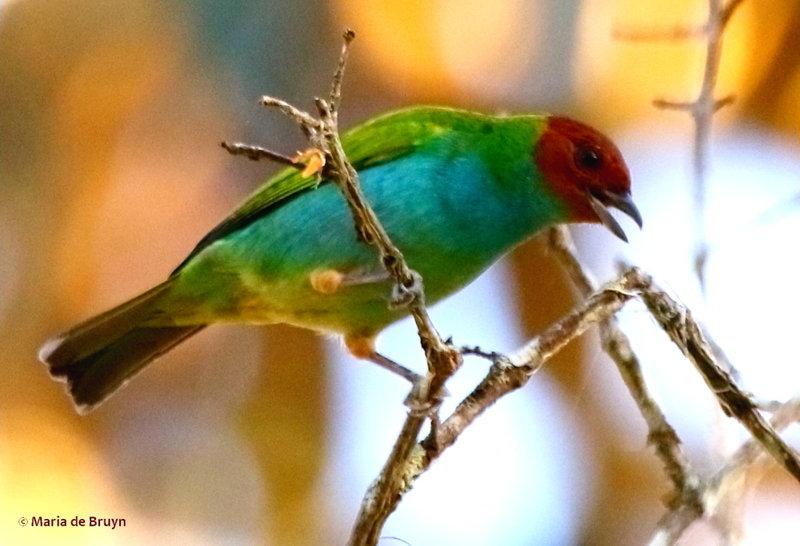 The feeders at the lodge had a black-headed male green honeycreeper (Chlorophanes spiza) visiting along with a lovely male Cherrie’s tanager (Ramphocelus costaricensis) whose red feathers looked like a fringed shawl covering his lower back. 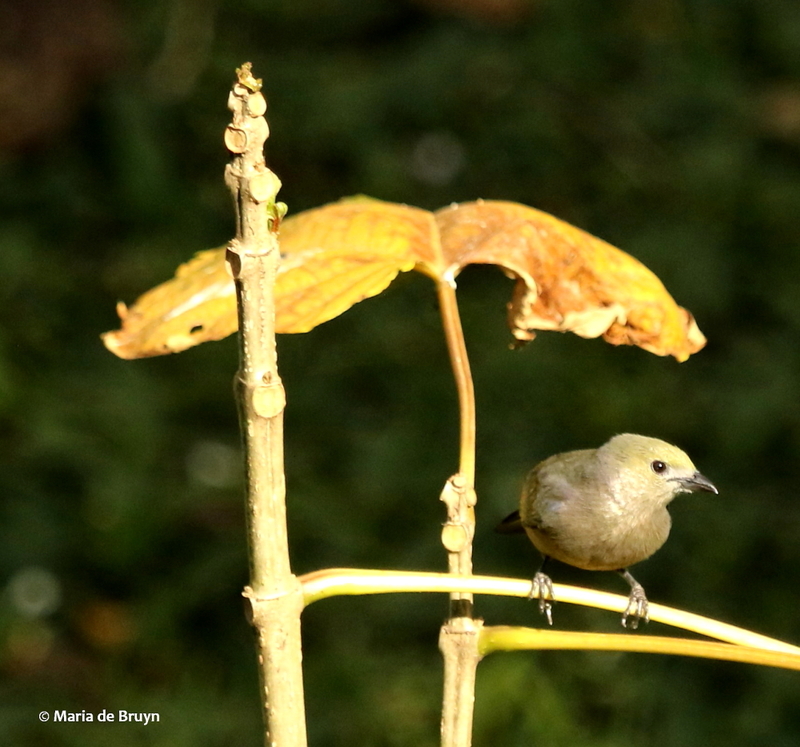 The next morning the female honeycreeper came by as well. 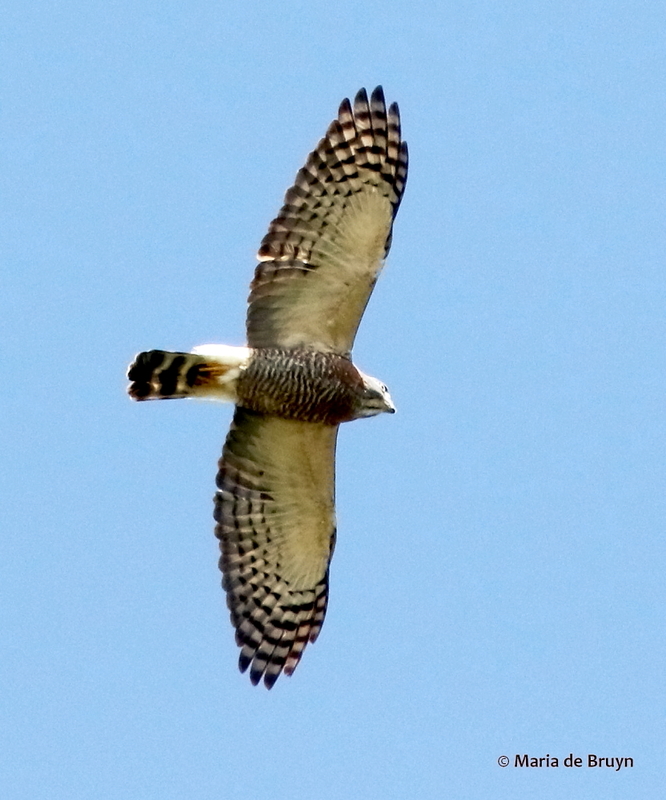 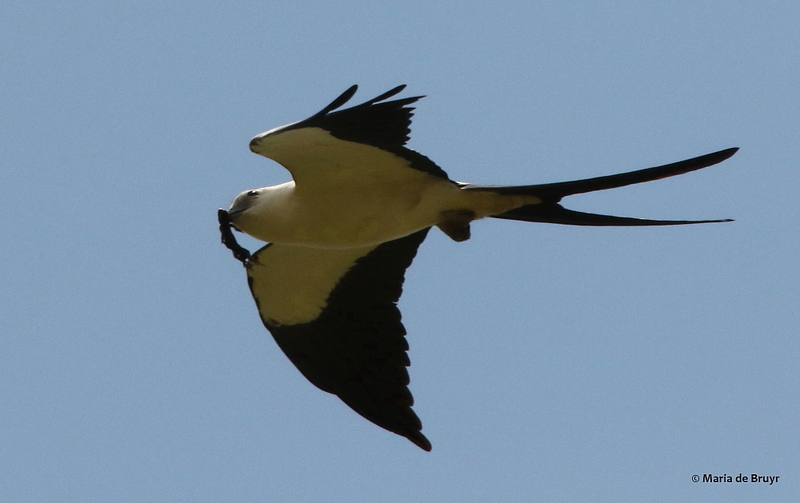 Our first trip of the day involved a visit to the UNA (Universidad Nacional) campus, where I had my first views of a double-toothed kite (Harpagus bidentatus). 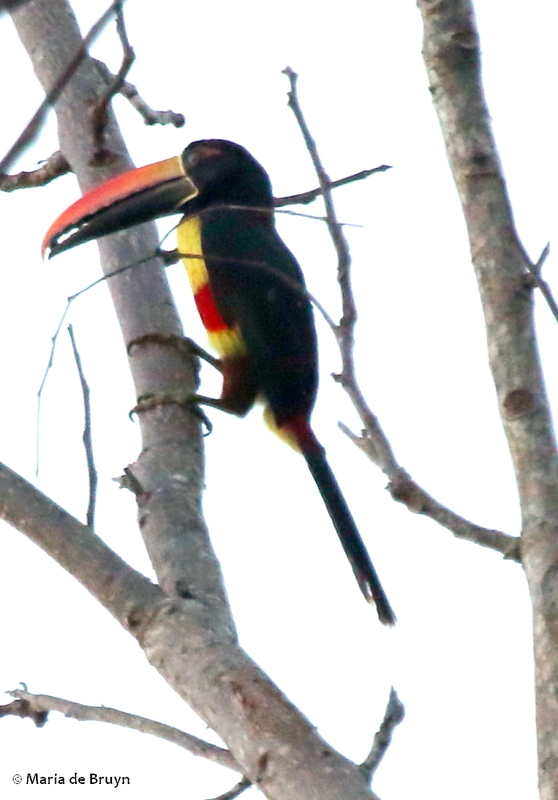 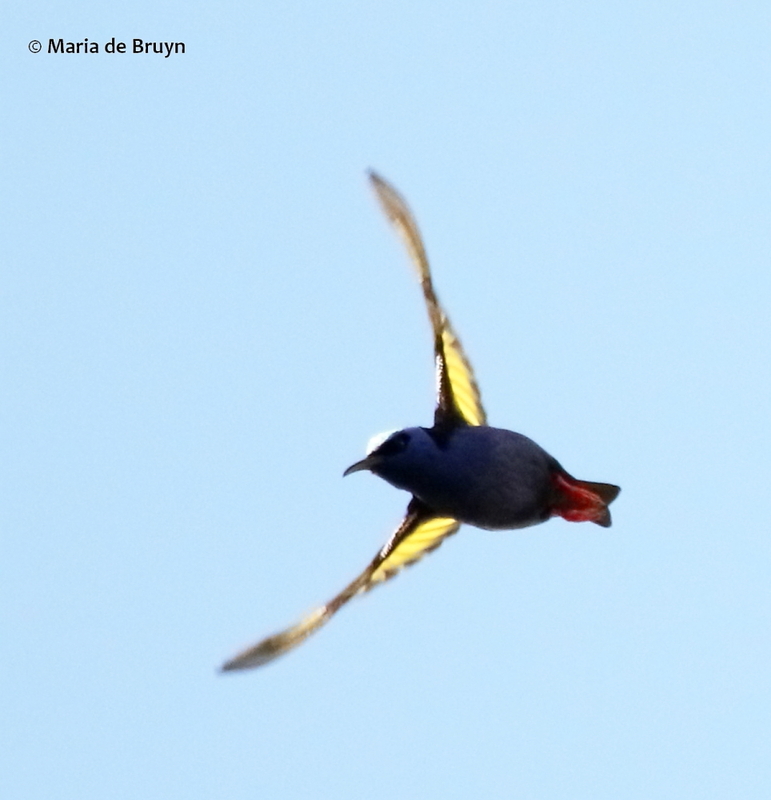 The stripe underneath its chin, along with its coloring, made it a very attractive bird for me. 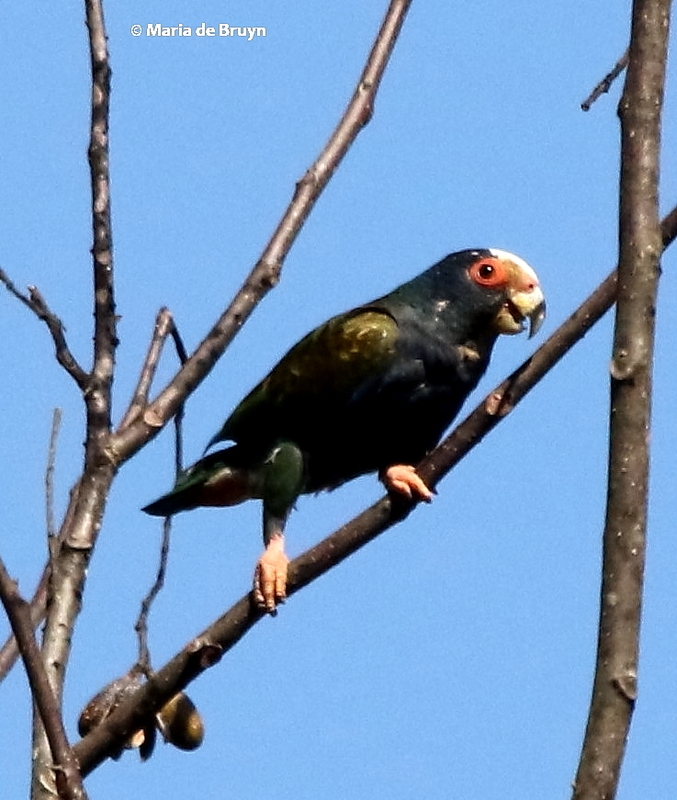 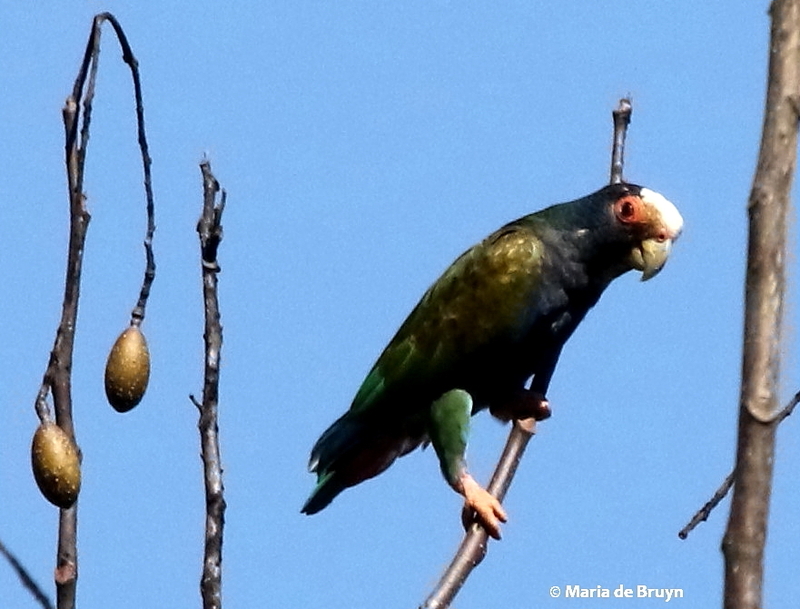 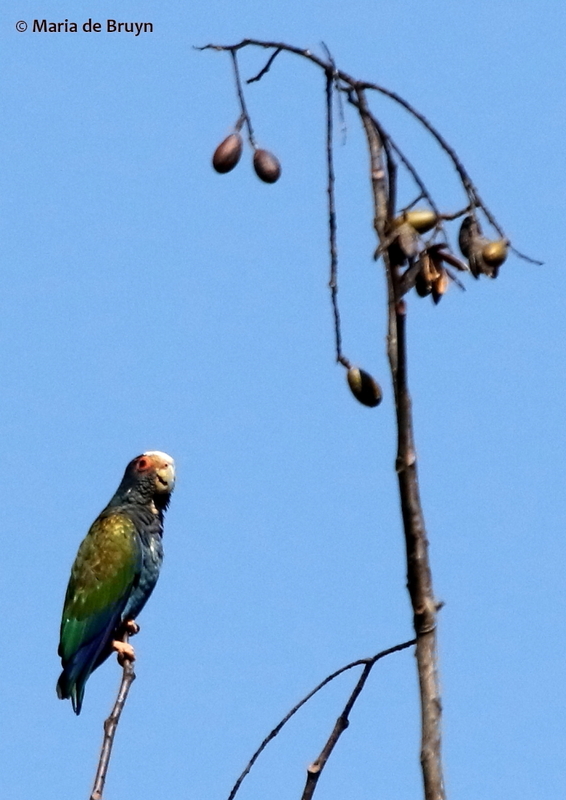 We then drove to another university campus site, stopping along a road where we saw a white-crowned parrot (Pionus senilis) in the distance. 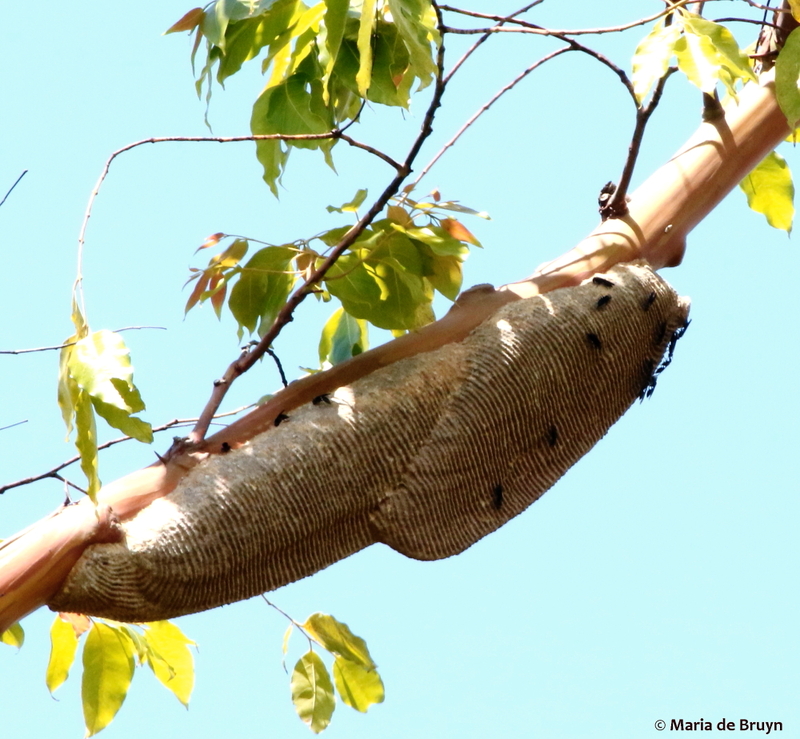 Our guide, Steve, had warned us to wear hats as we would be in areas with lots of cicadas, which are called chicharras locally. 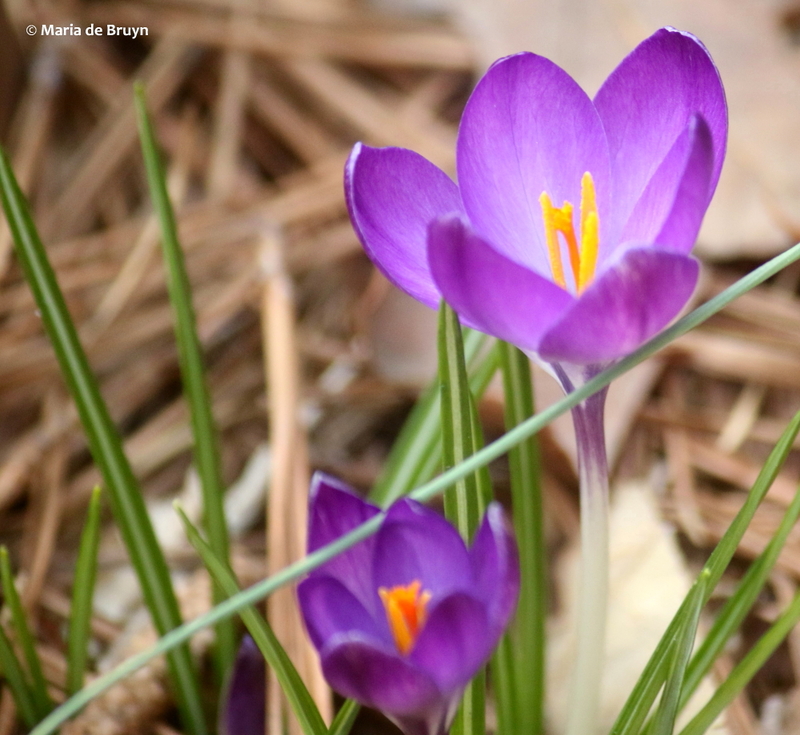 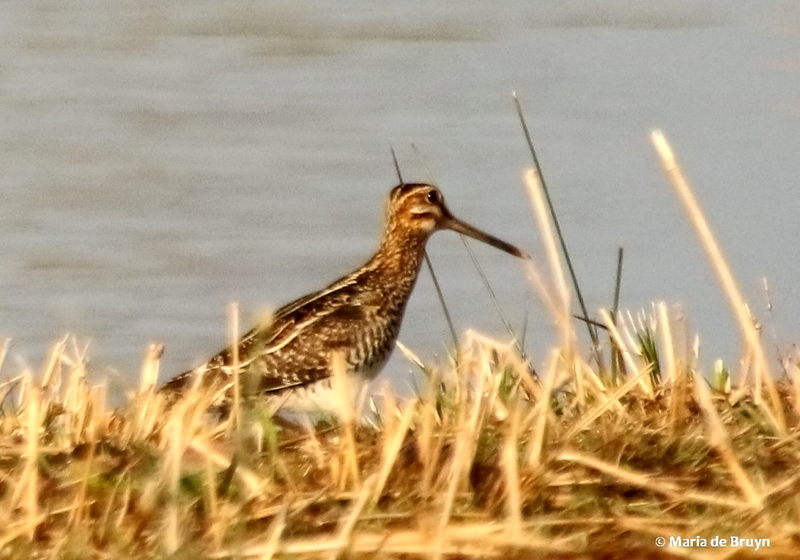 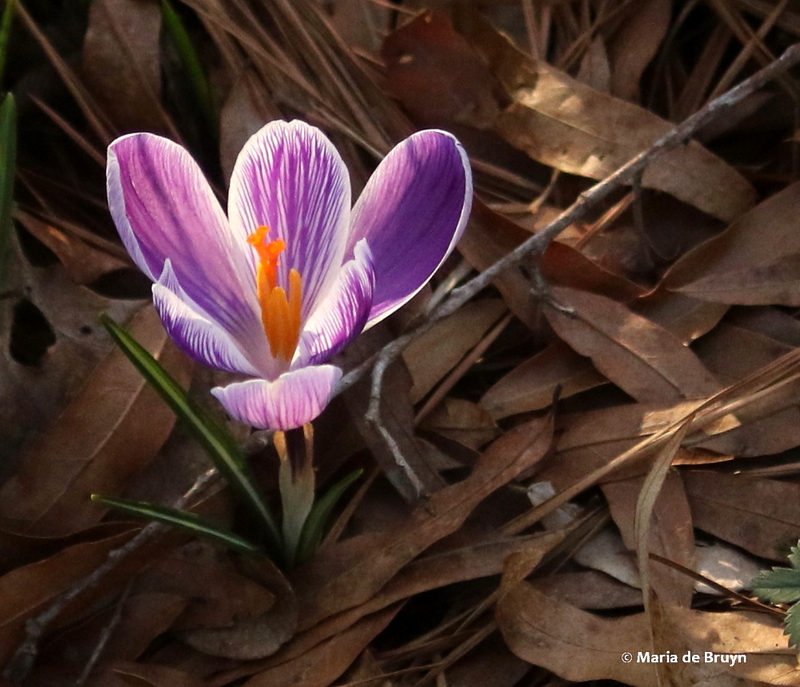 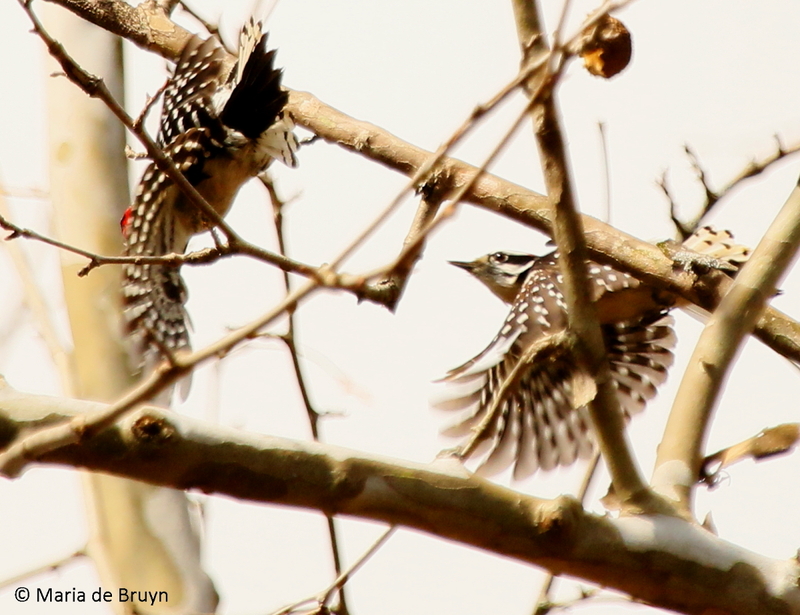 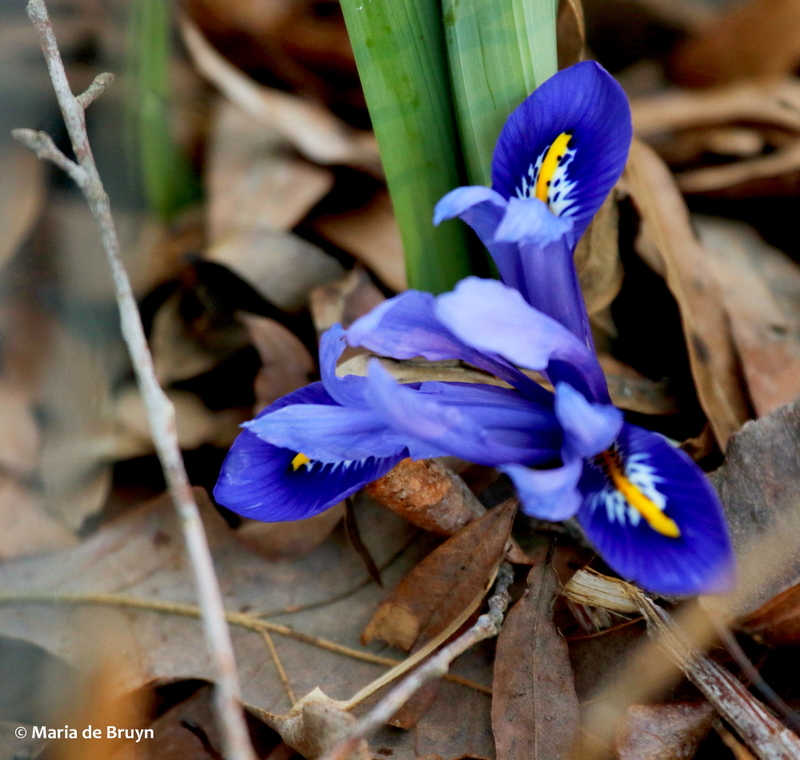 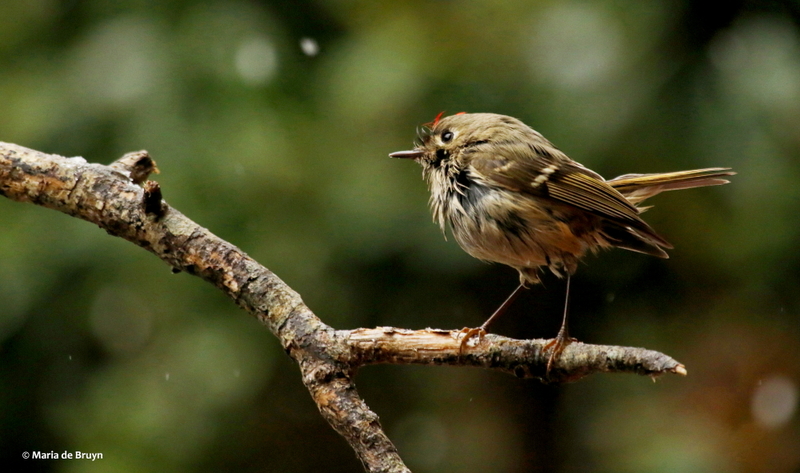 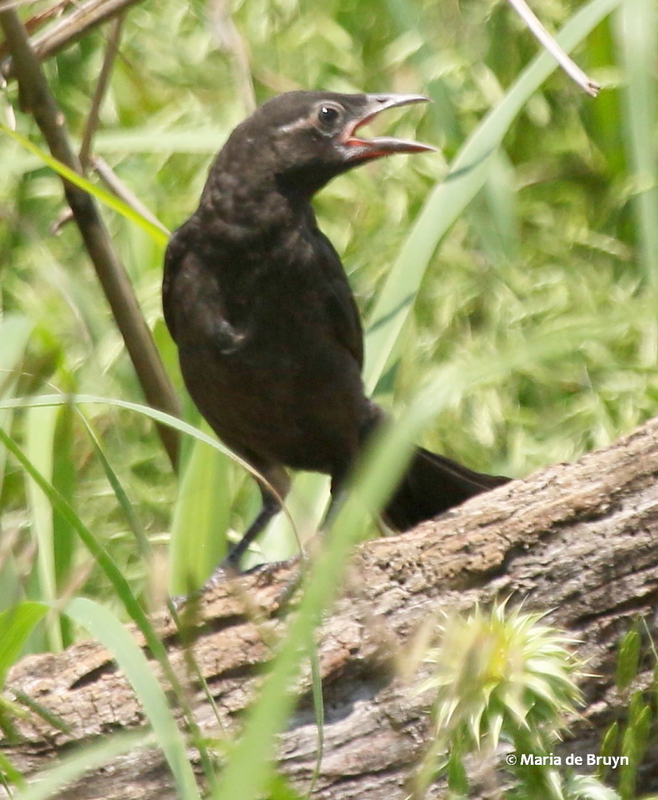 We had already heard them in the morning – there seemed to be at least hundreds of them in various wooded areas. 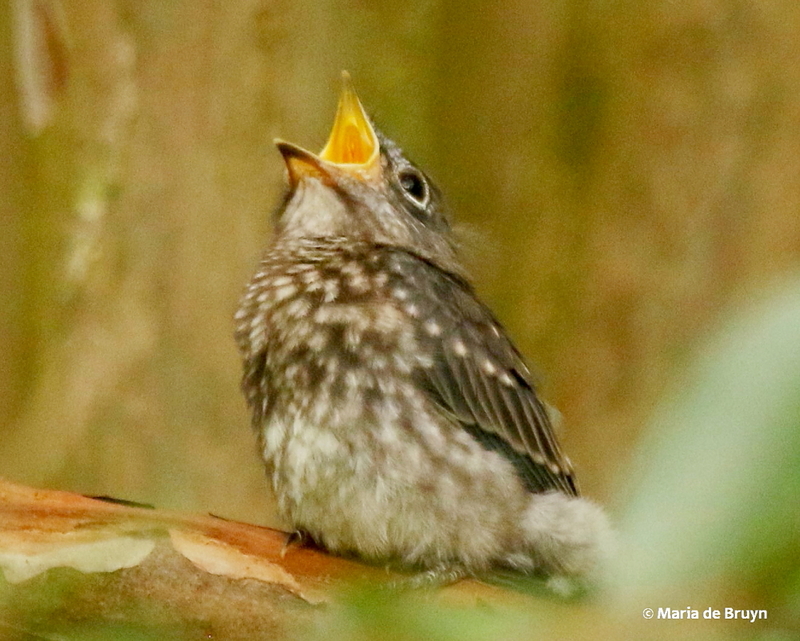 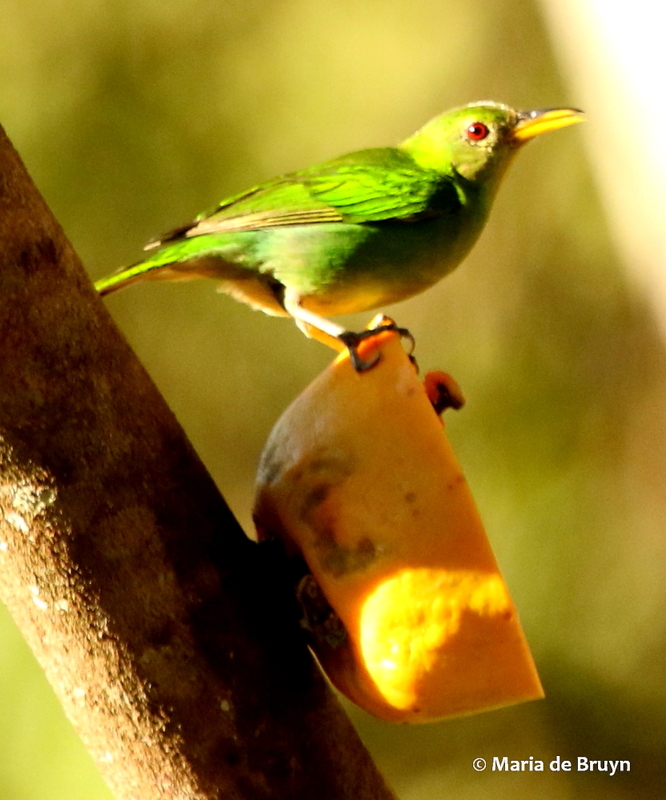 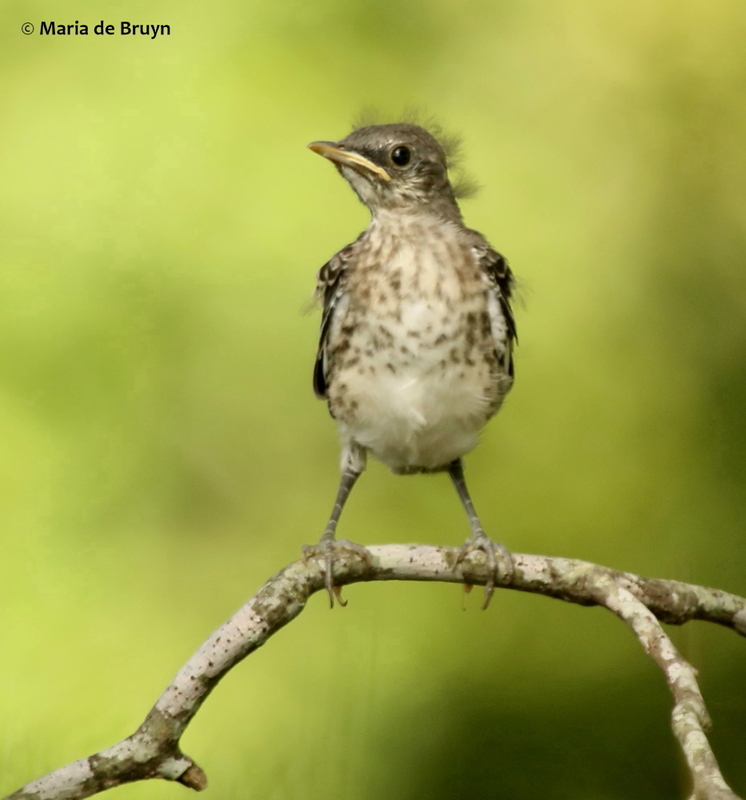 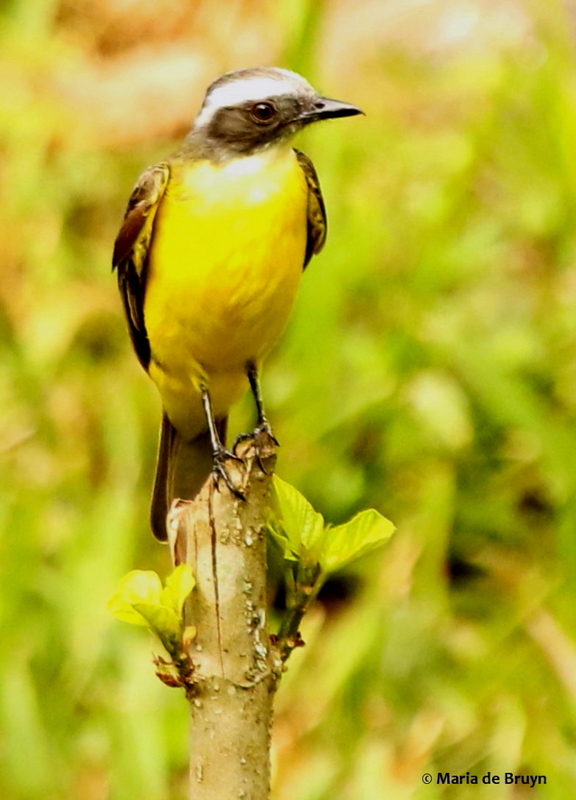 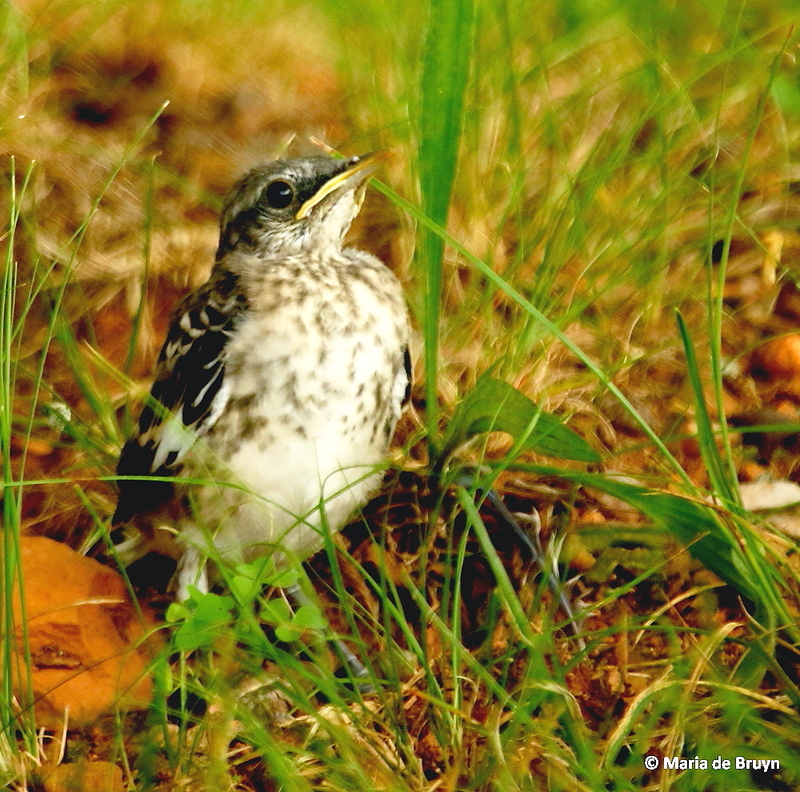 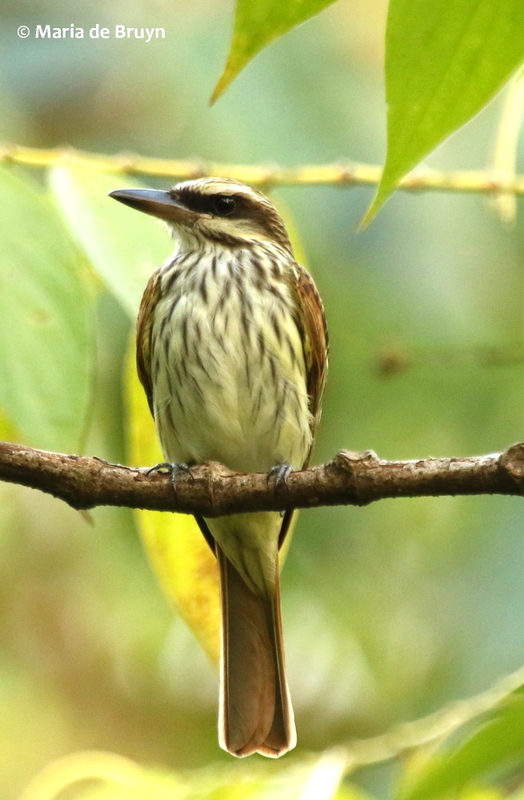 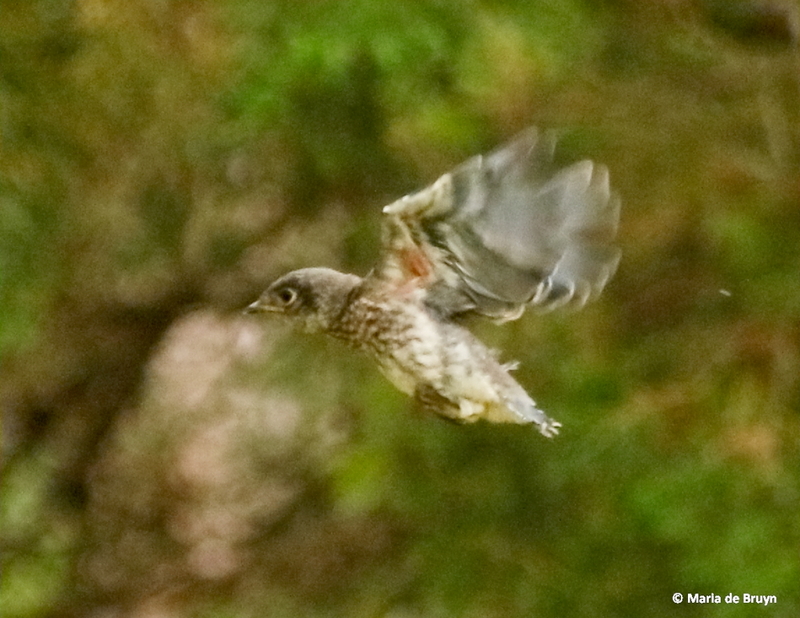 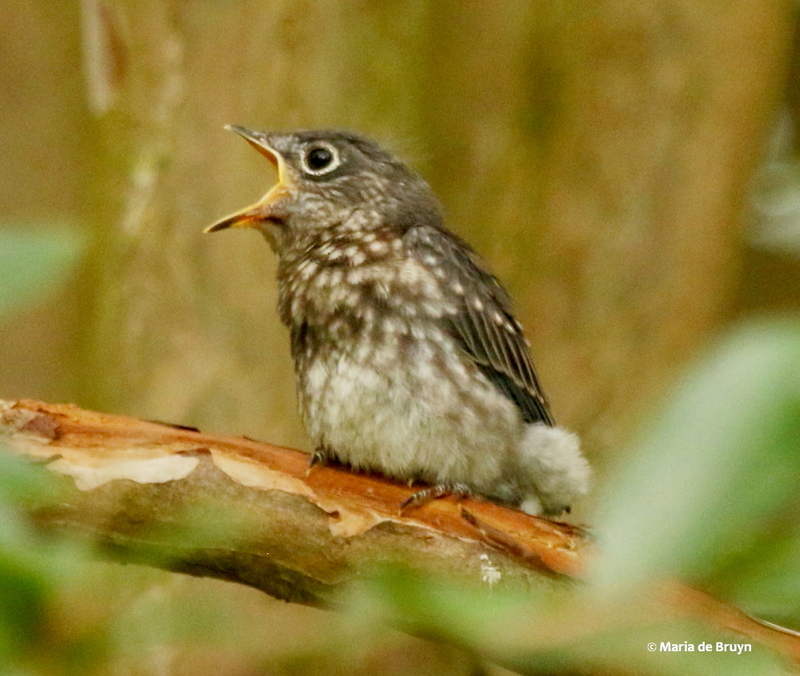 The 23 Costa Rican species emerge from underground during the breeding season of several bird species that feed on them, such as motmots, trogons and flycatchers. 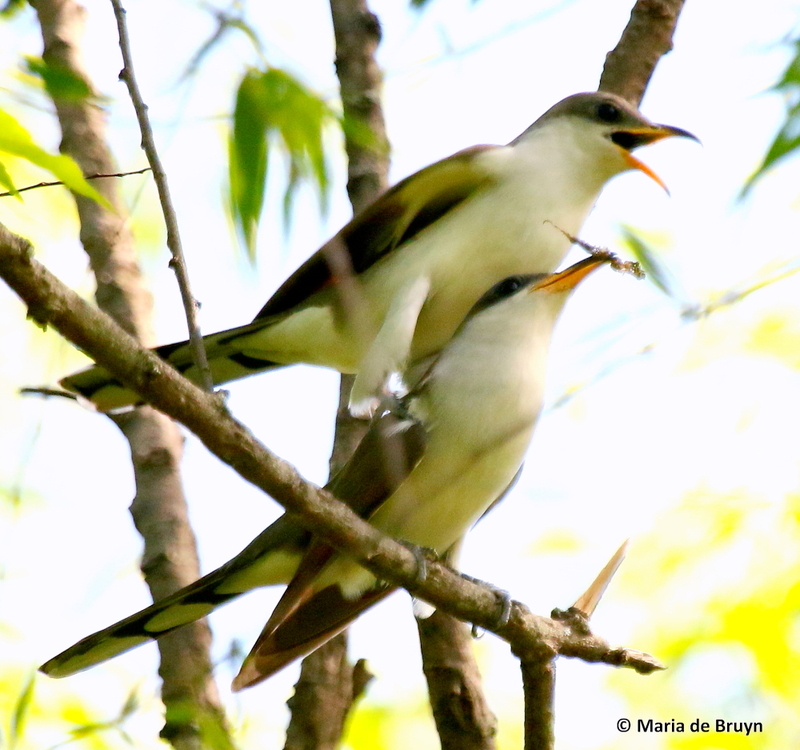 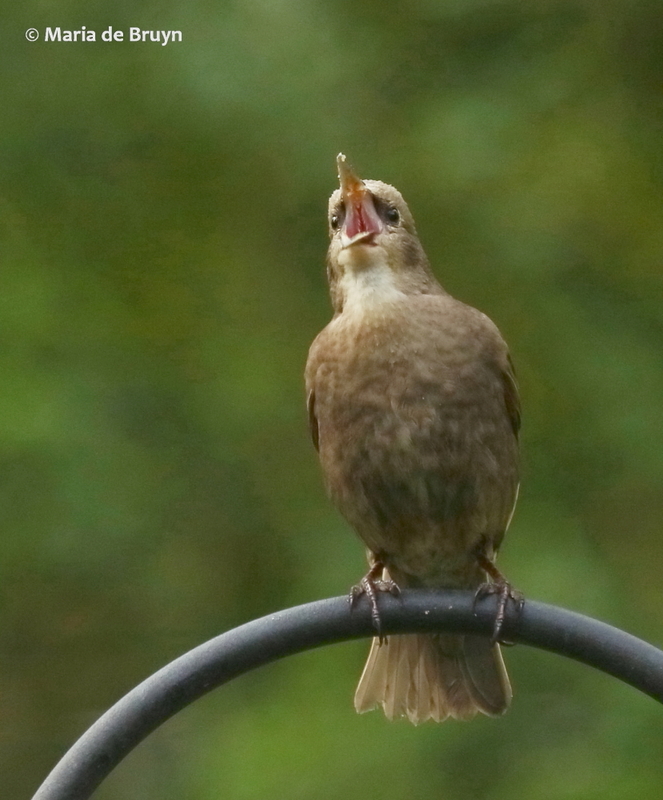 Their cacophony of mating calls was sometimes so loud that you had to speak loudly to other people to be heard over it. 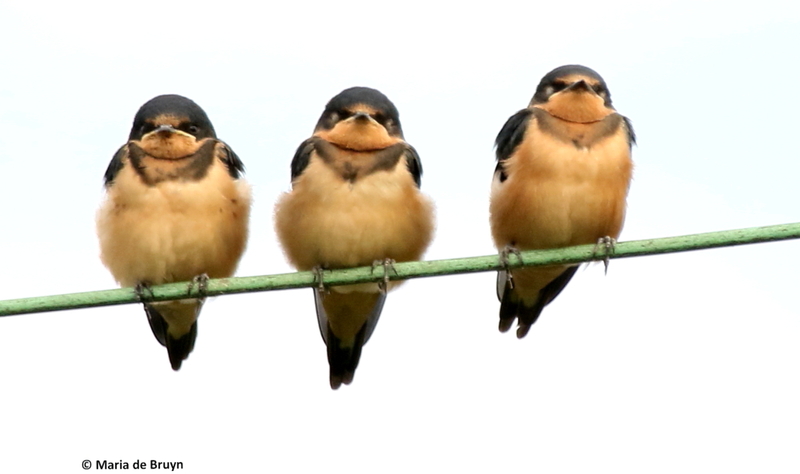 But why would we need hats – don’t they just perch in the trees and call? 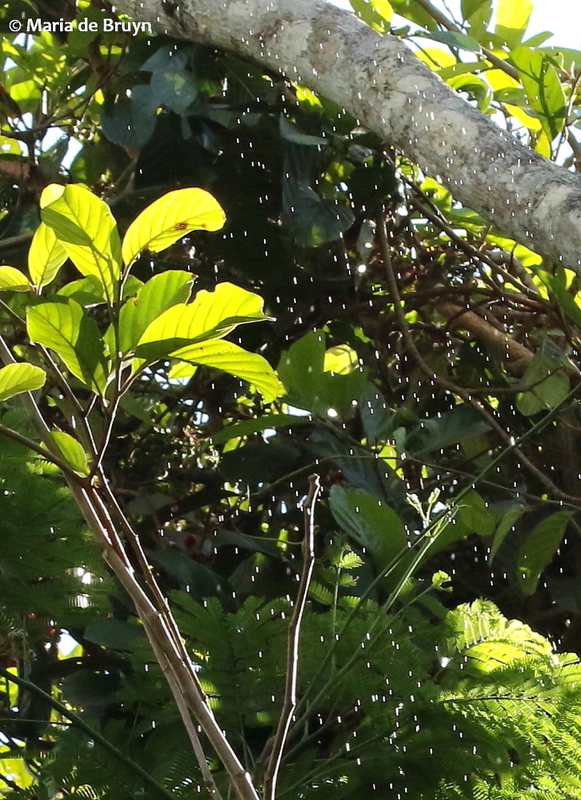 As I stood on the road, photographing the parrot, I thought we had run into a quick shower – then I realized what the slightly sticky (to me) droplets were – cicada rain!!! 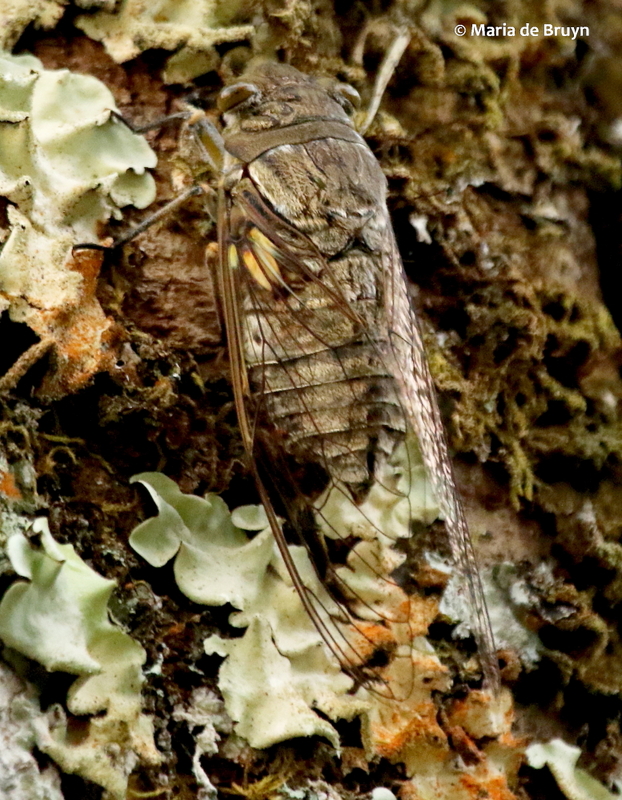 The cicadas drink xylem, which is tree sap, and urinate as they process the nutrients– when they do so in large numbers and you are standing underneath them, an umbrella would not be out of place. 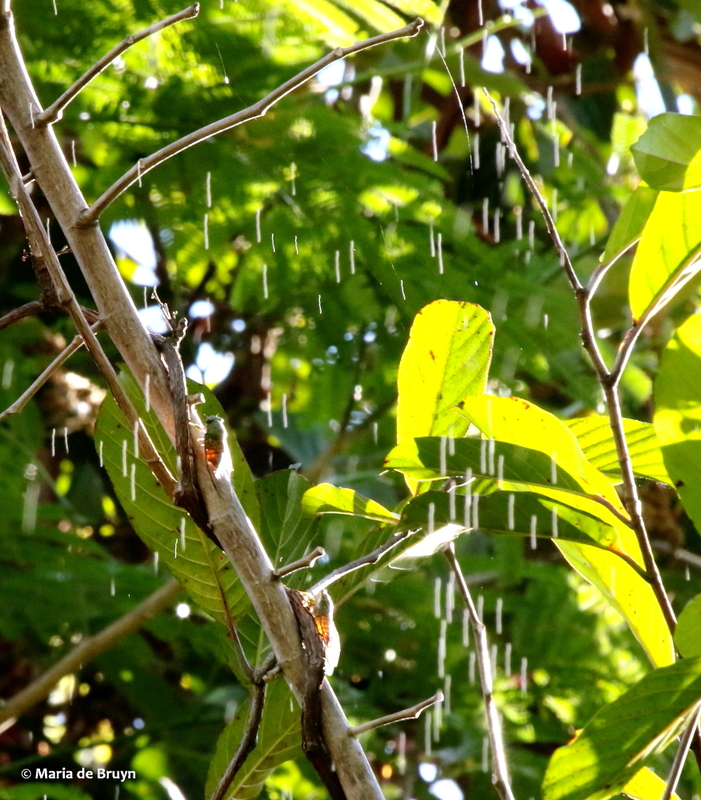 I tried to photograph the rain to give an idea of the falling pee. 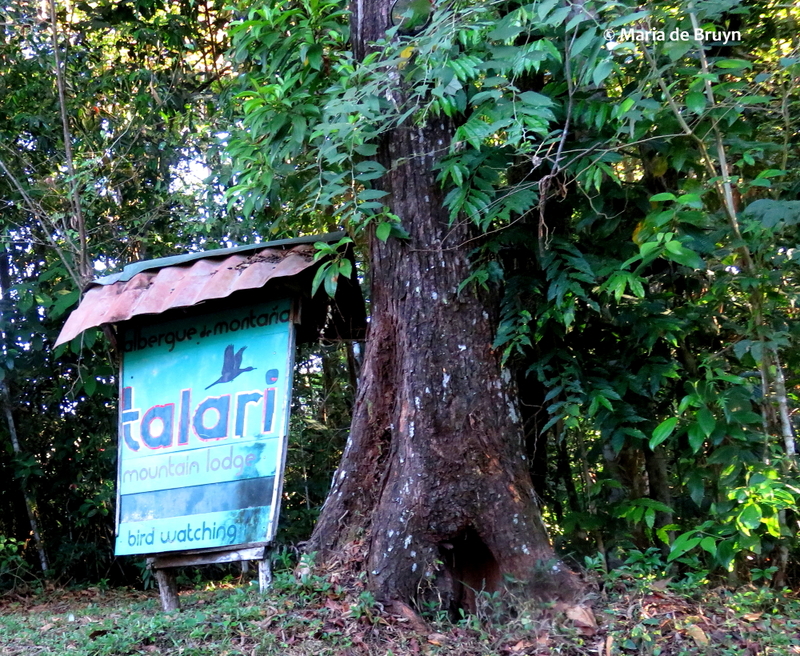 More on Talari Lodge and its surroundings in the next blog! 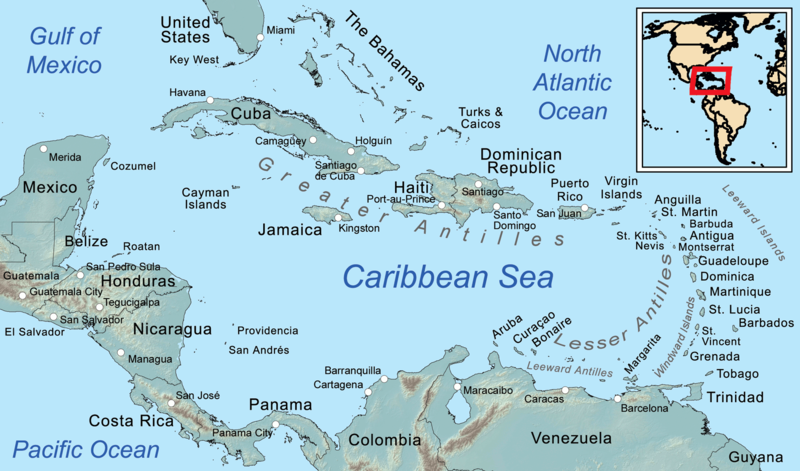 The tragedies being faced in the Caribbean islands after hurricanes Maria, Jose and Irma are horrible and other than donate cash to help alleviate the needs, I’m not in a position to offer more assistance. 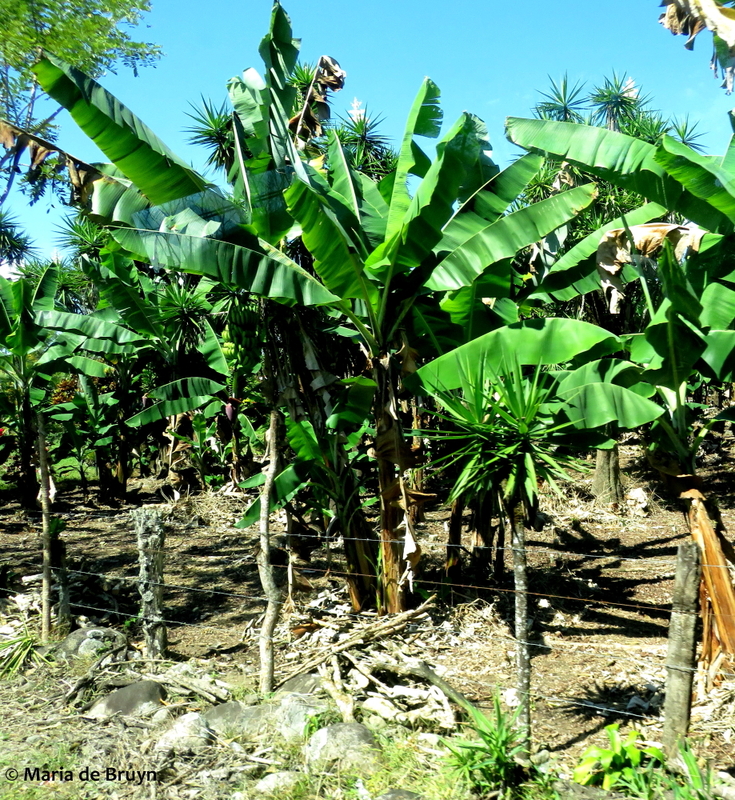 I’m grateful for all those who can and hope government assistance will be forthcoming to help all the people in those nations recover. 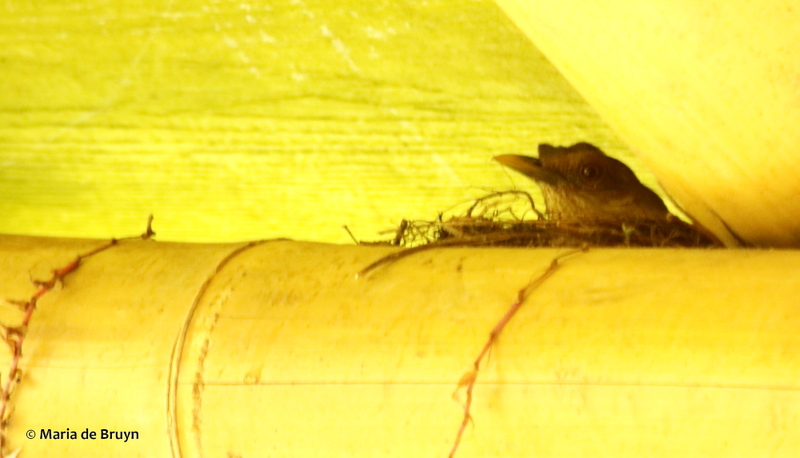 The effects of the hurricanes also will be noticeable for the wildlife. 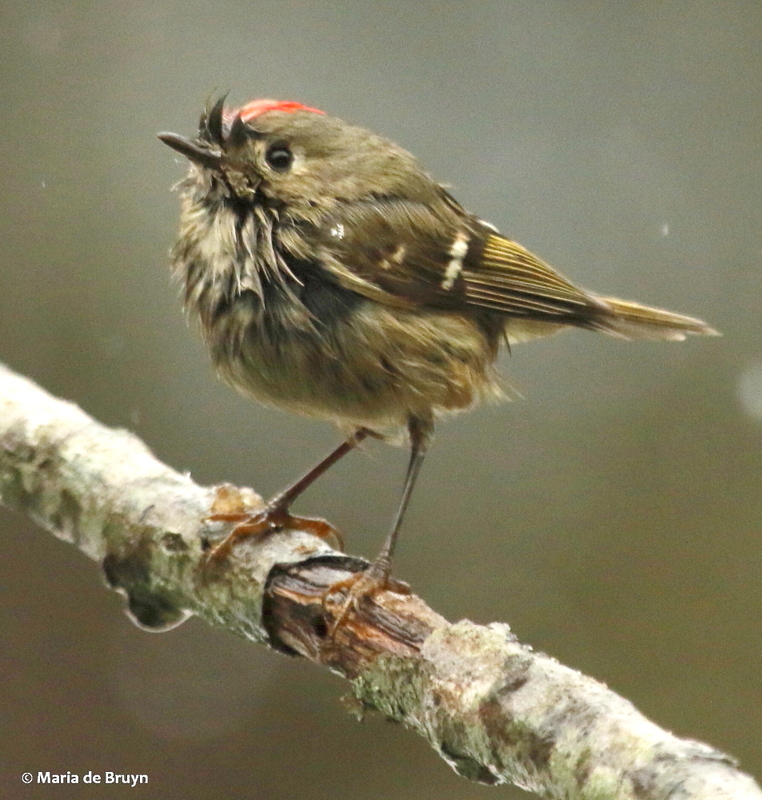 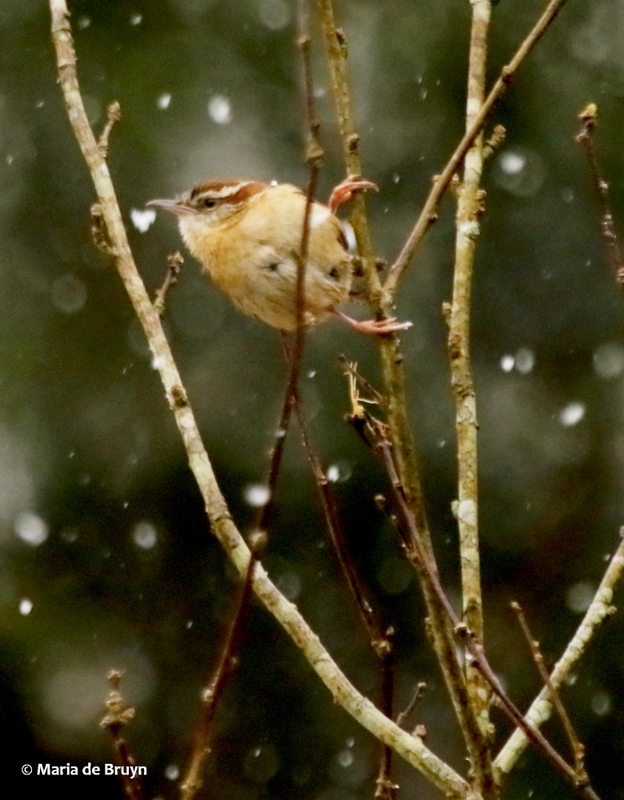 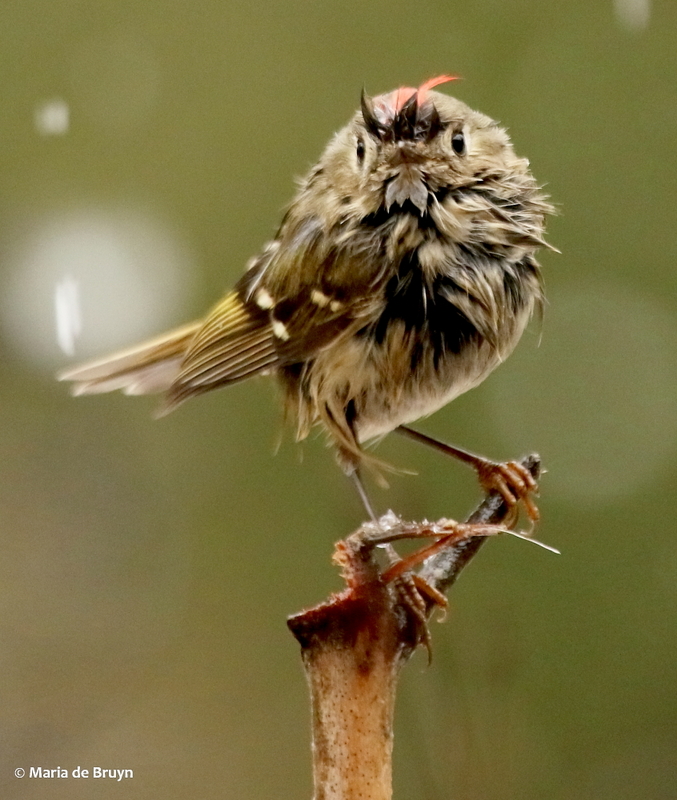 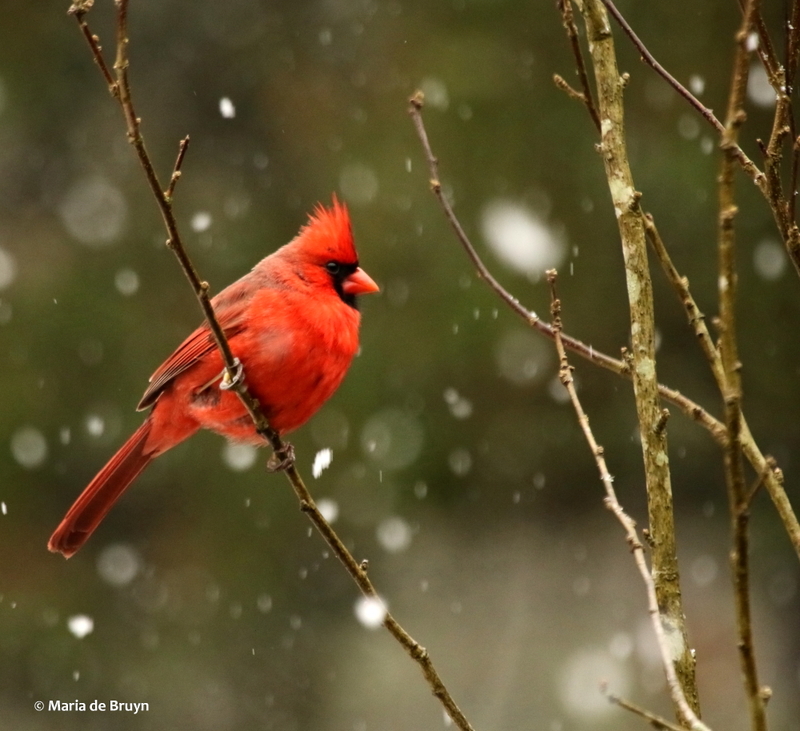 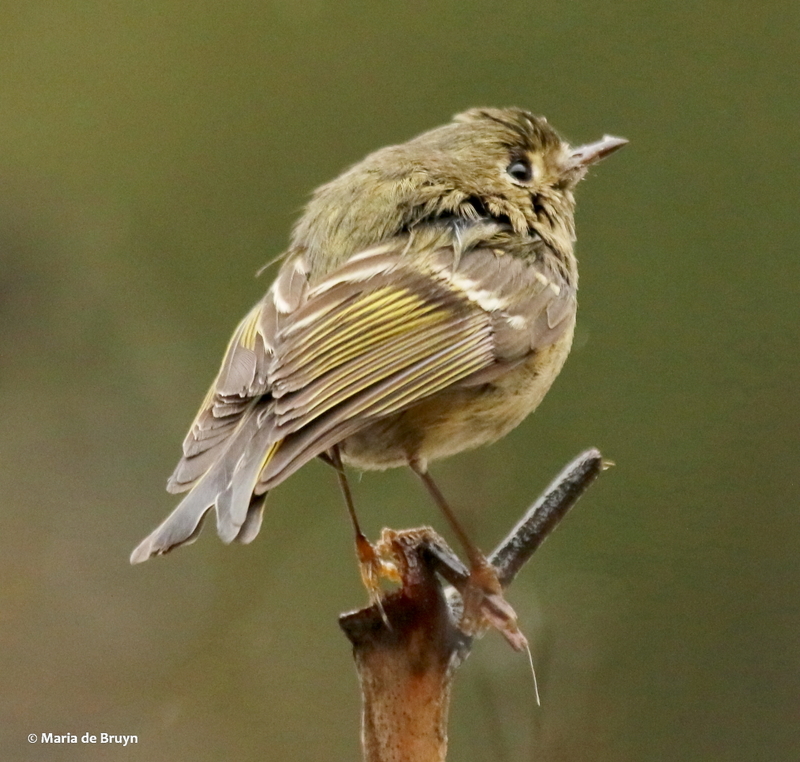 Many of those living on land will drown or die of hunger; some birds may be a little luckier – able to shelter against the winds if they are native to a place or able to change their migratory pattern (e.g., delay arrival on wintering grounds) for a time. 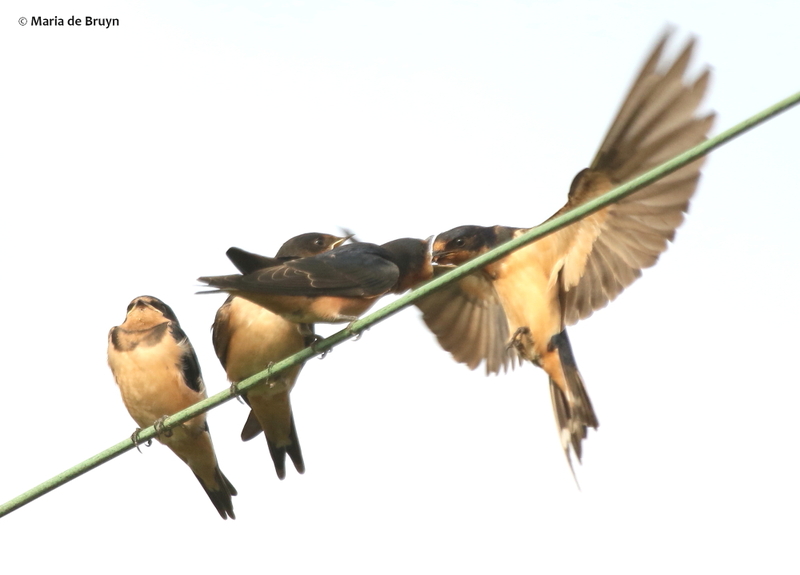 But when the effects of the storms are immense with lots of habitat destruction, the birds, too, will lack places to shelter and not have sufficient food supplies to survive. 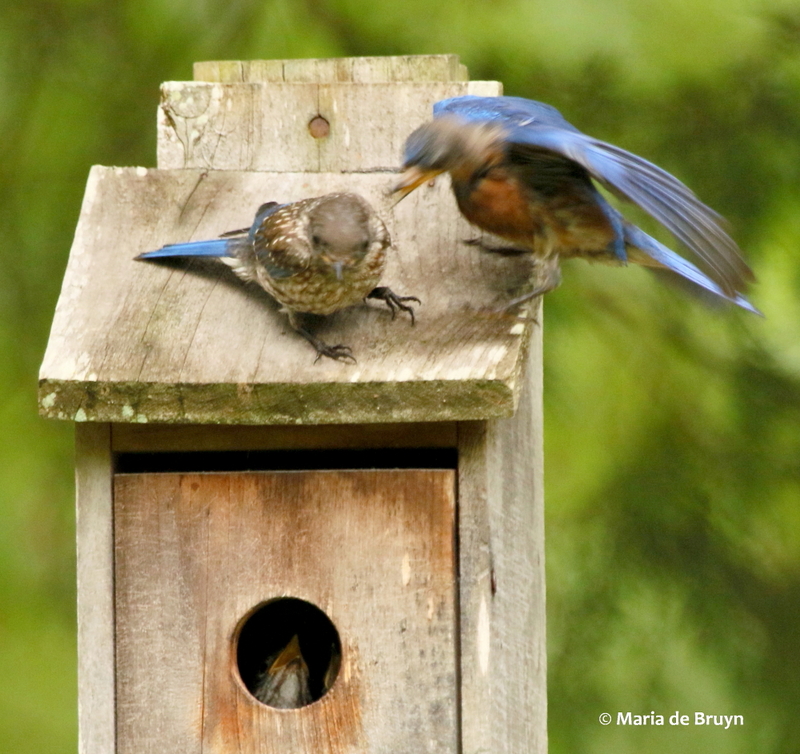 So, the process begins with courtship. 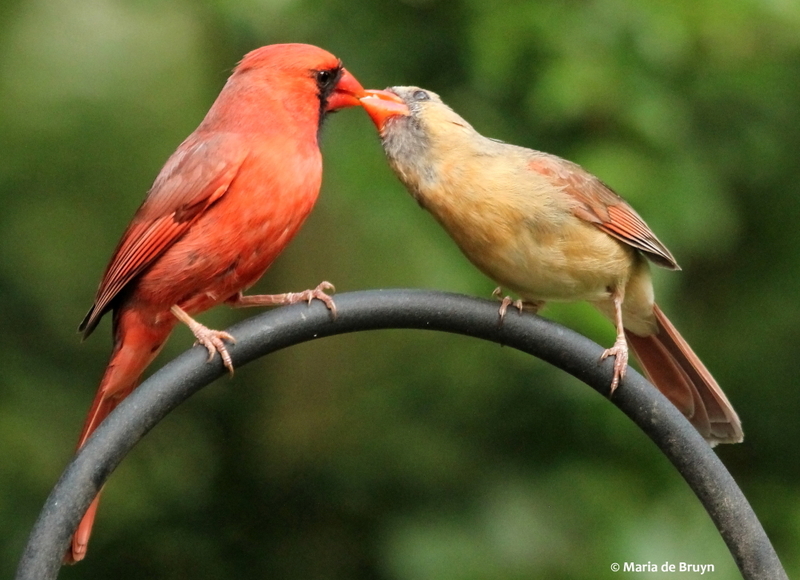 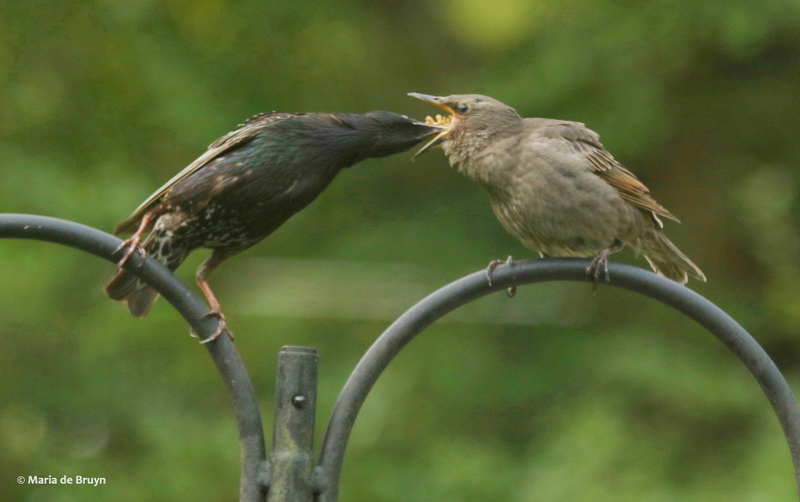 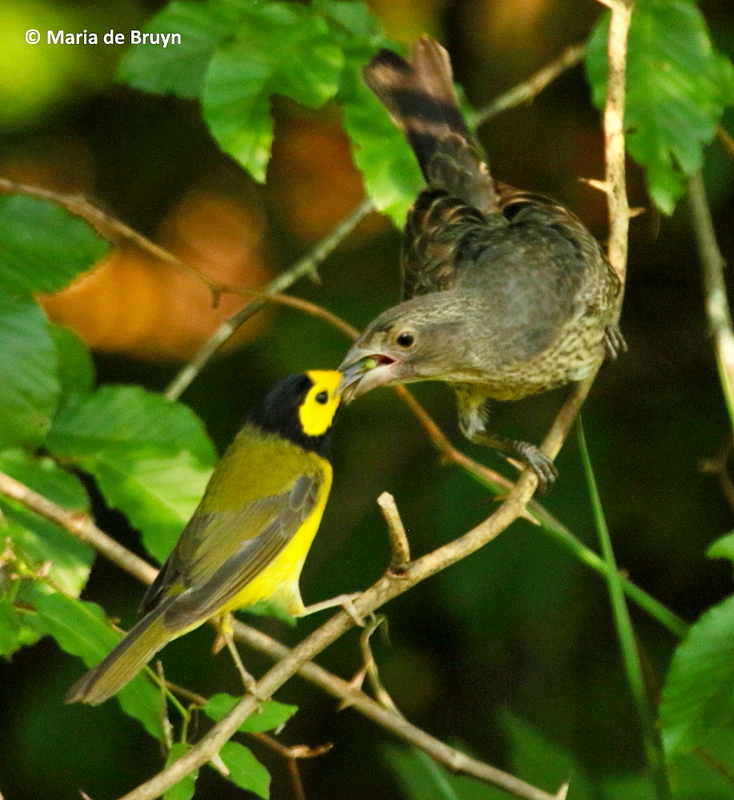 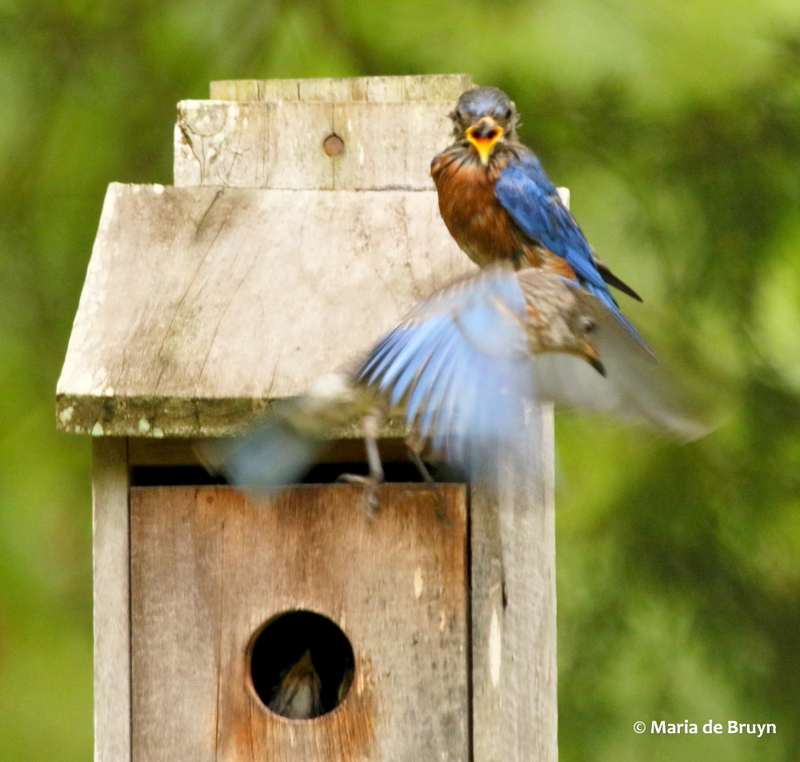 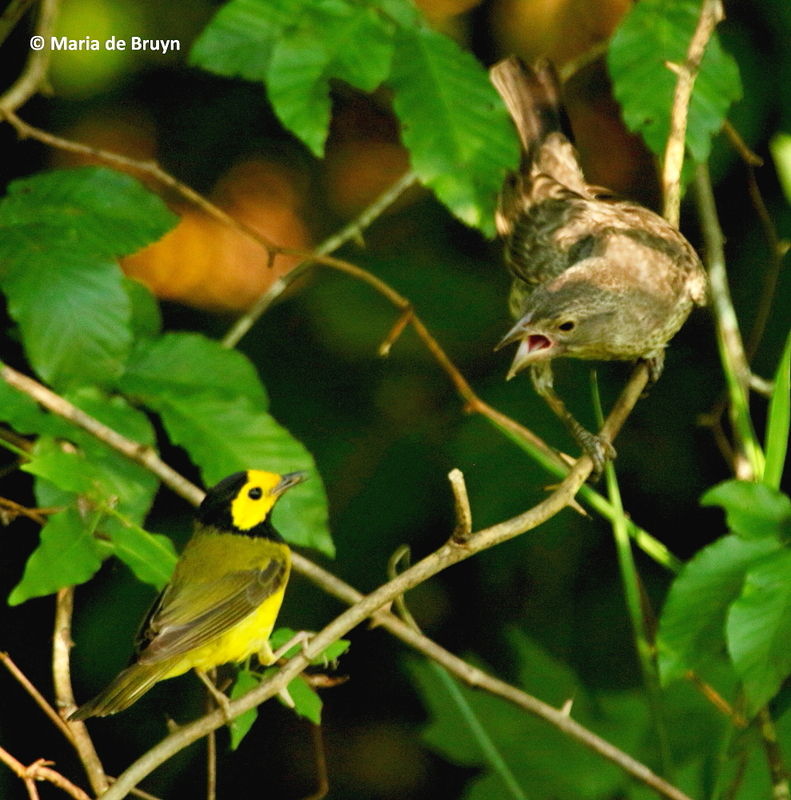 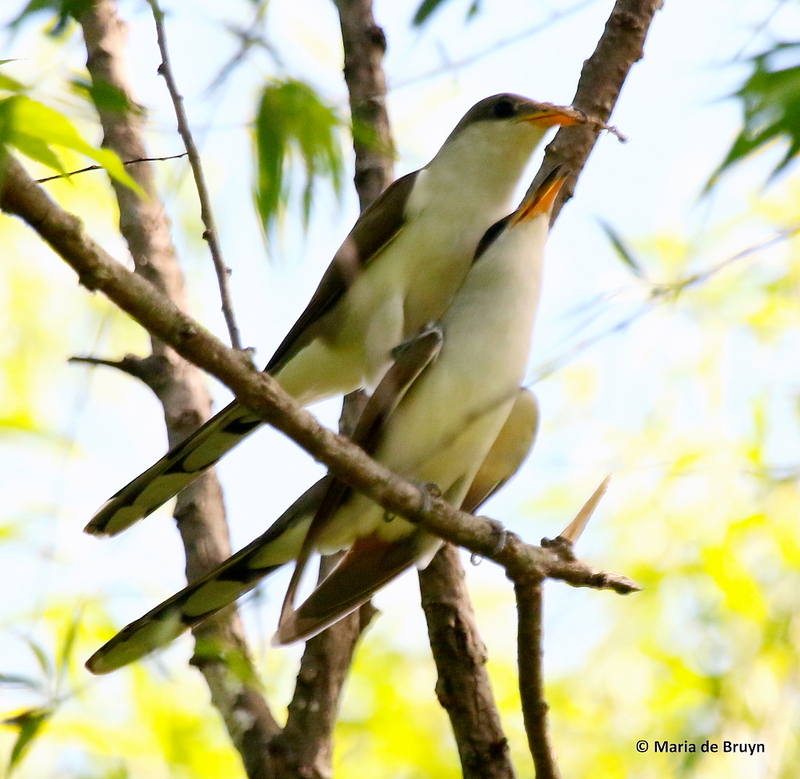 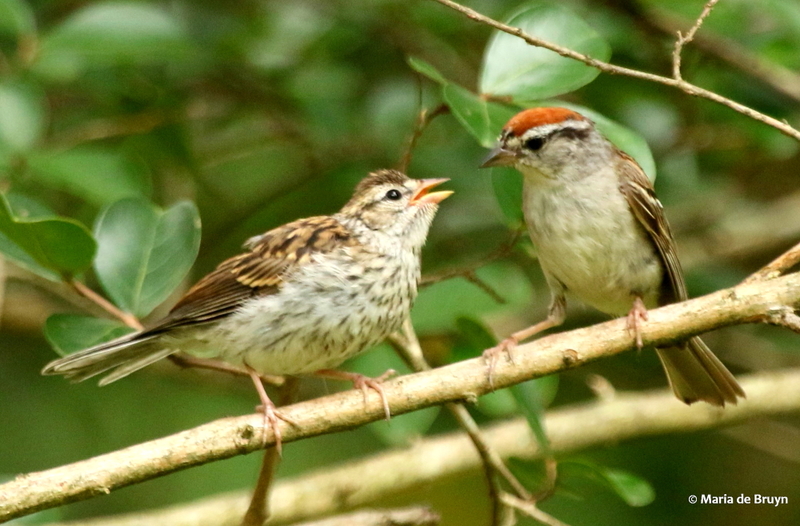 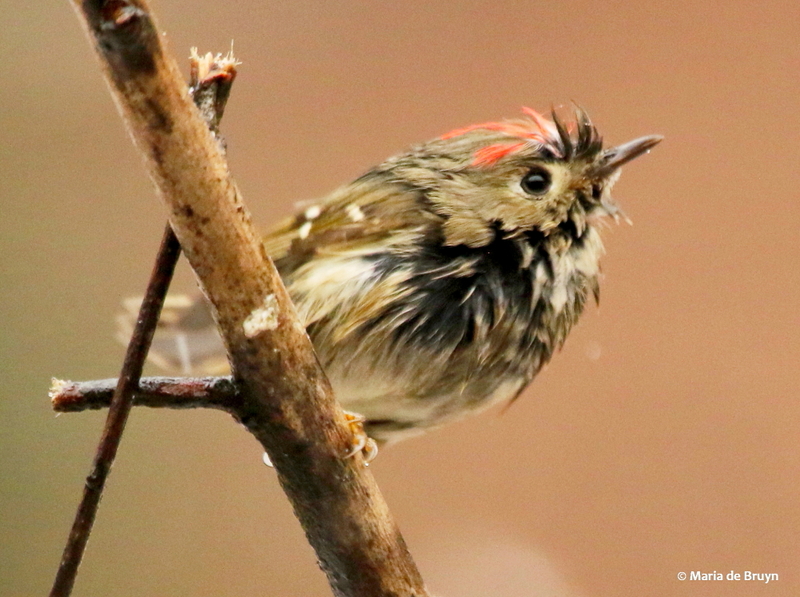 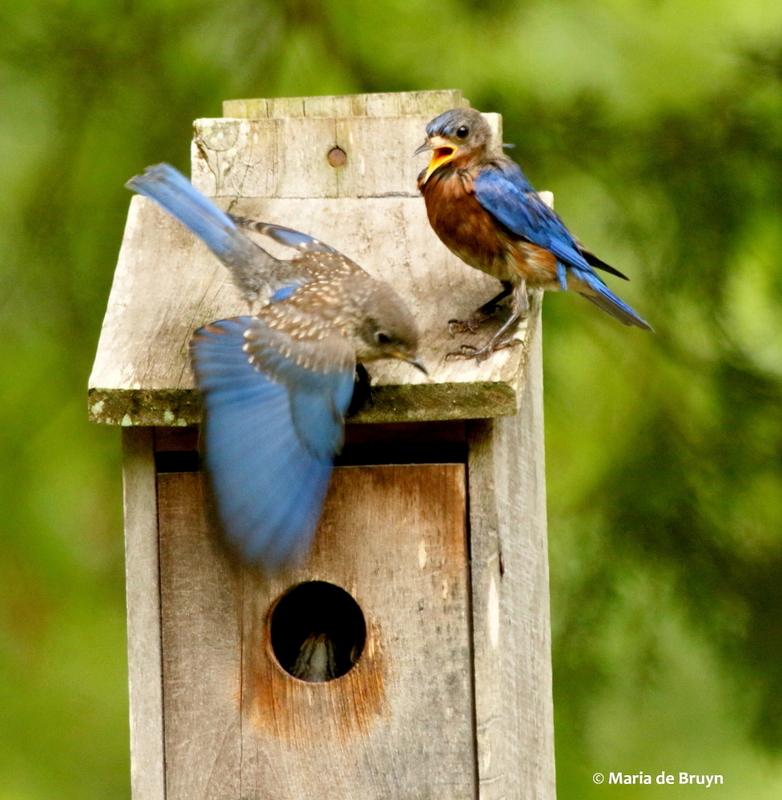 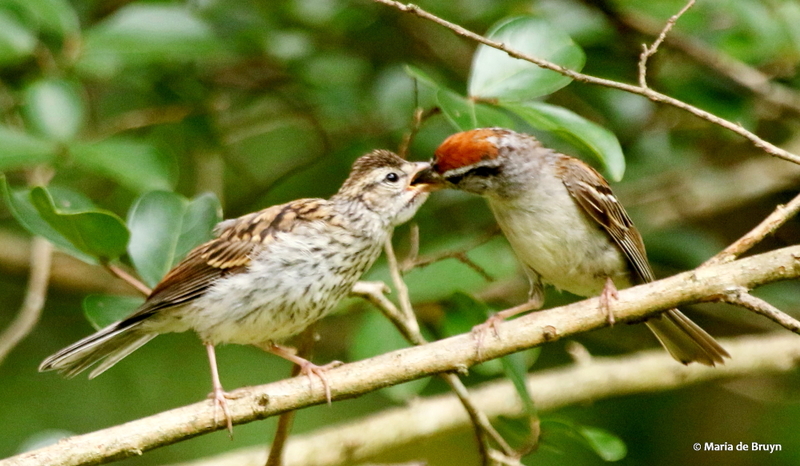 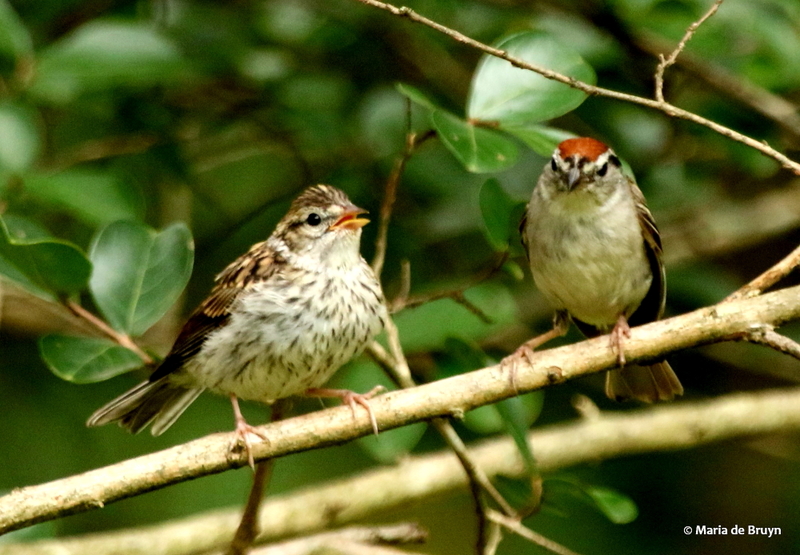 Some birds mate for life, or at least form long-term (multiple-year) bonded relationships. 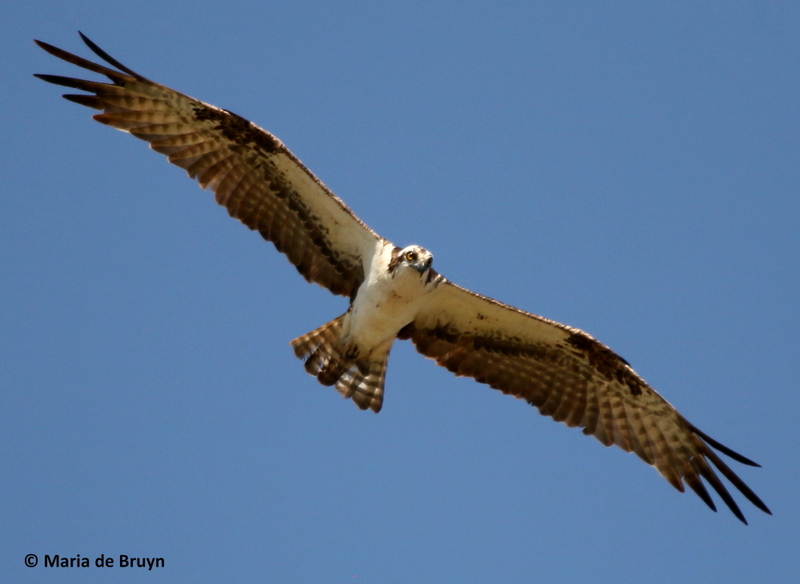 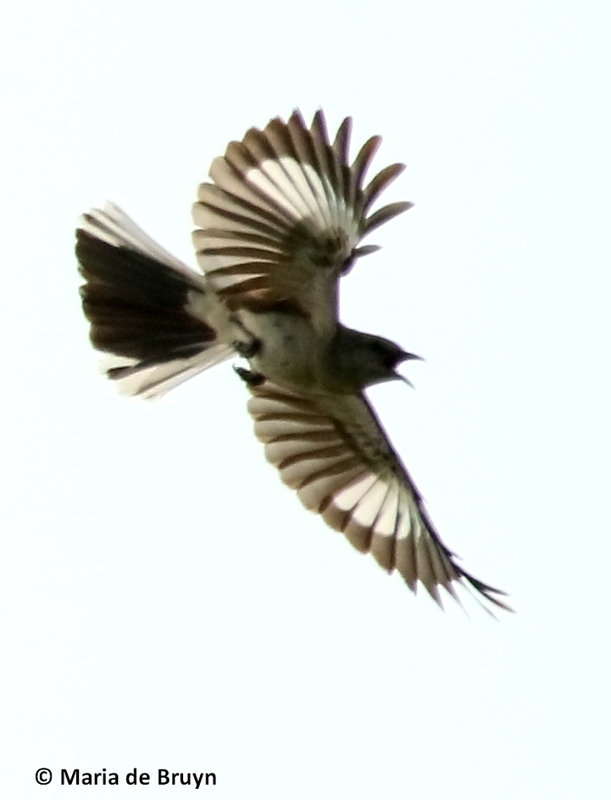 They include bald eagles, black vultures, blue jays, Canada geese, white-breasted nuthatches, brown-headed nuthatches, Northern cardinals, Carolina chickadees, American crows, pileated woodpeckers and my favorite raptor shown above, the osprey (Pandion haliaetus). 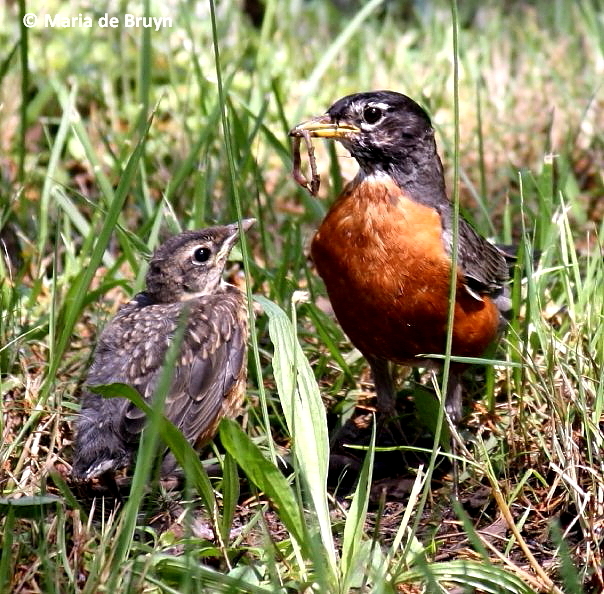 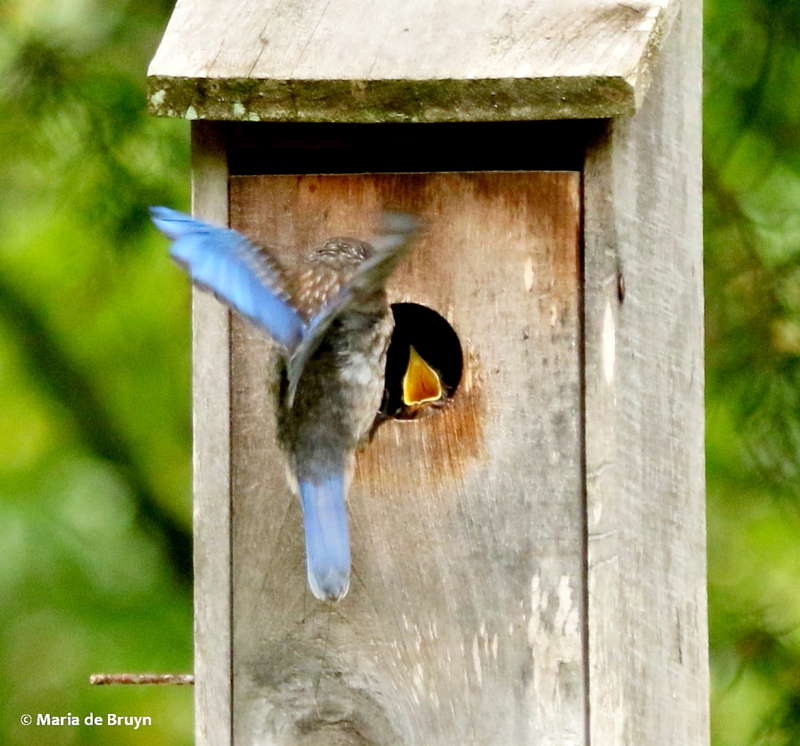 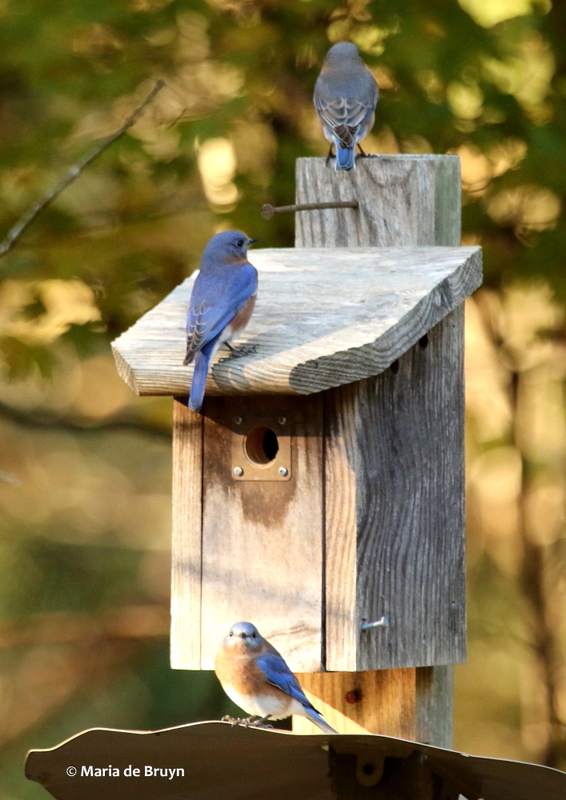 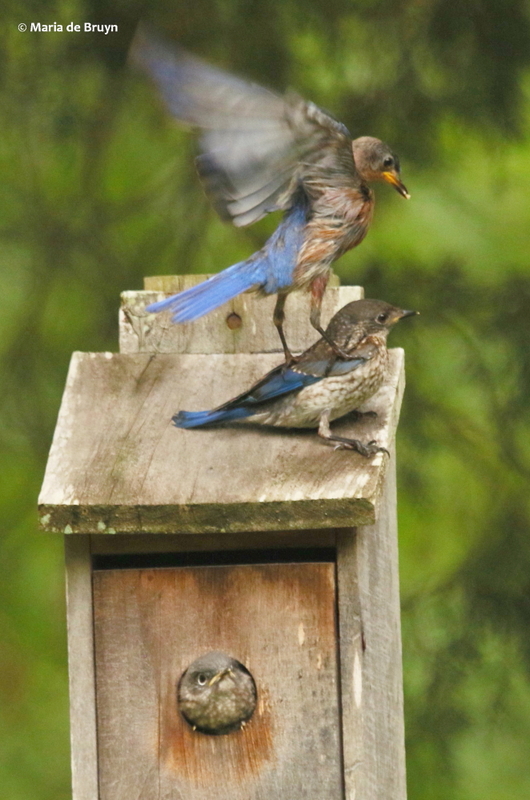 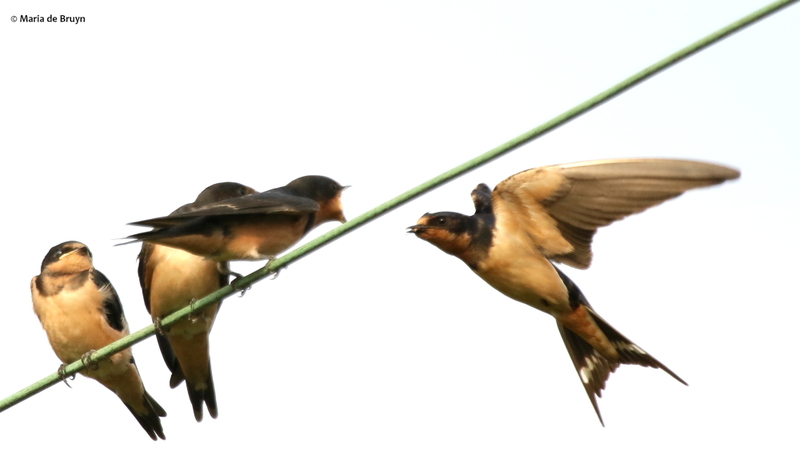 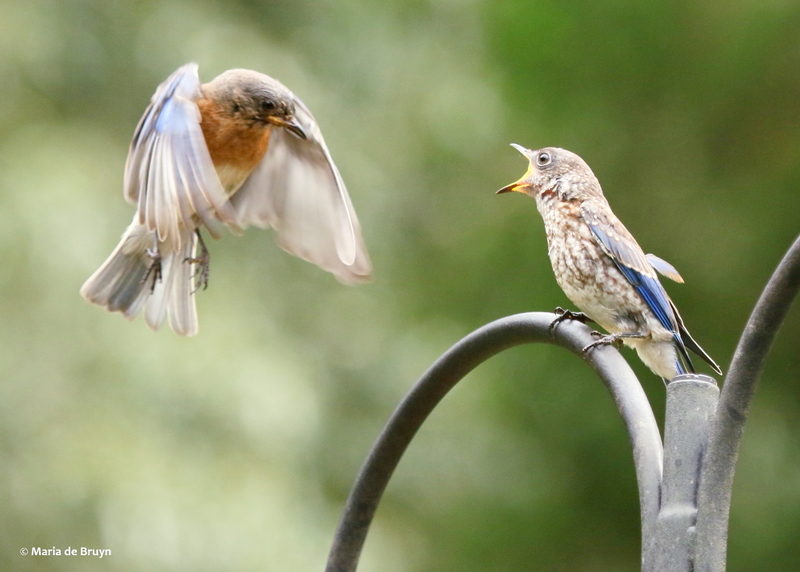 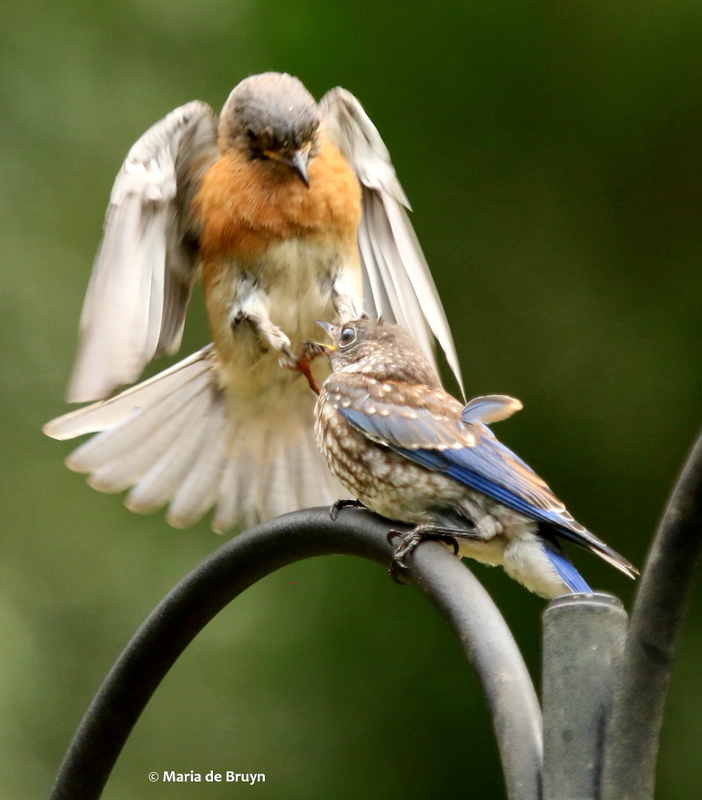 Those who form ongoing bonds may have a courtship period that consists of the male bringing the female some food to indicate it’s time to get ready for nest-building. 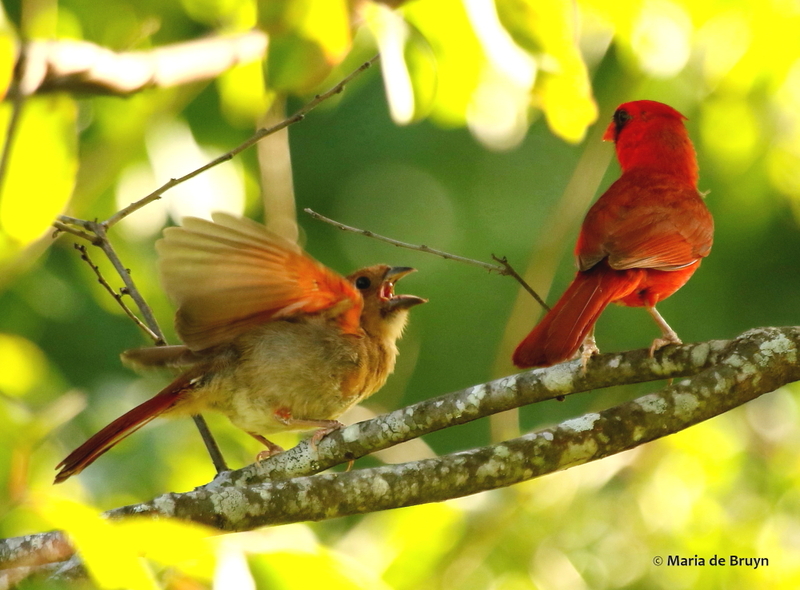 This was the case for these lovely Northern cardinals (Cardinalis cardinalis). 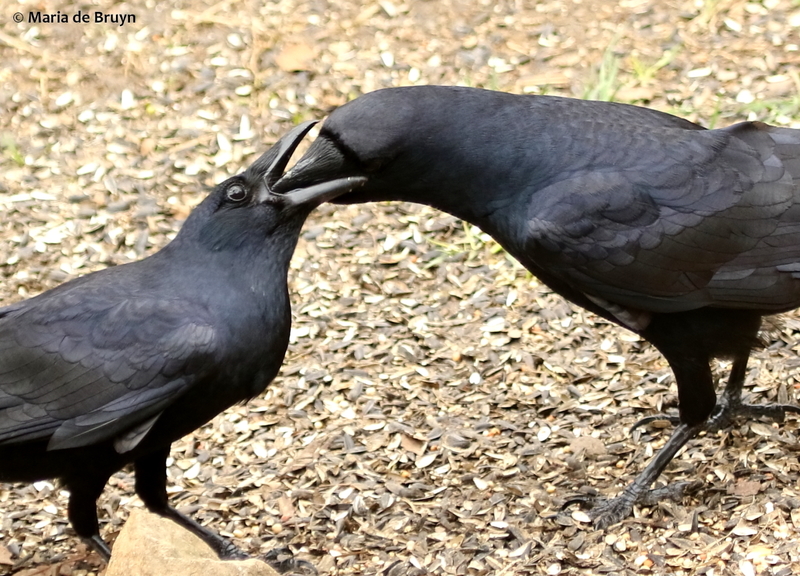 The American crow (Corvus brachyrhynchos) has a similar behavior; in my yard, I sometimes throw out bits of apple or bread for them in the spring as these seem to be considered real treats. 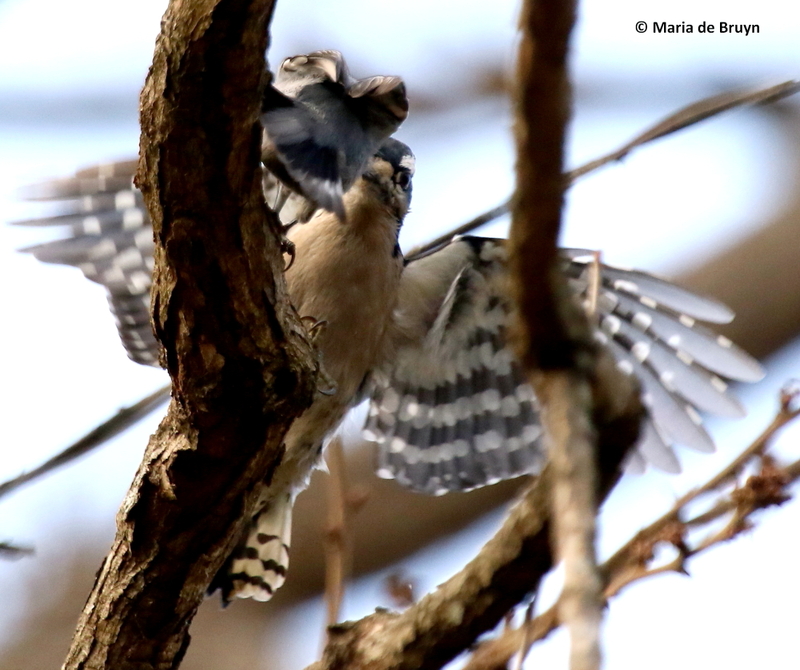 The female will sit on a branch overhead calling until the male brings her some – and sometimes almost shoves it down her throat! 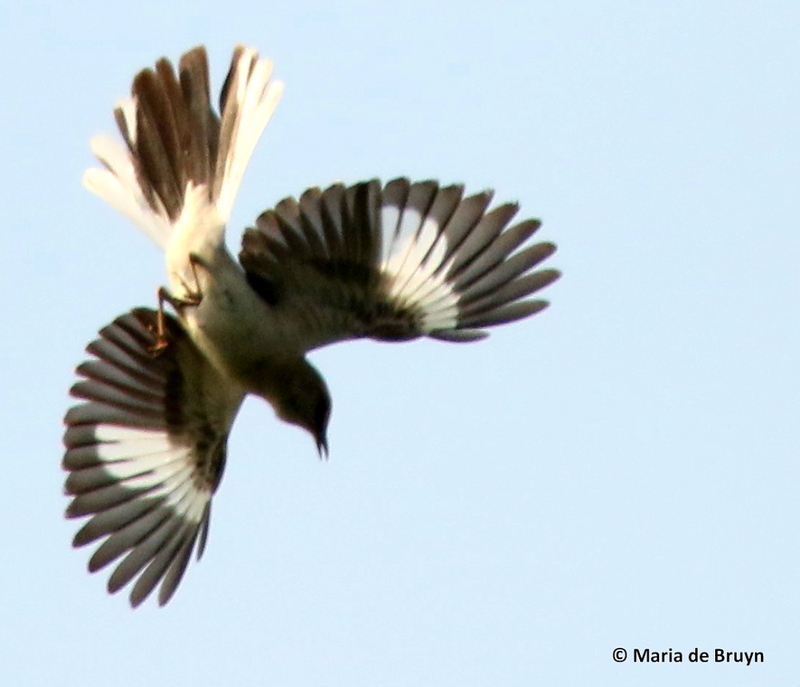 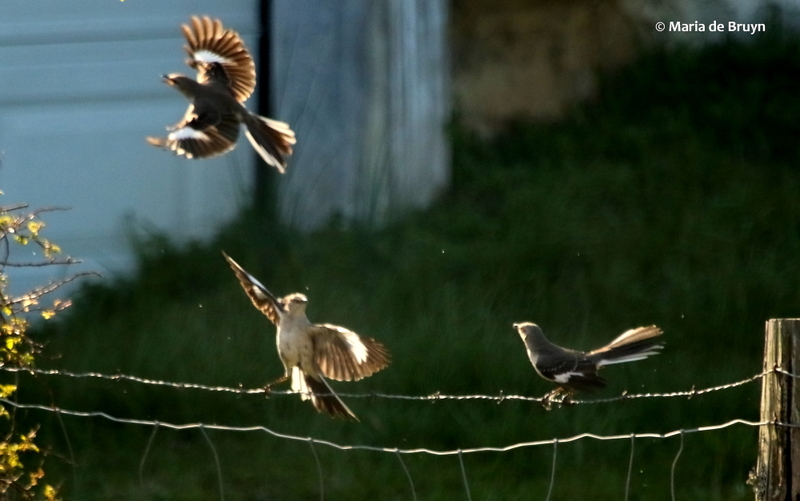 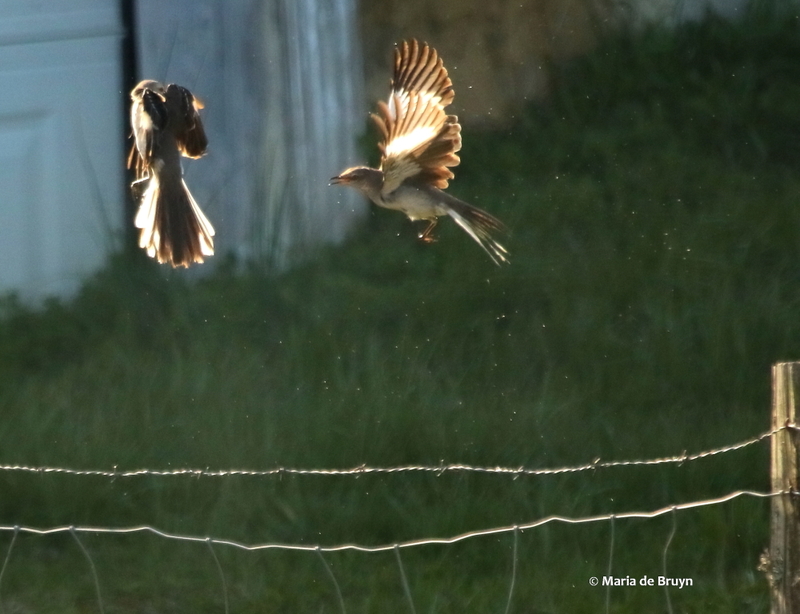 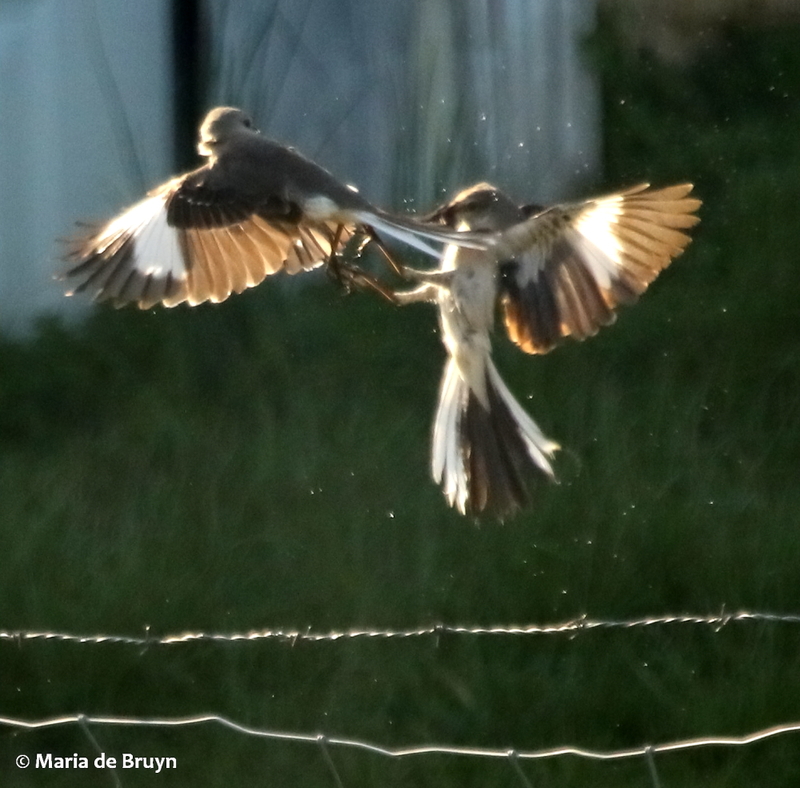 The Northern mockingbird (Mimus polyglottos) males will sing their repertoire in the spring to entice female mates – often they perch on the top of trees and fly up and down with spread wings in a beautiful display while singing. 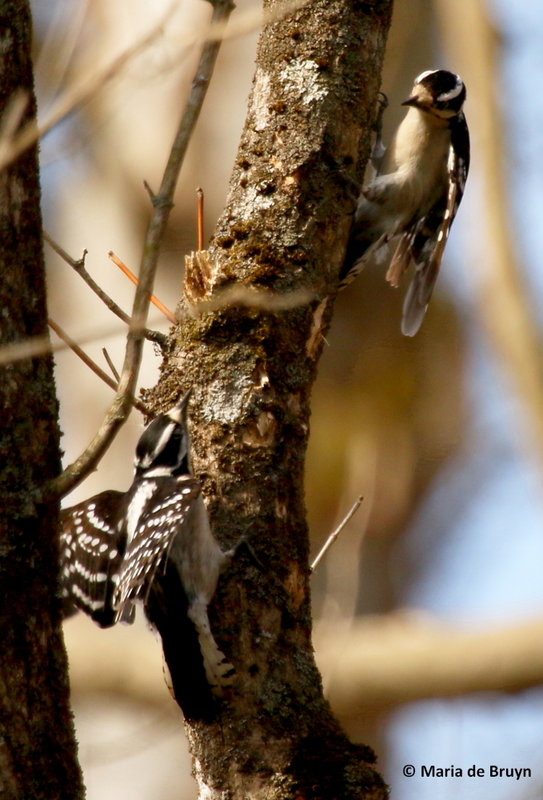 The downy woodpecker (Picoides pubescens) females and males may both flutter between trees with slow wingbeats. 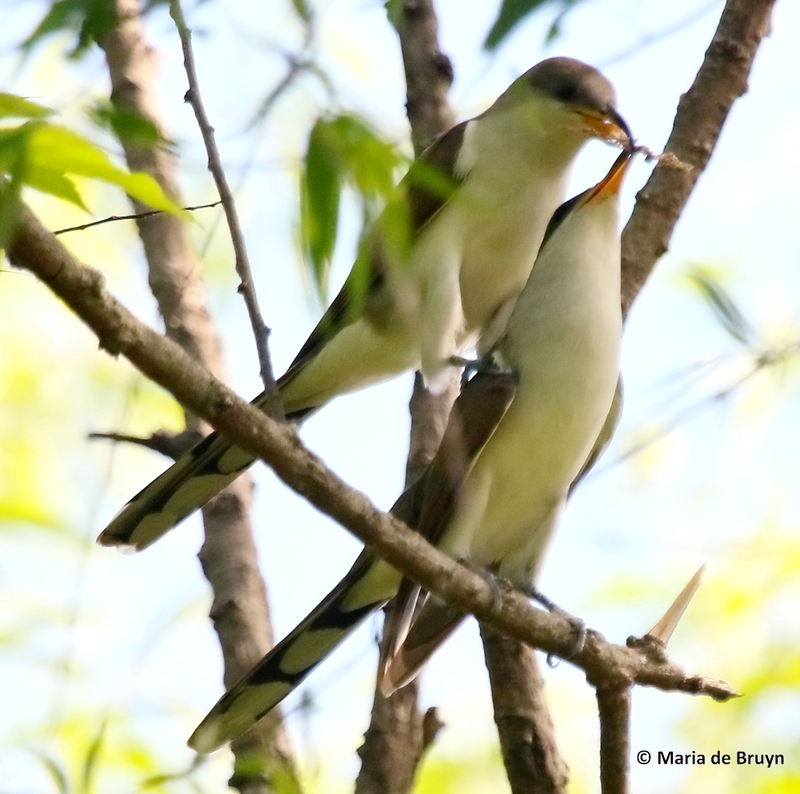 Two females may also compete for the attention of a single male, a behavior I observed this past spring and which surprised me. 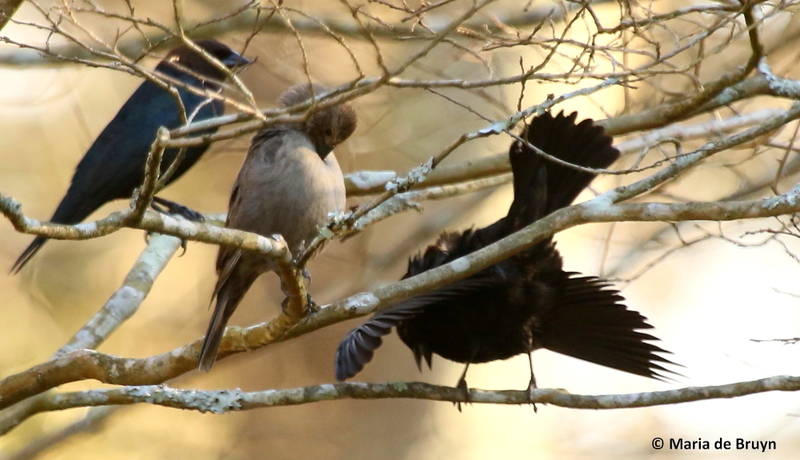 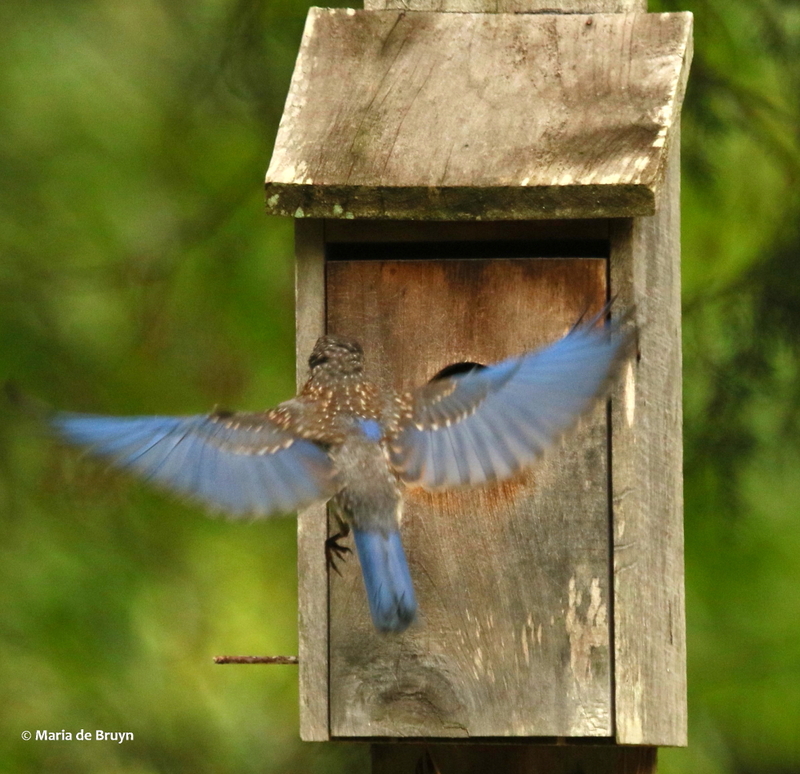 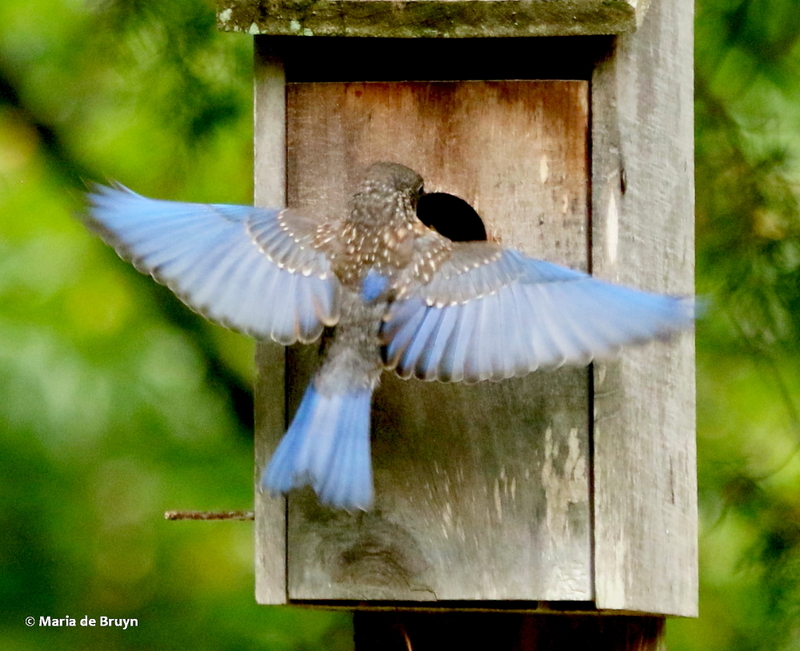 The male brown-headed cowbird (Molothrus ater) will vocalize for the female while spreading his wings in a display. 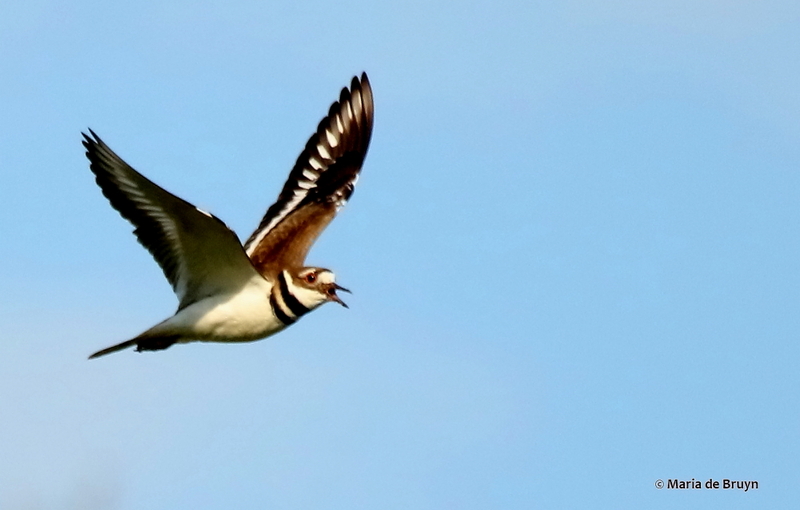 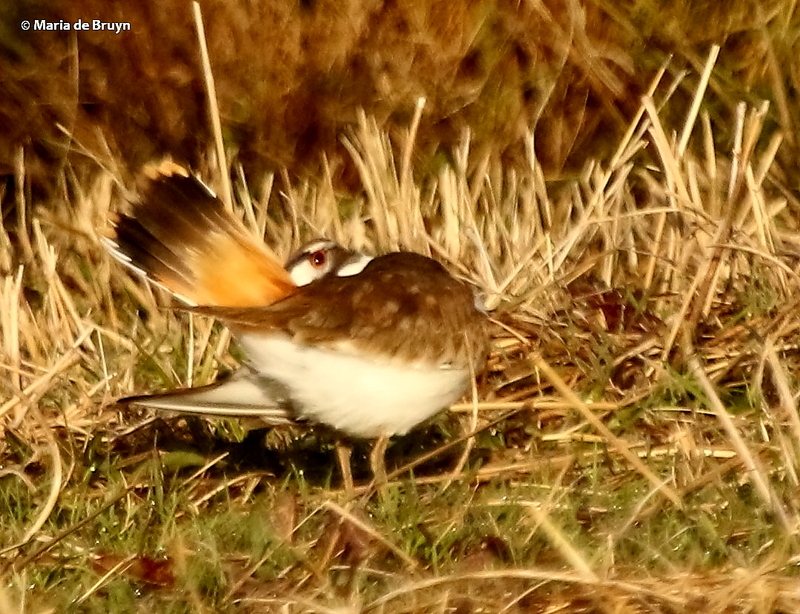 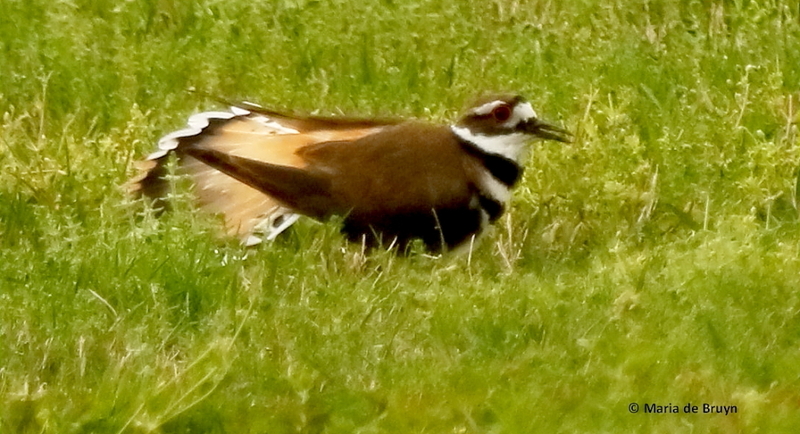 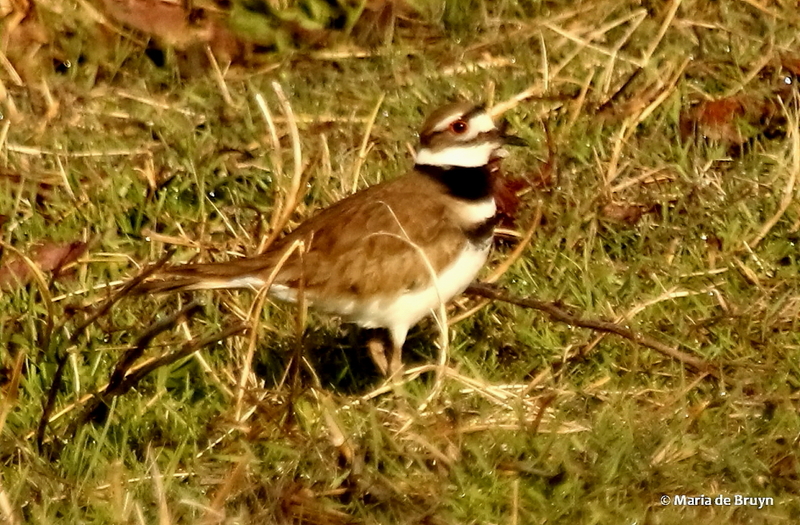 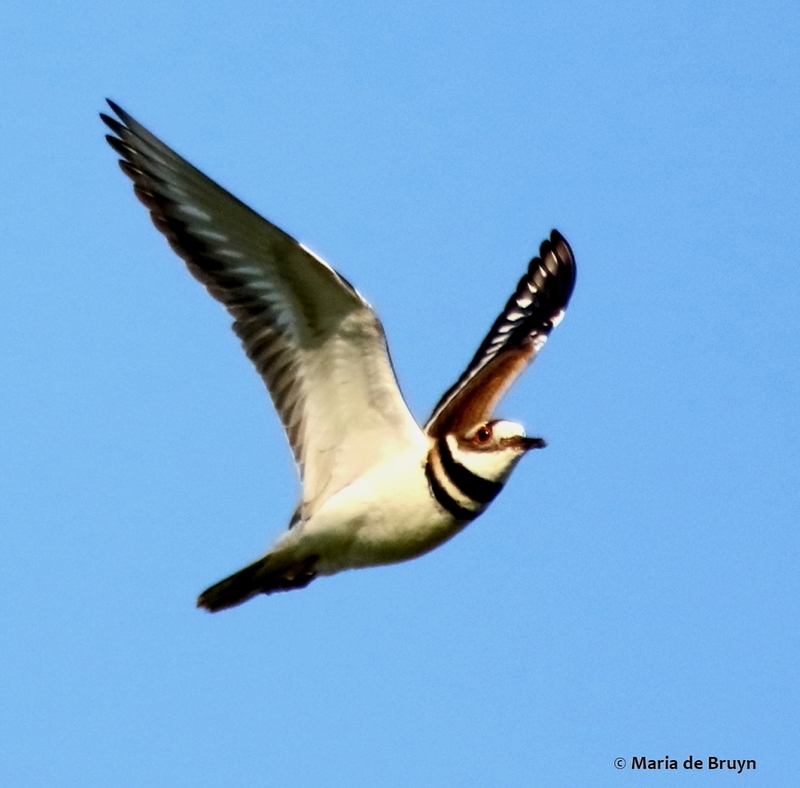 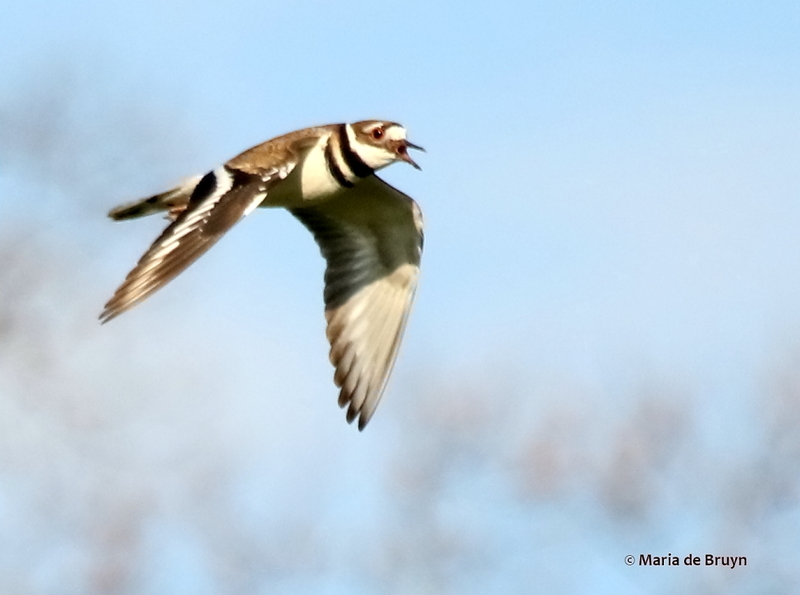 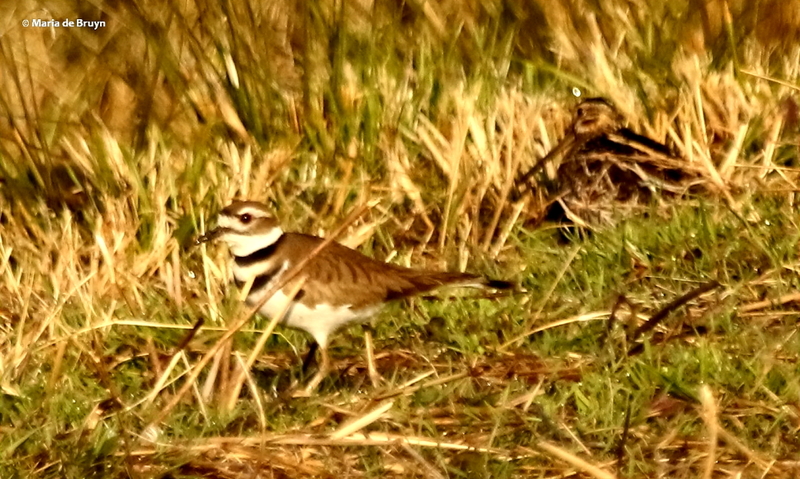 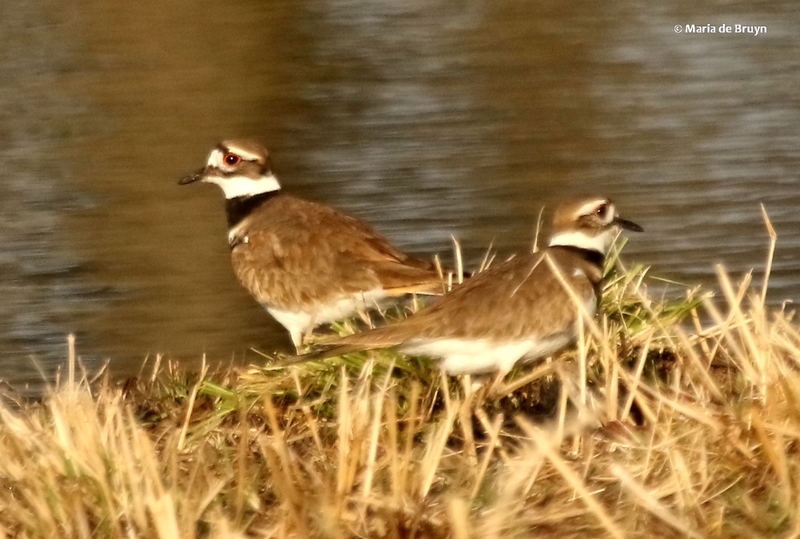 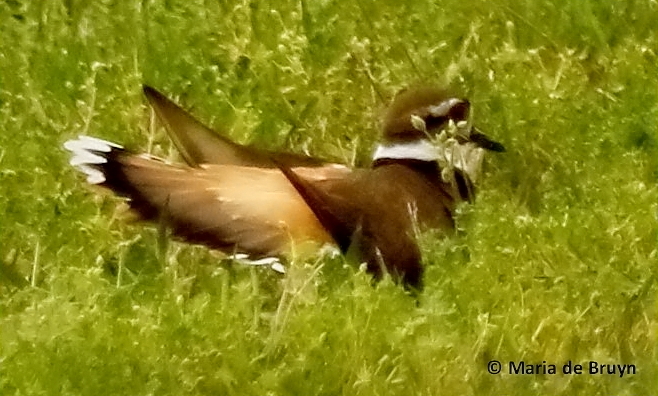 The killdeer (Charadrius vociferus) has a somewhat prettier courtship dance, bending forward and spreading its tail feathers to show off the colorful underside. 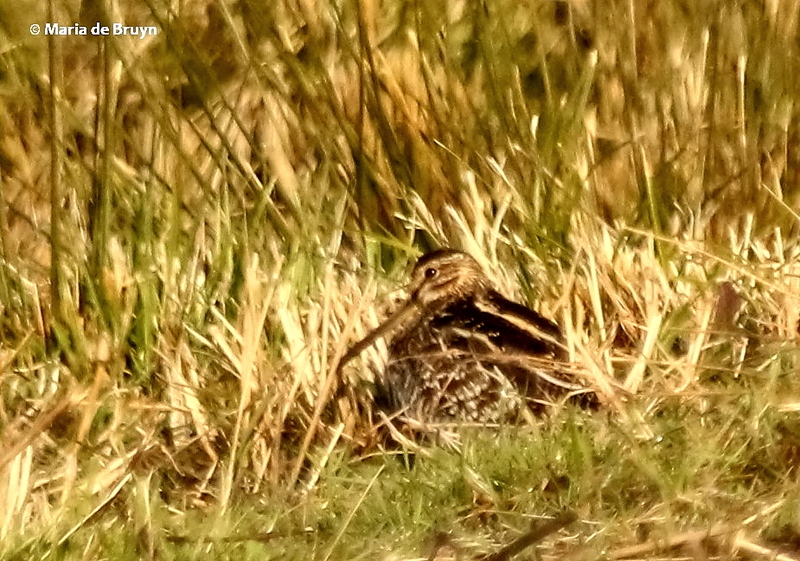 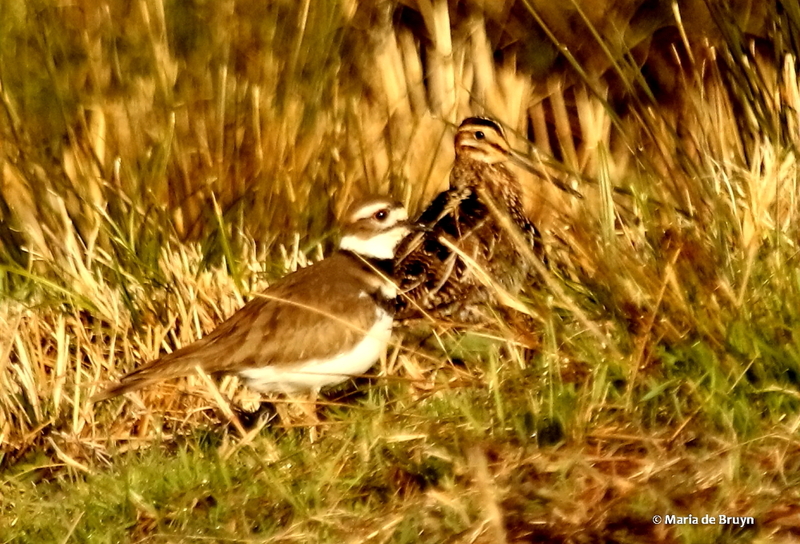 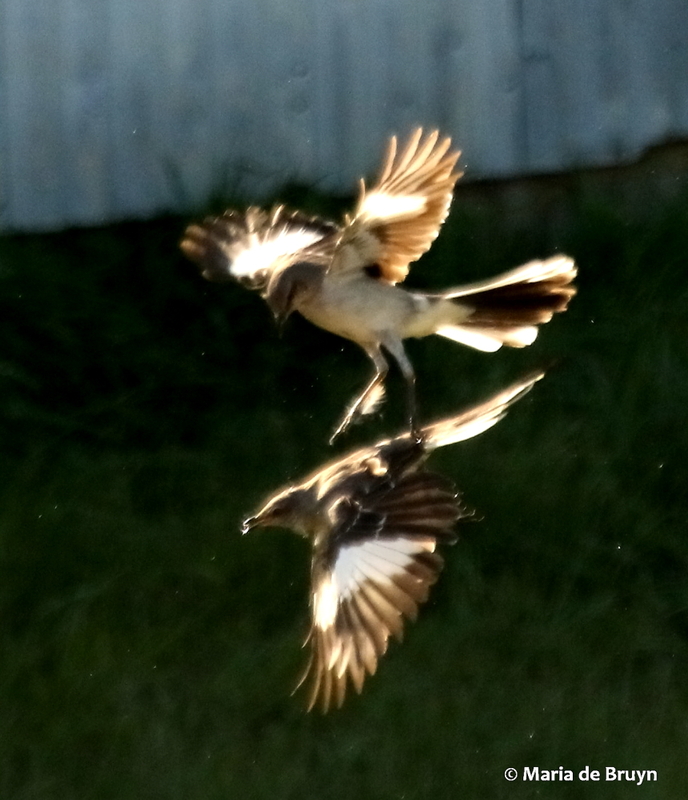 Next year, I hope to see more of the birds courting as it gives me a happy feeling.